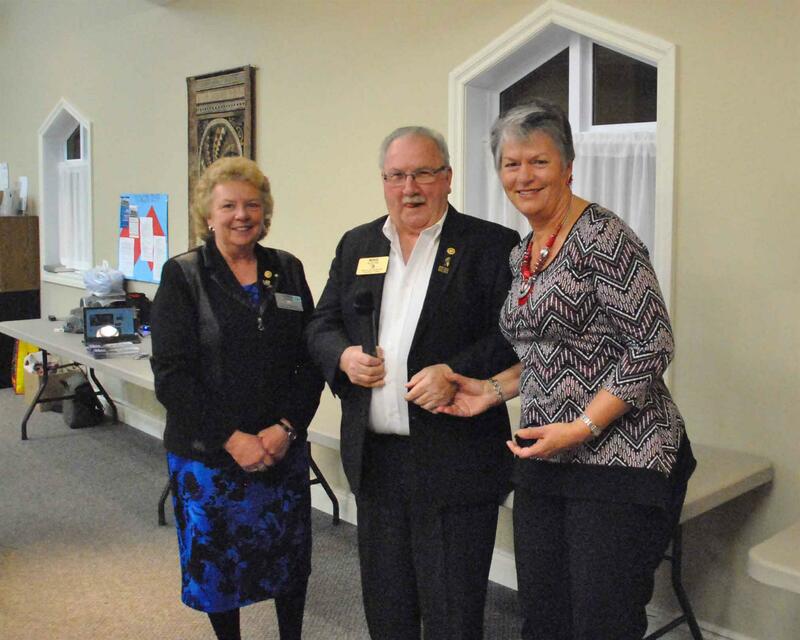 We recently had a joint meeting with the Lions club to hear a presentation by the Kemptville Youth Centre. Operations manager Barb Tobin and Programmes coordinator Maura Lepore gave our clubs an overview of the services they provide, the youth they serve as well as the resources and constraints they function with. Their presentation was well received by both clubs. Our thanks to the Lions Club for hosting us. Club members finished 2018 with a social ending and are looking forward to a well deserved break. We celebrated the Christmas season with family and friends at a well organized pot luck dinner hosted by Rotarian Donovan and his wife Jenn. Pictured below are some folks engaging in pre-meal festivities. Best wishes to all for a safe and happy holiday with those important to you! District 7040's Rotary Foundation Fellowship student sponsored by our club, Garrett Milne has sent the following update for members of the club and district. A little over two months ago I began what has been the biggest adventure of my life thus far – with one suitcase I left Ottawa, Canada on a two-day trip to Sydney, Australia. While the physical journey began in July of this year, the actual journey began in September of 2017, when I was accepted into the Master of Health Security program at the University of Sydney. Over the course of my previous studies, I had become increasingly interested in infectious diseases, particularly from an emergency management perspective. For this reason, my specialization within this program is Biodefence and Biosafety, a program like no other around the world. 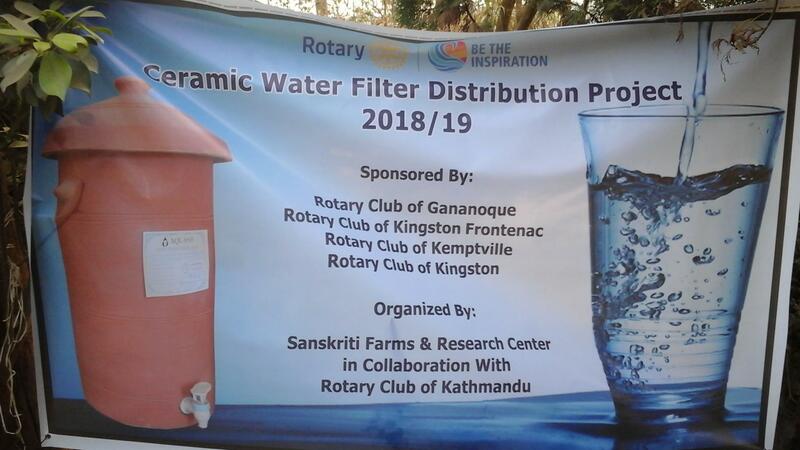 A team of Rotarians from our district, including from our club will be heading to Nepal at the end of November to deliver and help install a water filtration systems. 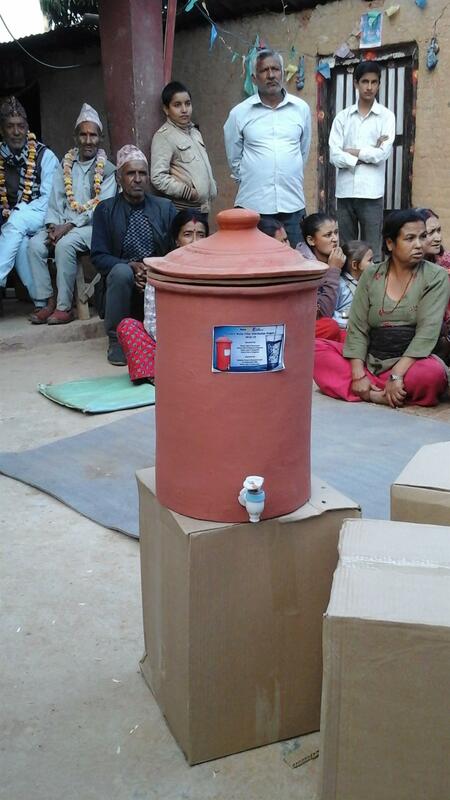 The systems will be installed in villages that have previously been set up with water collection systems. Members of the team going to Nepal explained how the systems work and how they are partnering with a rotary club in Kathmandu to ensure its success. Our club agreed to provide them with some financial assistance for the filtration systems. Pictures below are members of the outgoing team. 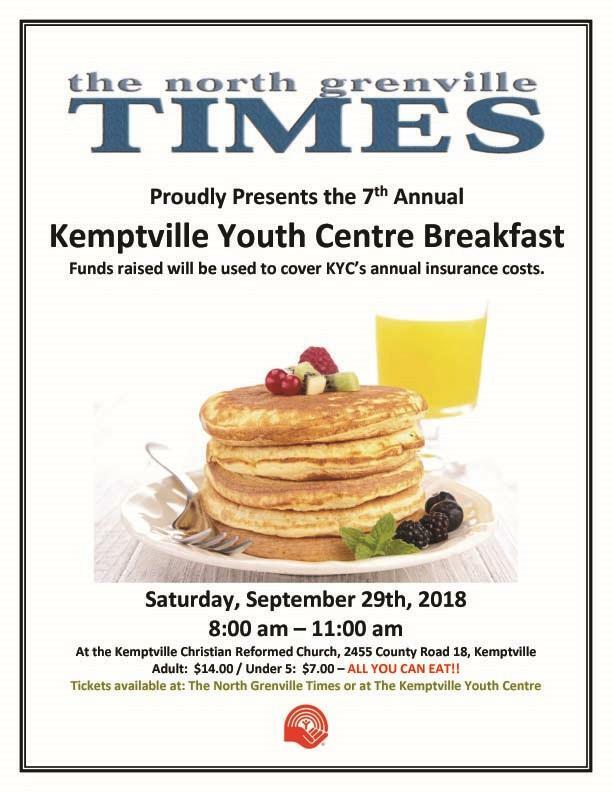 The club has been busy with administrative stuff after the summer but look forward to attending and supporting the Kemptville Youth Centre breakfast. See the poster below for details. 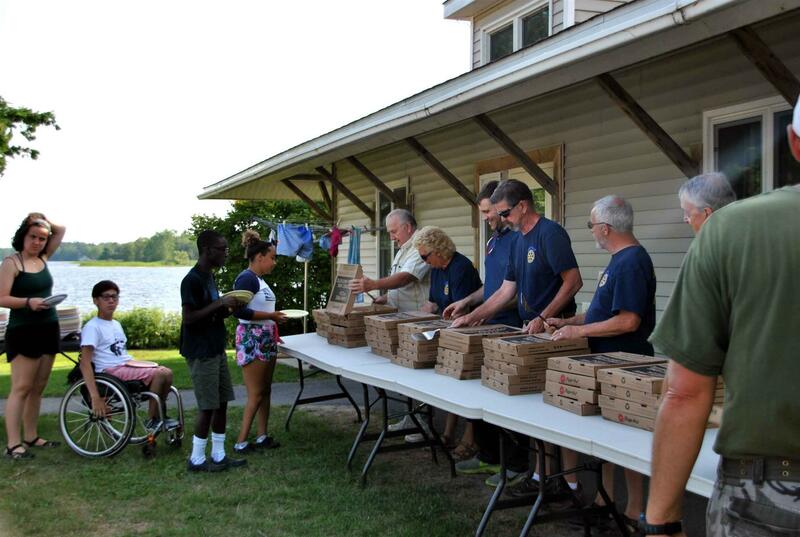 Members of the club recently hosted a pizza party for the campers and staff of Easter Seals Camp Merrywood. 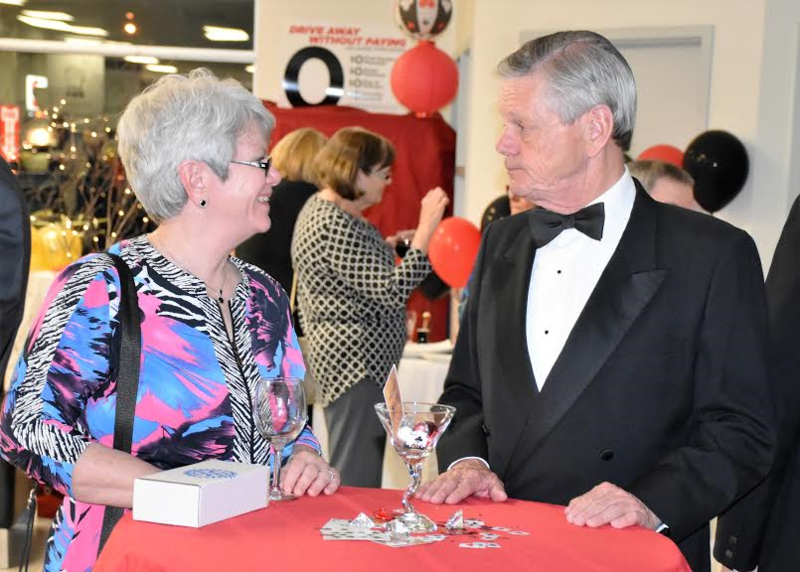 This annual event is one of the most popular with members and this year, a record was set for the numbers who enjoyed the evening. Pictured below are members of the serving like preparing to feed the hungry hoards of campers. The winning ticket number for this year's 50/50 draw at Kemptville Live was ticket number 05054. Pictured below is the crowd enjoying one of the many great acts at this year's event. This week, members of the club hosted Rotarians from D3040 in Bhopal, India. 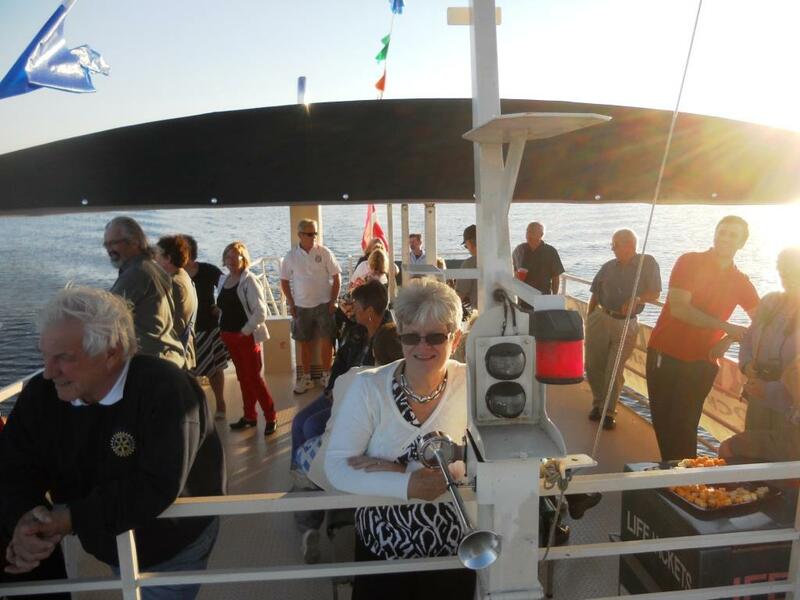 In addition to home hosting, our guests participated in a 1000 Islands boat cruise. Assembled hosts and guests are pictured below. Our meeting tonight was to celebrate with the major prize winners of the Duck Race and Decoy Challenge and share fellowship with these members of our community. The 1st place winner for the Decoy Challenge was the team from Sonography, pictured below with their winning entry. The winner of the 1st place duck was away on holidays however the winners of the 2nd and 3rd place ducks were able to join us.. Pictured below is the 2nd place winner Chris. It should be noted that the 3rd place winner, Wesley also won the 50/50 draw for the evening and returned the proceeds of both the draw and race to the club for community projects. This year's race was run in conjunction with the Navy League cadets who ran and organized the event. 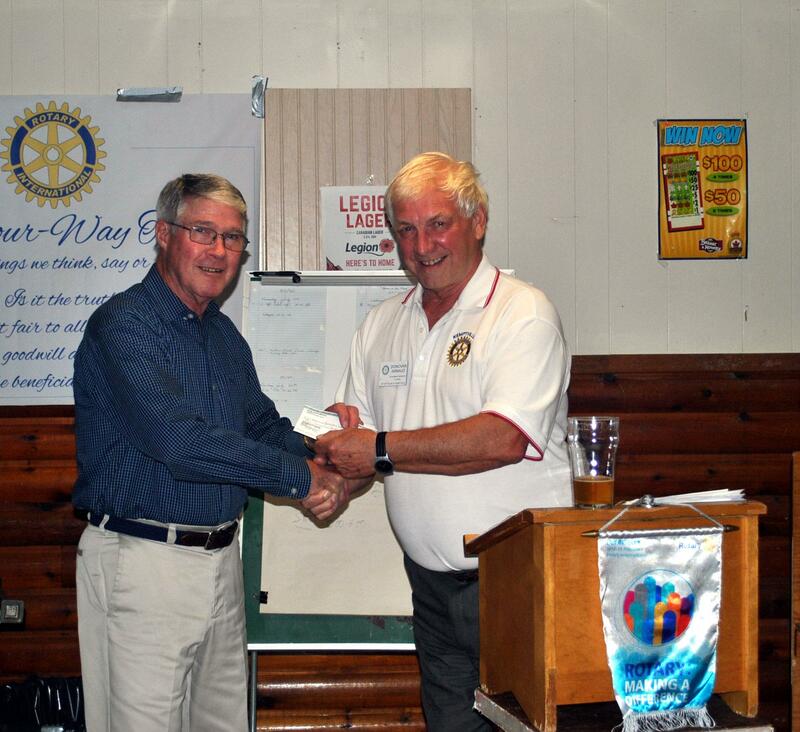 Pictured below is Navy League president Peter receiving their cheque from Rotarian Donovan. 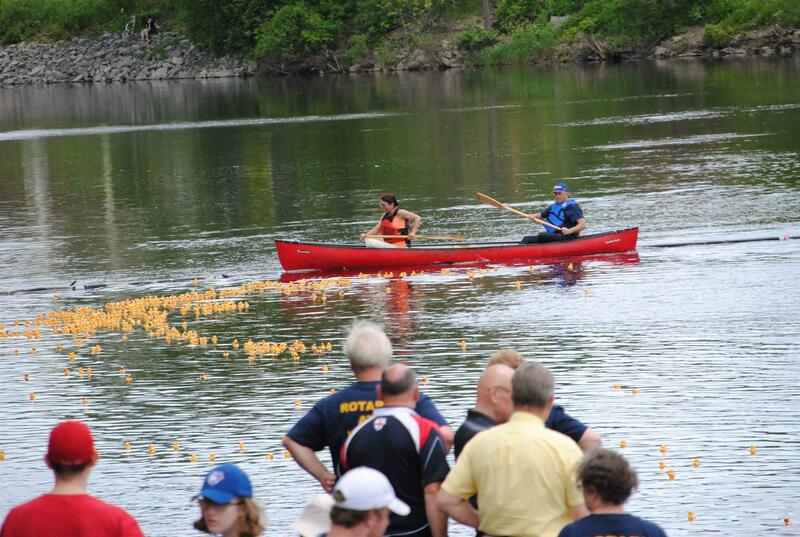 In conjunction with the Navy League Cadets, this year's version of the annual Rotary Club Duck Race was held May 27th. 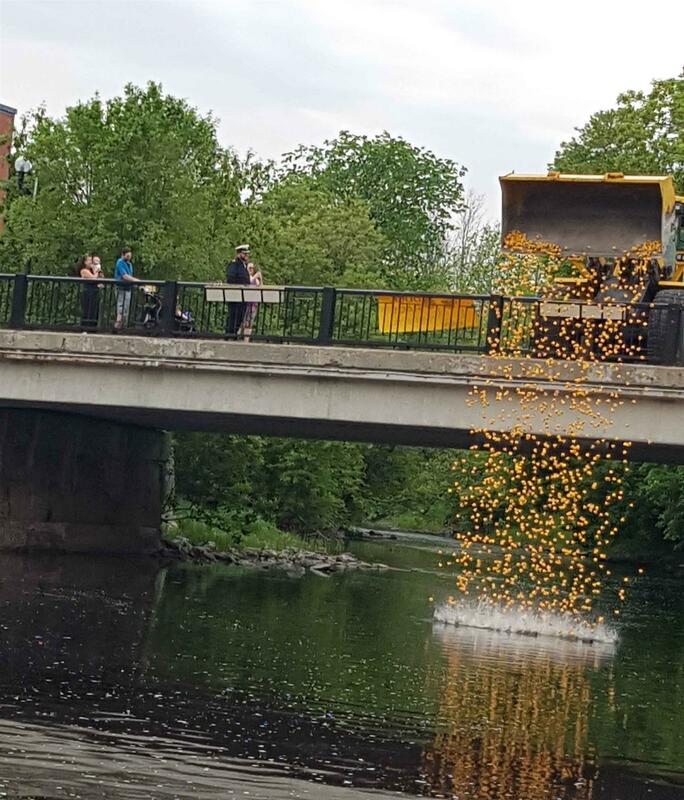 Ready and waiting, the ducks were dropped from the Prescott Street bridge into the Kemptville Creek. Once over the side, the race was on! As the current was a tad on the slow side, the recovery crew waited patiently for the racers to hit the finish line. 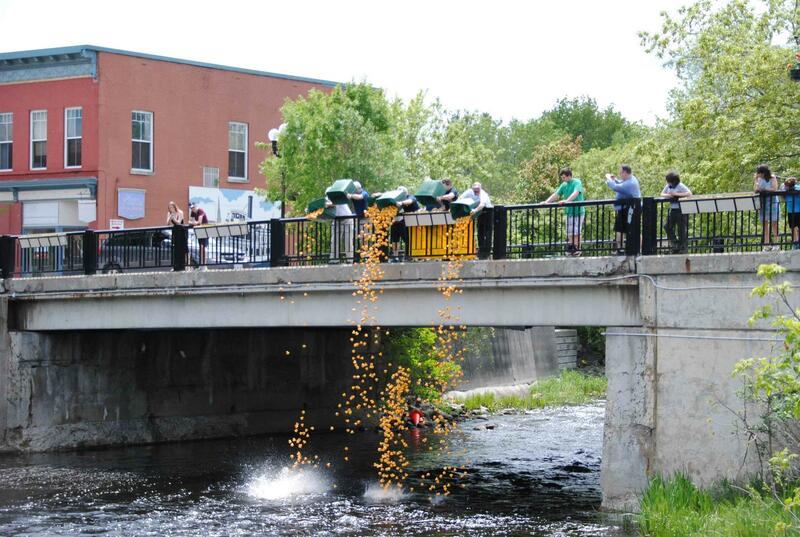 And of course, no Rotary duck race is complete without the display from the Decoy Challenge. The winning ducks were numbers: 1st #182, 2nd #749 and 3rd #1411. Thanks to everyone who supported this event. and the serving crew getting ready to roll. Approximately 85 members of the community joined us for a pasta based dinner with fixings. We often focus on the immediate and not so often on potential long term benefits of therapies. 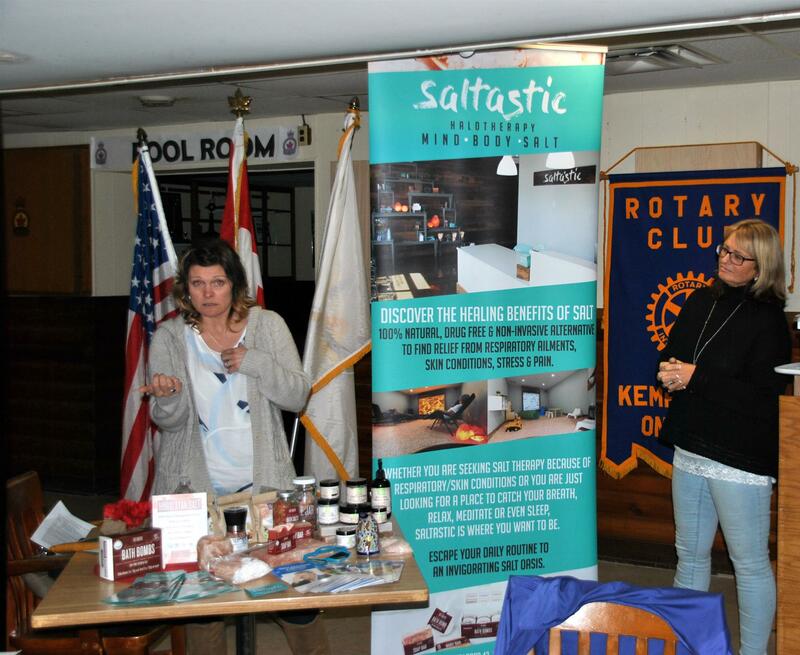 Tonight Karen and Clara of Saltasitc spoke to the club on the benefits of "salt therapy". It was a most interesting programme and well received.. Youth are one of the major focuses of our club. 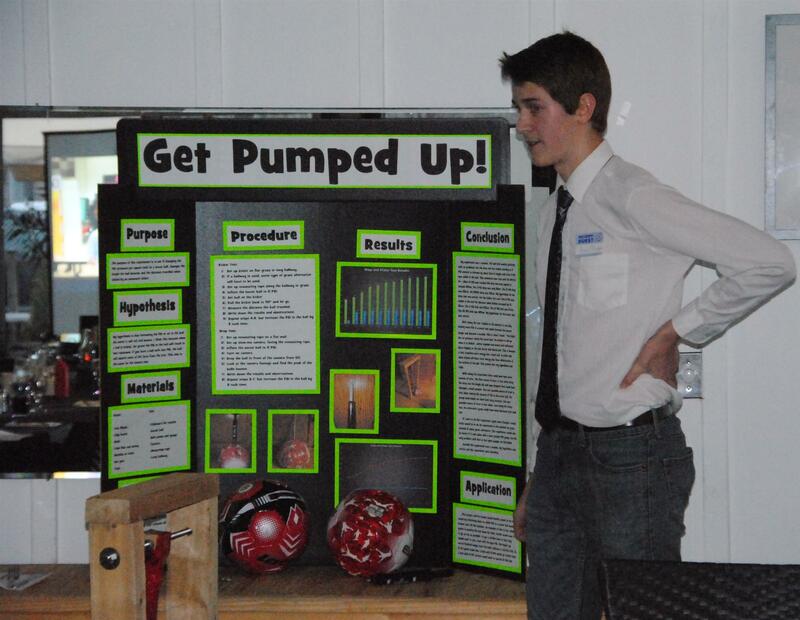 This week the annual Rotary Science Fair was held at NGDHS. 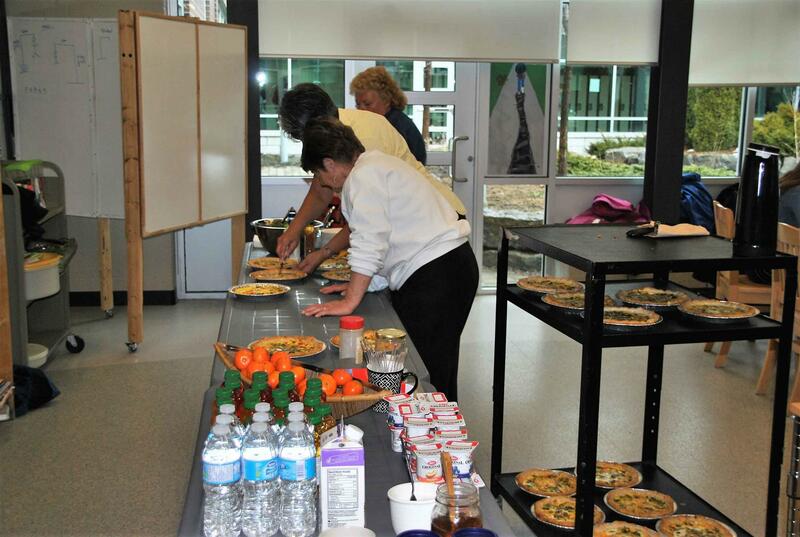 In addition to sponsoring the Fair financially, the club also feeds breakfast and lunch to the 50 or so judges who have the unenviable task of trying to determine the winners of each category and ultimately best of fair. A review of the winning project and the winner will be forthcoming in the near future. Pictured below are the club members who participated in the day as well as the Science Fair's academic advisor. Besides wanting to better their community, most people join a service club for fellowship. This past week, we shared an evening of food and friendship at Rotarian Donovan's. It provided our members with a nice break from meetings and projects and gave us a chance to sit and talk with each other in a relaxed, informal setting. A recent speaker at our club was Peter Milson. Peter is a retired naval Captain who has recently taken over as chair of the local Navy League branch. As well as discussing the cadet programme, Peter spoke of his long career in the RCN and some of the adventures he had. We had a most enjoyable evening. Our meeting this evening treated us to multiple speakers presenting an array of topics. Our first speaker was Garret Milne. Garret is a masters student in policy at Carleton University. Garret gave us background on himself, his course of studies and his future objectives. Our club is supporting him in his application for a Rotary Foundation Scholarship. Beginning in July, he will be studying for a year in Sydney, Australia. Our next speaker was Natalie Templeton, the winner of our 4-H bursary. Natalie told us of her studies at the University if Guelph and of the impact the 4-H movement had on her academic direction and her goal of eventually becoming a large animal veterinarian. 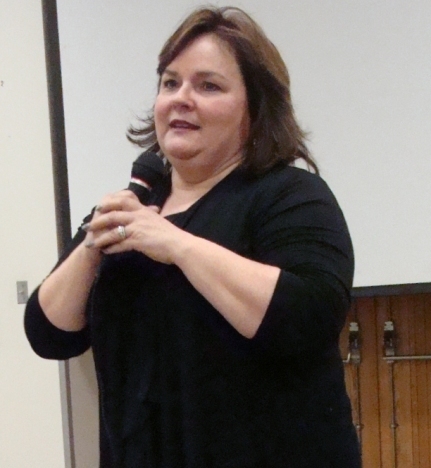 Our final speaker was Susan Smith, executive director of Kemptville and District Home Support. Susan shared with us the reason home support exists and the services they provide. She also spoke of the partnerships they have as well as how the organization is funded. This is a service which is both needed and well used in our community. The Fairy Godmother Fashion Show is to promote the over 150 dresses that we have downstairs at the KYC. These dresses can be tried on at any time by the youth in our community and they can keep them or borrow them for special events such as prom, graduation, family events, etc. The youth are the ones who will be modelling and who have done all the prep work for the event to date. 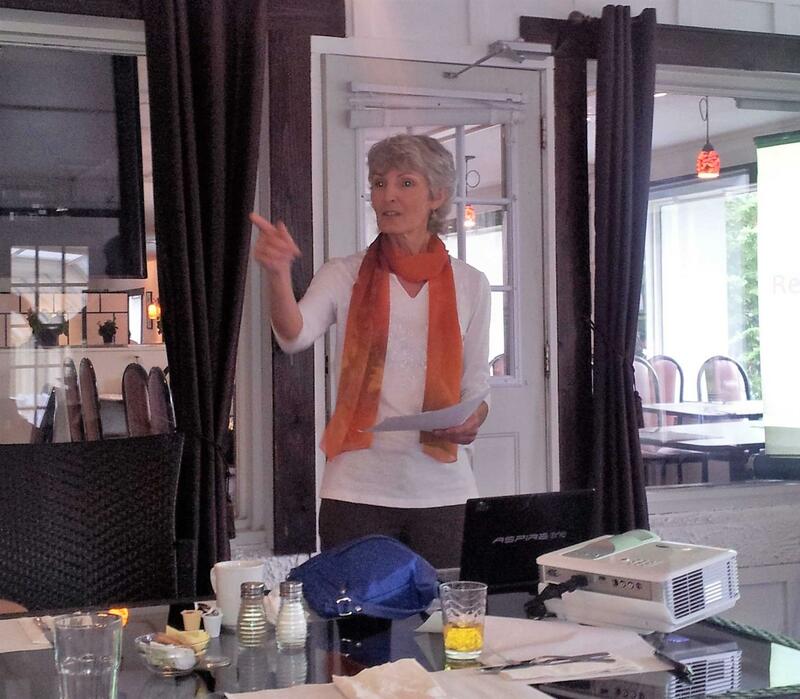 The speaker for this evening's meeting was Debbie Watt, executive director of the Beth Donovan Hospice. In her presentation, Debbie took us through the origins of Hospice in general and specifically the history of BDH. Members were surprised at the extensive services that Hospice provides to our community. She spoke in depth about some of the services offered and how there is always place for someone to volunteer - many different talents are required to ensure the hospice runs smoothly. For more information on the hospice and its services, visit http://www.bethdonovanhospice.ca . 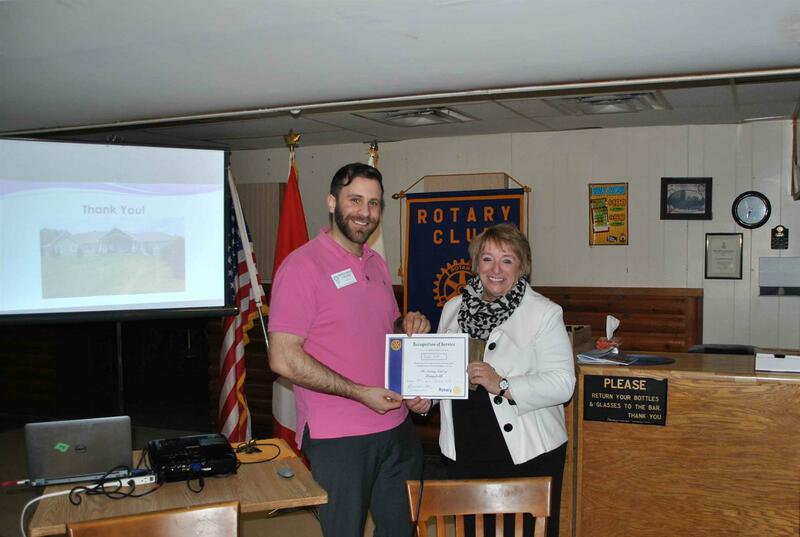 Debbie was thanked for her most interesting presentation by Rotarian Ben. Our speaker this evening was Councillor Jim Bertram. In his sometimes lighthearted presentation, Jim spoke to us about politics and politicians. 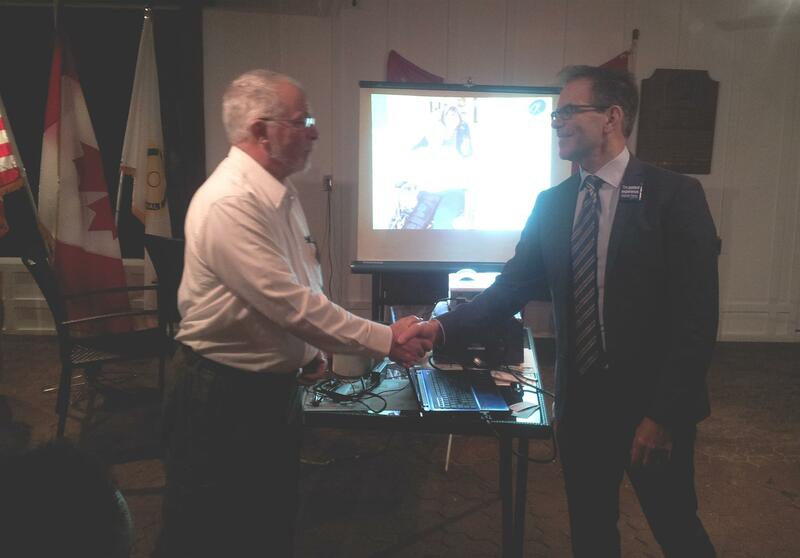 Following a lively question and answer period, Jim was thanked by Rotarian Donovan. Thanks to all who supported our cash calendar initiative this year. Without your support we would not be able to contribute to many community projects. The club held its annual Christmas party this evening. It was a time of fun and fellowship for all. Pictured below, members mingle before dinner. In recognition for her contribution to the Foundation, Rotarian Anna is presented with a Paul Harris sapphire award by ADG Mike. Tonight's speaker was Karen Bedard. 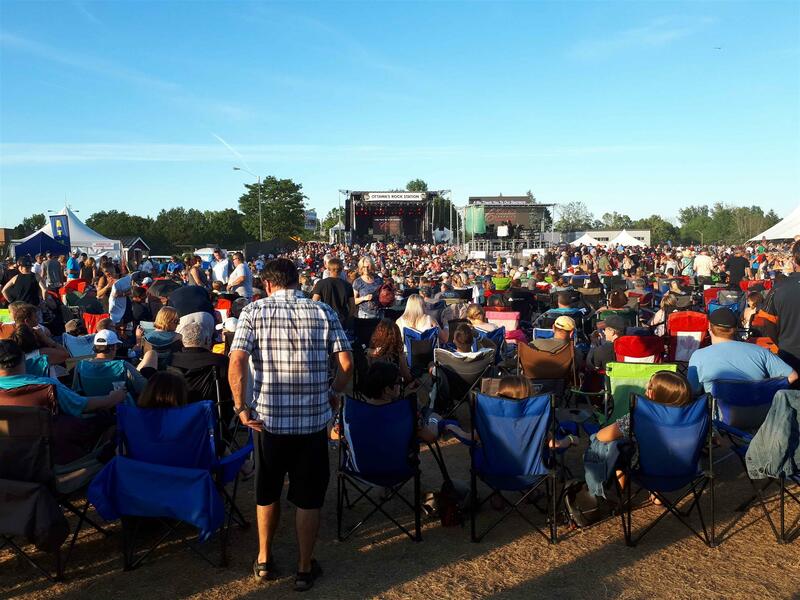 Karen works in the operations end of Kemptville Live , a music festival that has brought our community a good degree with of recognition not only from attendees but artists as well. Something that most members of our club were unaware of is the fact that the festival is a not for profit event which benefits our community. Above, Karen answers questions about the event. The old armoury, the Blake Williamson Hall in Kemptville is in the process of being refurbished for community use. 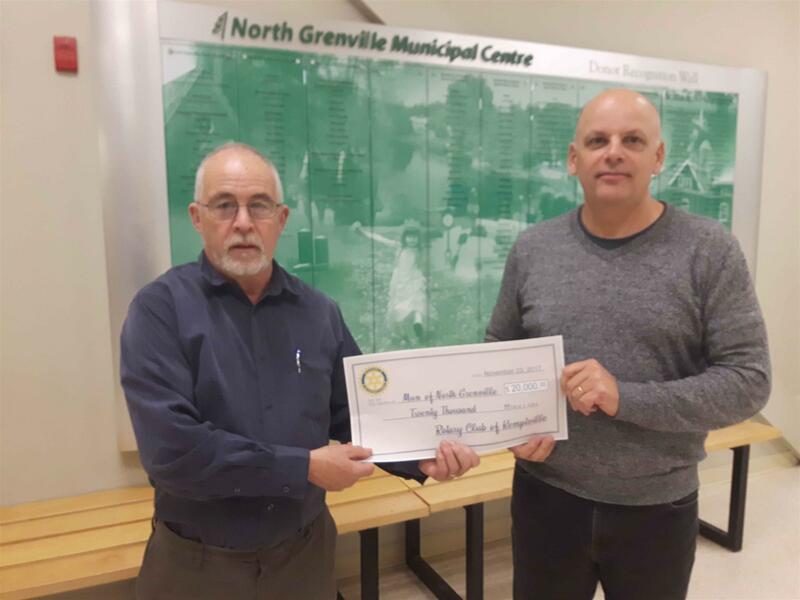 Pictured below is past-president John presenting a cheque to Mark Guy, the municipality's Director of Parks and Recreation for the furnishing of the Rolston room. This room is named in honour of the late Keith Rolston who was a veteran, Rotarian and a community minded member of this area. This past Saturday was the community's annual Santa Claus parade. Pictured on our club's float were the ghosts of Christmas Present. 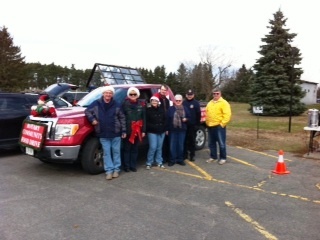 Members of the club participated along the parade route collecting food donations for the area's food banks. Santa's elves were busy tonight preparing goodie bags his visit to Kemptville this coming Saturday. We hope to see all of the good girls and boys along the parade route. Please consider bringing a canned food item to the parade in support of our local food banks. Pictured below with her husband Tom is Maretta Hay ,a recent winner of a Rotary Cash Calendar prize . The Rotary Cash Calendar is drawn daily with prizes ranging from $20.00 to $1000.00 and as a bonus, your ticket can be drawn more than once. The cost of a calendar is $20.00 and they are available from any Rotarian or at the following locations during the months of November and December: B&H Grocers, Canadian Tire, Jonsson's Independent Grocers and Rona. Calendars will also be available at St. Michael's Craft Show on November 25th between 9:00 am and 3:00 pm. Proceeds are reinvested to support international and community needs. November 11th was a crisp, sunny day. It was a day of reflection and of remembrance for those who served and sacrificed so that we could enjoy the lives we do today. We will remember them. 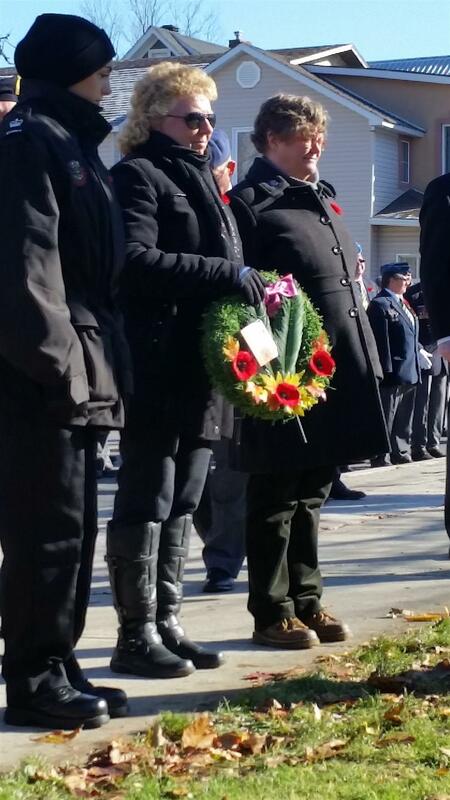 Pictured below are President Cora and President-elect Jo-Anne preparing to lay a wreath at our community's annual service. 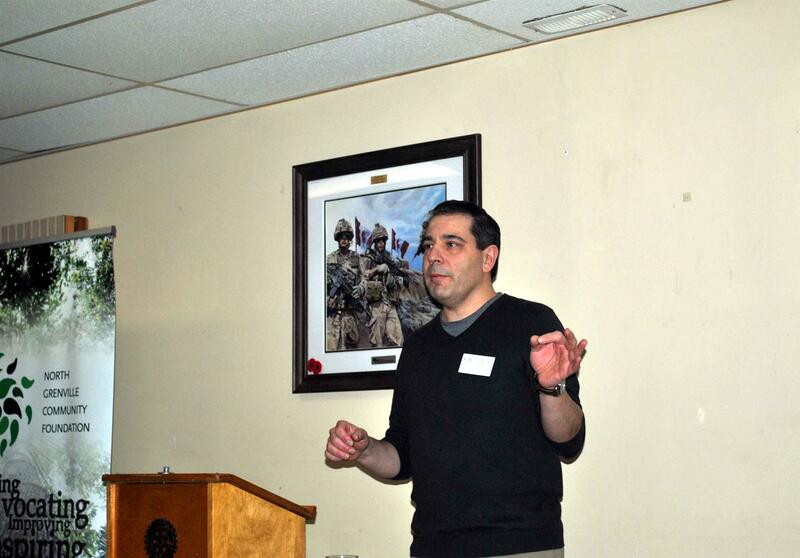 Our speaker this evening was Mike Adjeleian of L'iL Sucker - North Grenville's best kept secret. Mike shared with us his background, the profile of his business and a demonstration of the firm's product. Few members knew that we had a worldwide business located in our community. Their product is very unique, compact and definately useable. For more detail see www.LilSucker.com . No pictures tonight - camera malfunction. and the bakers finished it. Tonight our members held a "pot luck" supper and invited the parade marshal and judges in order to thank them for their help on July 1st. 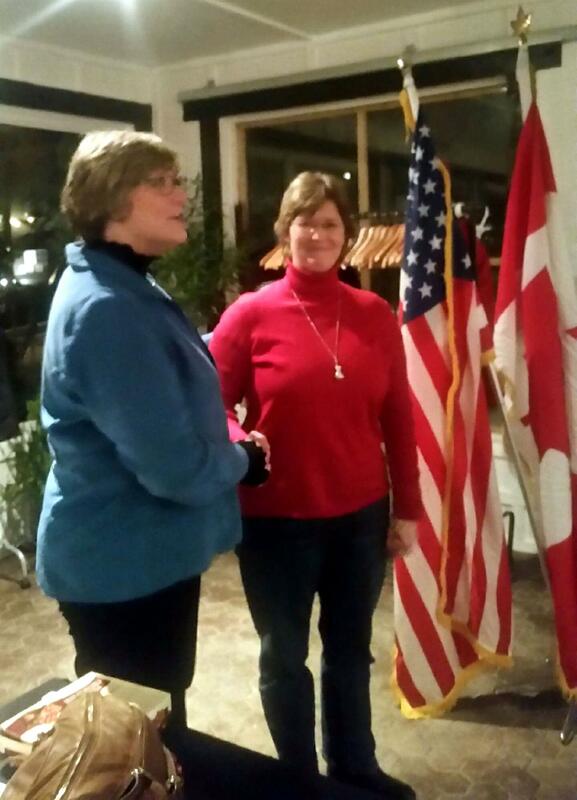 Pictured below is President-elect Joanne presenting Parade Marshall Norma with a certificate of thanks. Also thanked were judges Reinder and Maggie, pictured with P-E Joanne and Norma. Our speaker this evening was Vickie Byers from Byers Funeral Home. Vickie took the club through some of the steps of preplanning a funeral as well as the types of services that are available. There were some interesting options that most club members were not aware of. Vickie was thanked for her presentation by President Cora. 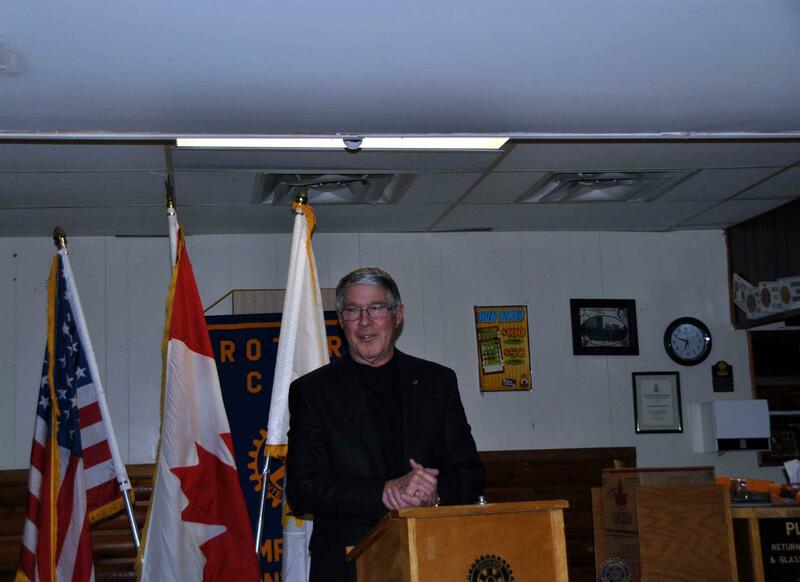 Our speaker this evening was ADG John Wilson from the Rotary Club of Renfrew. 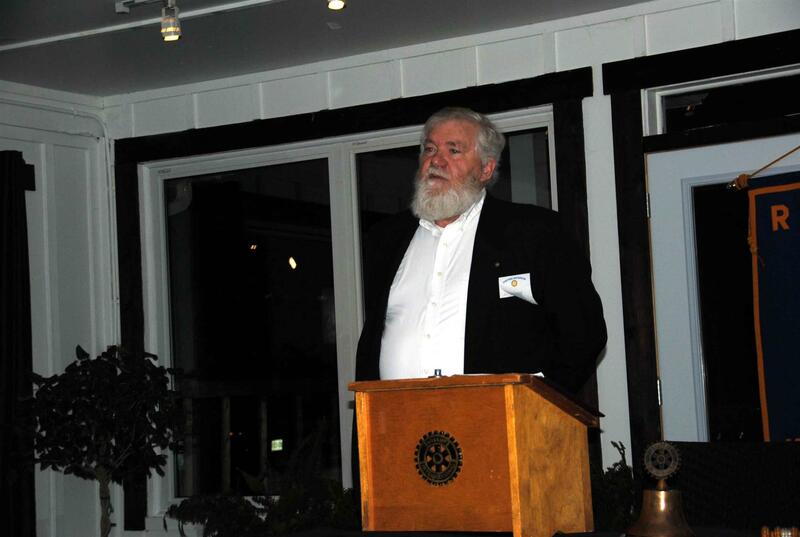 John spoke to us generally about the Rotary Foundation and specifically about Rotary's Million Dollar Dinner. Tonight's meeting was a hands on working meeting. The members of the club spent the evening preparing quiche for the House of Lazarus. Tonight's meeting was a work night for members of the club. 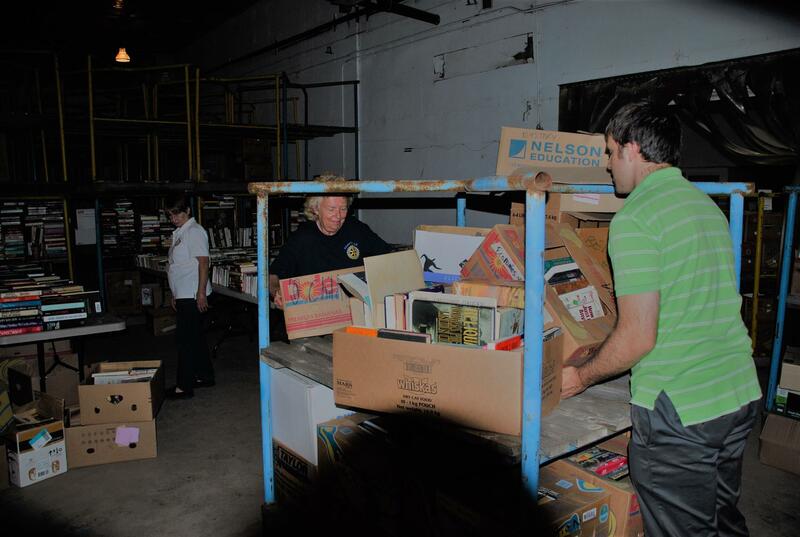 Every year we assist the Kemptville Youth Centre with their annual book fair by helping to sort the huge volume of books that are donated to the event. 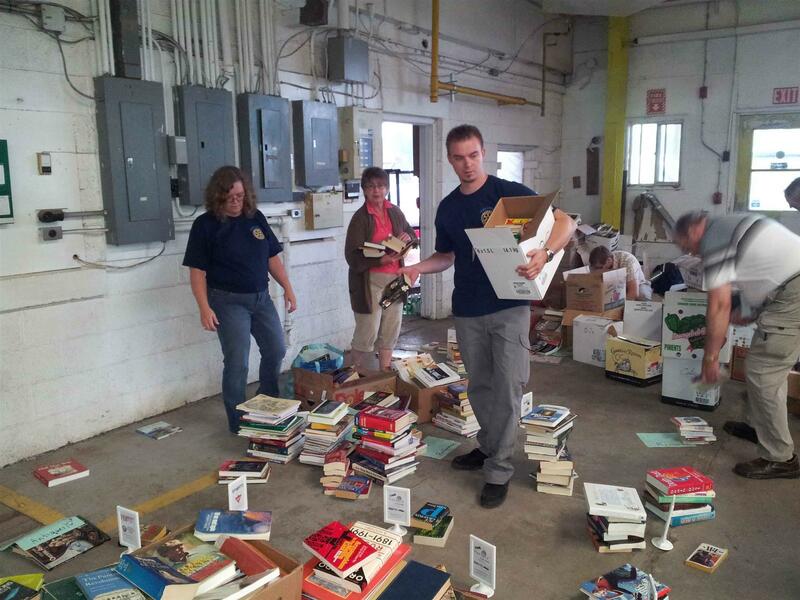 Pictured below are members of our team moving and sorting books in preparation of the event. Tonight's meeting was held in conjunction with the 4-H dairy club at the Templeton farm. 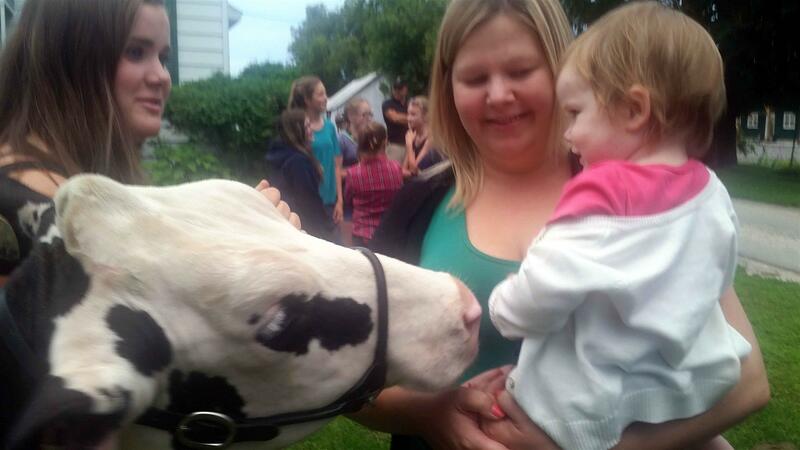 In addition to the annual corn roast, the event gave members of the club the opportunity to showcase their animals. 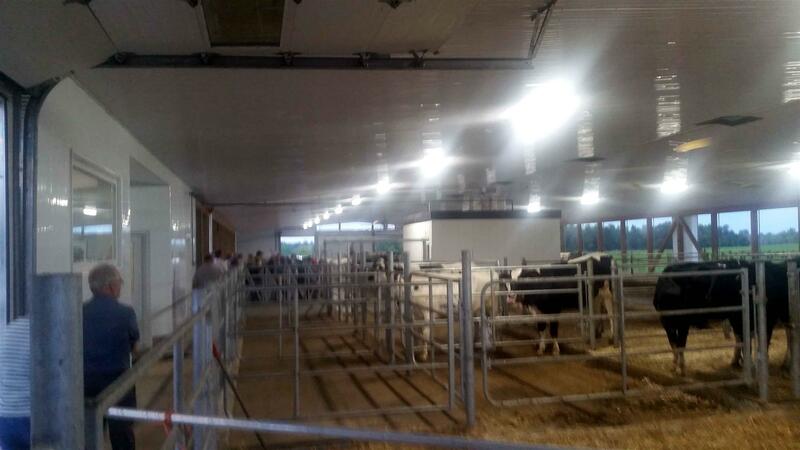 Of interest to the members was a tour of the new robotic milking system which was recently installed on the farm. With some of our members trying their hand at leading the show animals. 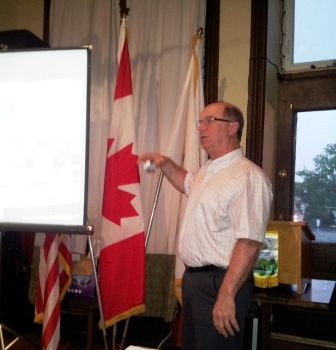 Our speaker this evening was Peter Morin from the Rotary Club of Napanee. Peter started the Africa Project by taking a 3 week trip to Tanzania soon after he retired. He met Rotarians John and Cora there in January 2011. Peter has worked with the them as technical supervisors for the programs that were running. One such project comprised of buying Chicken kits with 8 chickens and some operating equipment. To travel to the island the project is taking place on, you must take a 2 and a half hour ferry ride from the port city as well as a 1 hour motorcycle taxi ride to the village. The program lost their entire first shipment of chickens. Peter's local contact is striving to "eradicate poverty." The island's population is loosely 18,000. The island has a chronic issue with mono-cropping and as such the soil is spent. The first section of the program was to diversify the crop rotation to ensure profitability. The second program is to implement the chicken raising program. The program has a plot on the island to experiment with soil rehabilitation strategy. The local school children came to help with the planting and all monies paid to the children went towards school supplies. There are currently 3 operating groups of 6 farmers which will be the seed mentors for the others in the community. After a Q & A session, Peter was thanked for his presentation. Due to unforeseen circumstances, our meeting for August 1st is cancelled. If you have makeup time or meetings, please advise Ben. Our guest this evening was our new District Governor, Sue Bellor. 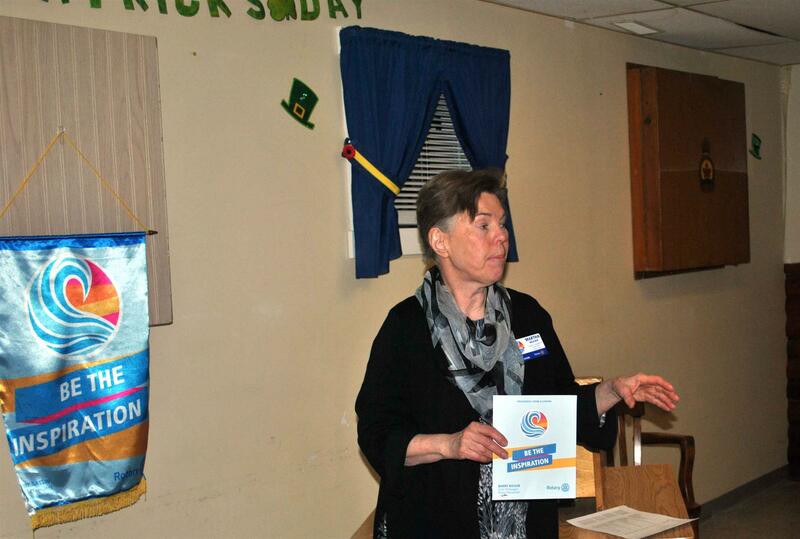 In her message, DG Sue shared with some of RI's and district goals for the upcoming year. It was also an evening for welcome and recognition. Below, Reinder is welcomed as the newest member of our club. 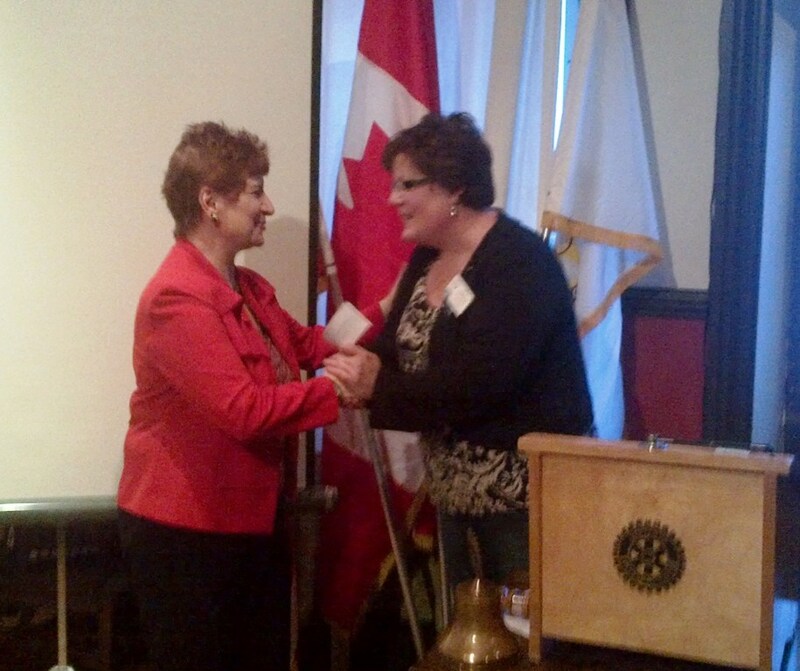 President-elect Jo-Anne receives her pin from President Cora. Paul Harris Fellow are presented to Rotarians John and Cora. 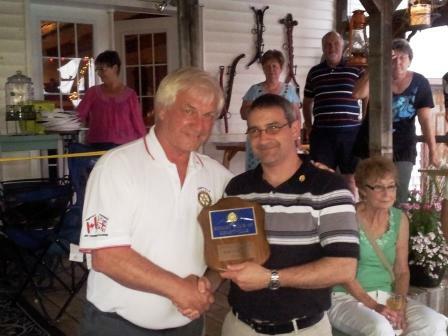 Rotarian Serge is honoured with a special presentation. 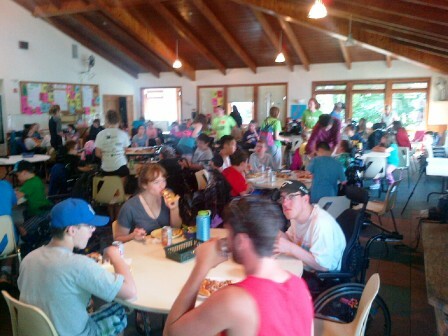 Tonight was one of the club's favourite meetings of the year, our annual pizza party for the campers and staff of Easter Seals Camp Merrywood. Pictured below is the food line with serving Rotarians on one side and happy campers on the other. Once everyone went through the line, supper was enjoyed in the evening sun - something more than welcome this summer. The last two weeks have been busy ones for the club. After weeks of preparation, the Canada Day parade went ahead on July 1st without rain this year. 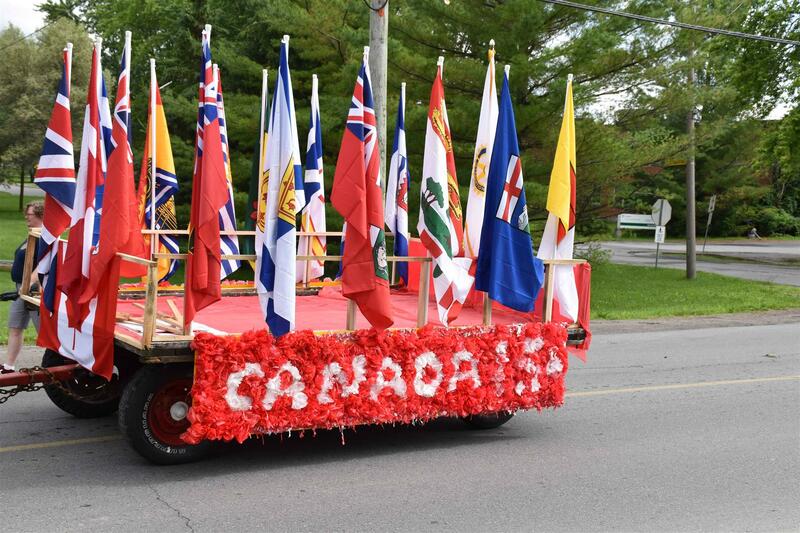 As is befitting, a float with the flags of all the provinces and territories presented the country from sea, to sea, to sea. 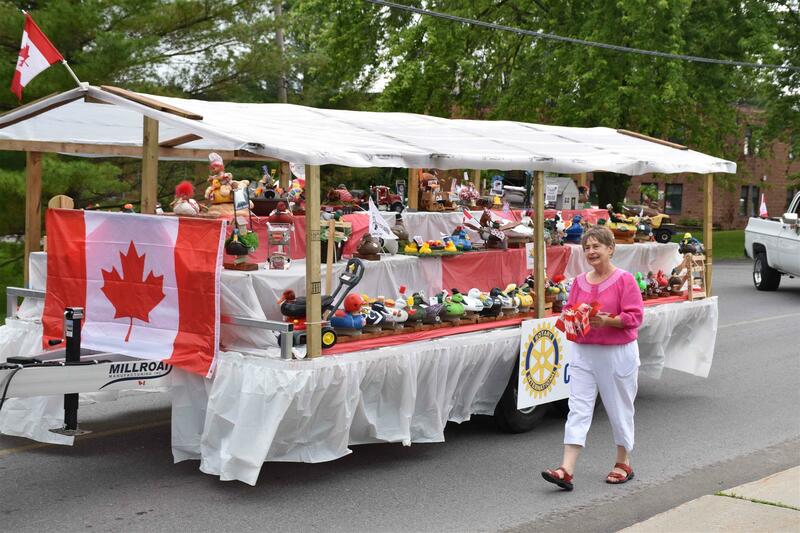 Below Rotarian Norma marches with the float displaying all of the entrants to the Rotary Duck & Decoy race. This was a good opportunity to once again showcase the efforts of our local businesses and community partners. And nothing says summer like sun and a BBQ. 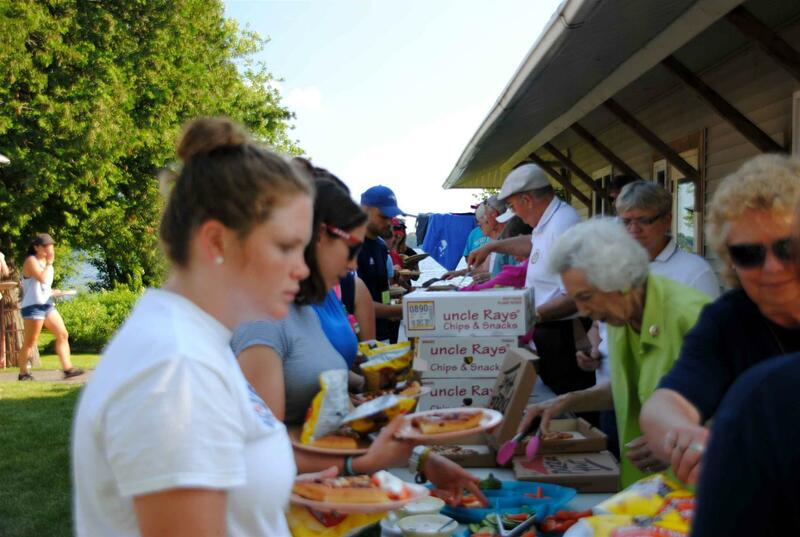 Club members provide nourishment to the festivity goers. The following Tuesday we had our club changeover of officers at Blue Gypsy Winery. 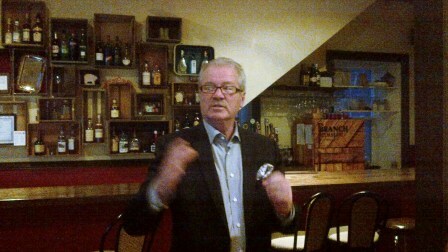 Proprietor Louis Gaal gave members an overview of his products and a tasting. Finally President-elect Jo-Anne took the oath of office to conclude our meeting. Our meeting on the 11th was at the Swords & Ploughshares' Museum. Major Mike Calnan explained the collection and showed us what was inside. Unfortunately the outside portion of the programme was cancelled due to the typhoon. 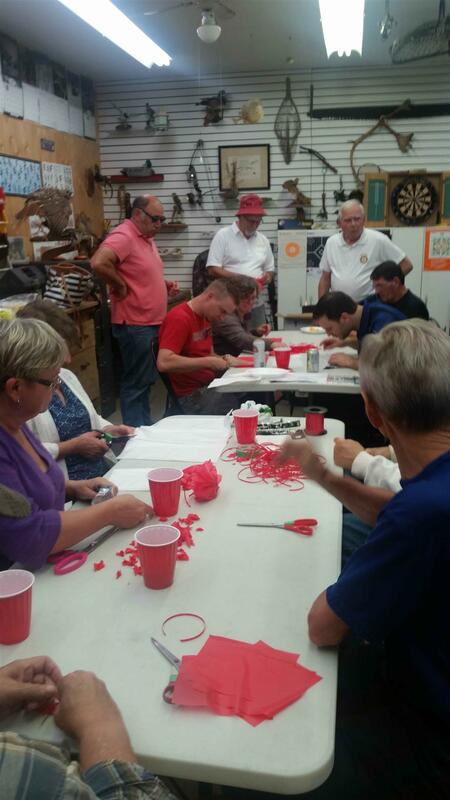 Members of the club have spent the last two weeks preparing our float for the Canada Day parade. HAPPY 150TH BIRTHDAY CANADA! We hope everyone enjoys the festivities. 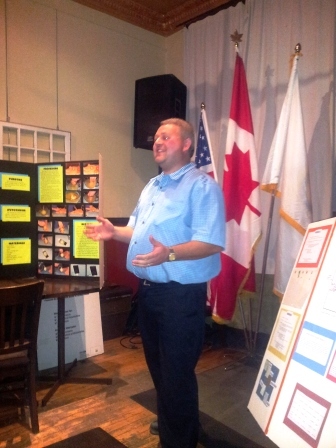 Our speaker this evening was Dr. David Shanahan from the North Grenville Historical Society. David spoke to us about the importance of knowing where you are from, that is the sense of knowing the community you belong to and how it got there. He shared with us the evolution of the society, the ties it has with other organizations and the ongoing direction it is taking. 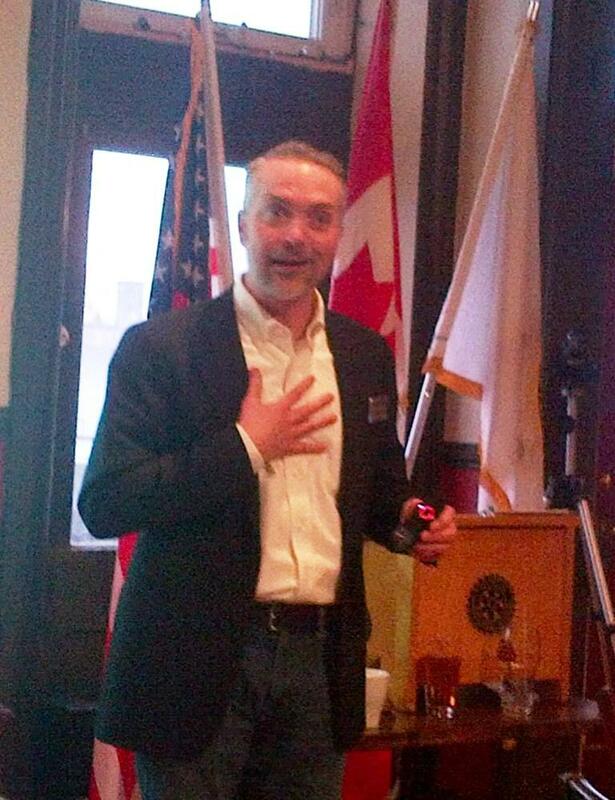 After a Q & A, David was thanked for a most interesting presentation by Rotarian Mark. There was a difference of just one vote between the two winners. 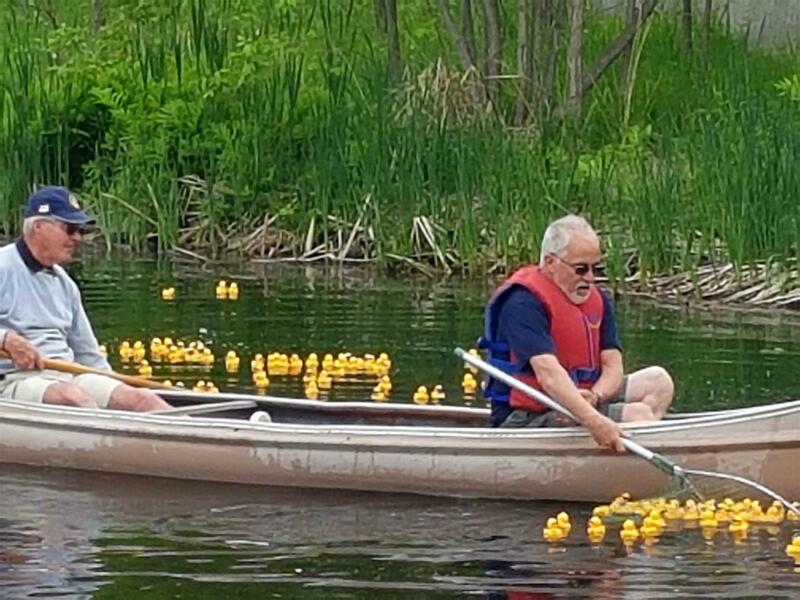 This was followed by a presentation of thanks to Dave Blue of Hudson's Autobody who has been a multi-year sponsor of our annual duck race. After the presentation to Dave, a presentation was made to Rob, the husband of winner Karen who had the fastest duck in the race. Our speakers this evening were the Library Sues, Chief Librarian Sue Higgins and programme specialist Sue Bergeron. Sue H took us through a youth literacy programme that is county wide which focuses on reading for young children. 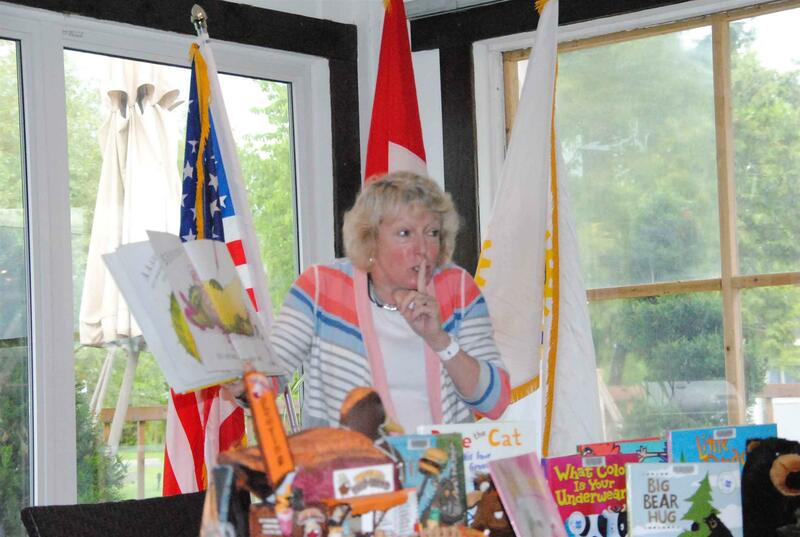 This was followed by "Library Sue" reading the members a story. It was a wonderful thing to hear for both a child and someone a generation or two away. 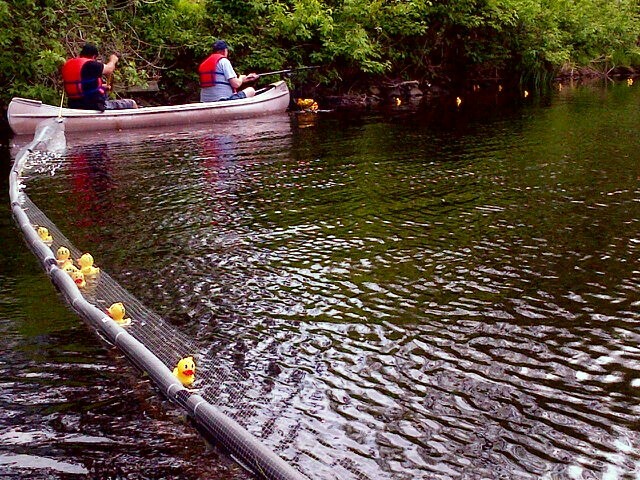 Sunday was a gorgeous day for our annual duck race. People were out in Olde Town, patios were full as was Rotary Park to witness this year's running of the ducks. 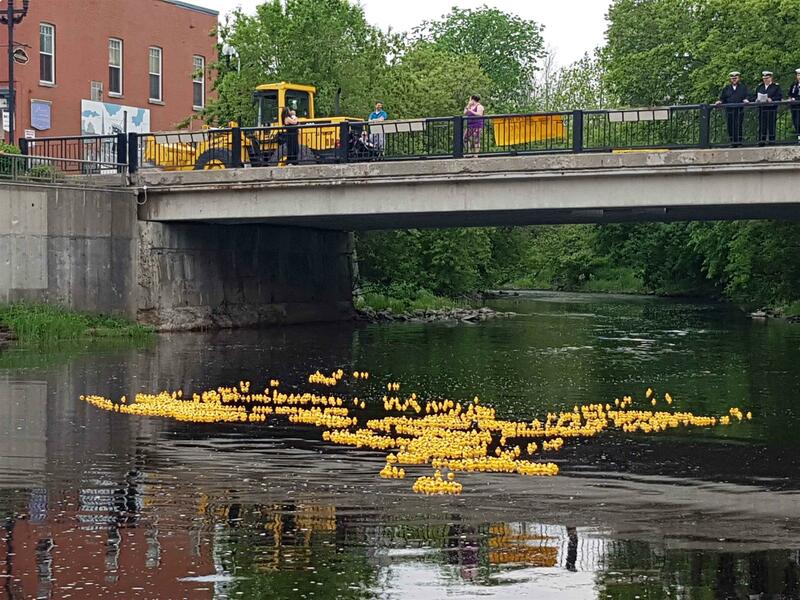 Above the ducks are launched from the Prescott Street bridge. Our outriders chase the winners. Rotarian Wayne updated us tonight with some of the devastation he witnessed while working with the Ottawa Public Health Unit at Constance Bay. He went through some of the things the Unit did at the floods onset as well as what happened and the assistance that was given as the waters receded. He brought what we saw on the media to a personal level. 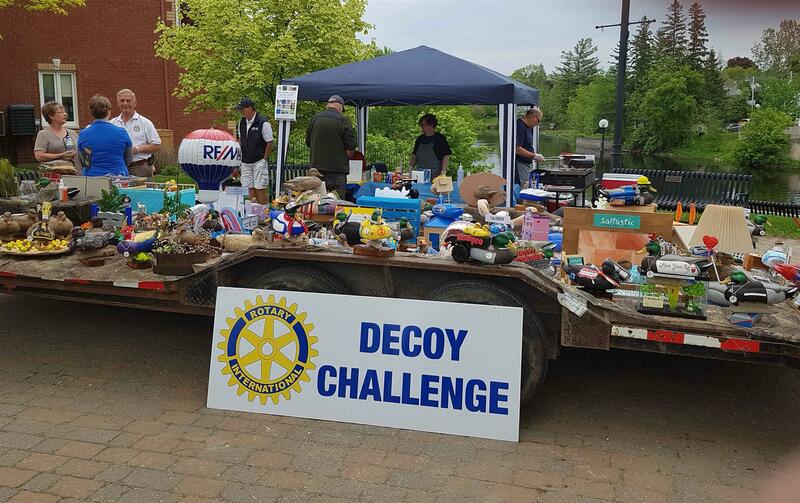 In conjunction with its annual duck race being held on Sunday May 28th,the Rotary Club of Kemptville is currently conducting its Third Annual Business Decoy Decorating Event. 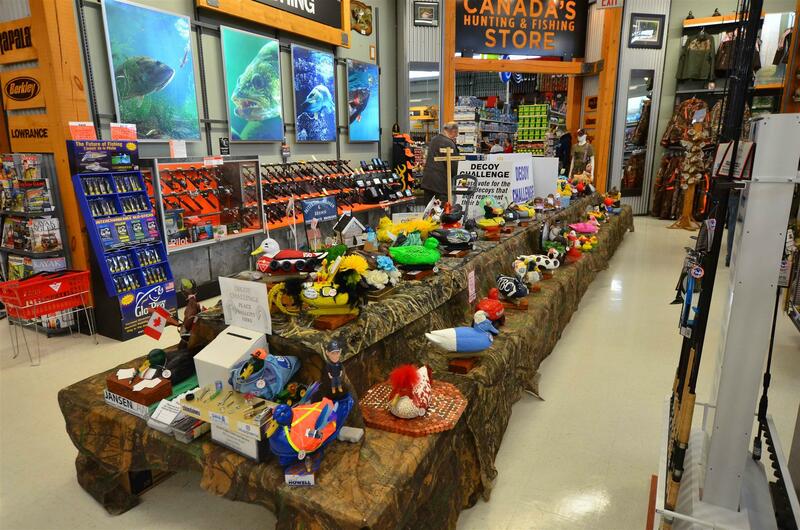 Submissions from local businesses has been fantastic and we are inviting the public to view and vote for their favorite decorated duck decoy! 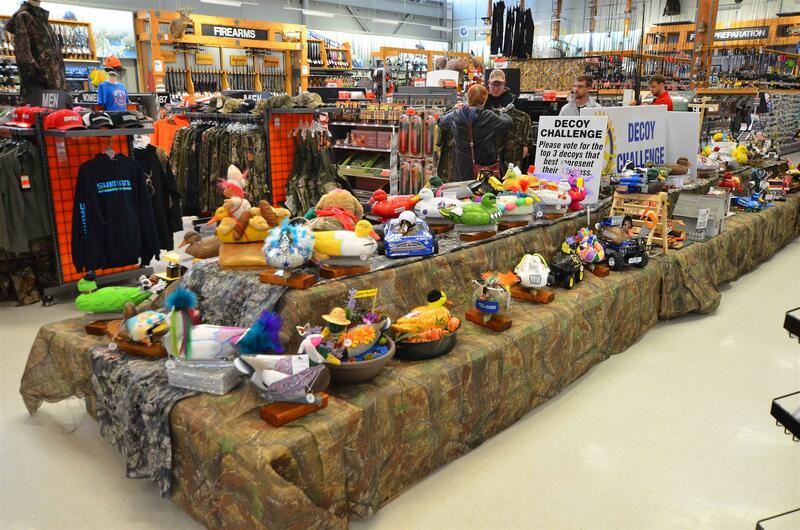 The decoys will be on display at Canada’s Hunting and Fishing Store located at our local Canadian Tire Store between May 12 to 23, 2017. Votes will be tallied and winner selection will take place on May 26. 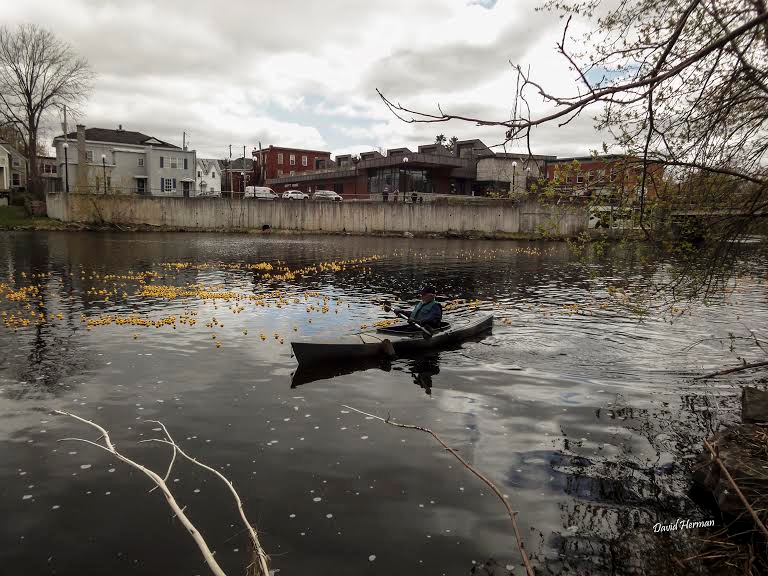 The winner will be announced at the Annual Rotary Duck Race on May 28, 2017 where the decoys will be on display. The duck decoys will also be in the Rotary Canada Day parade, July 1, 2017. Photos of some of these great creations are shown below. 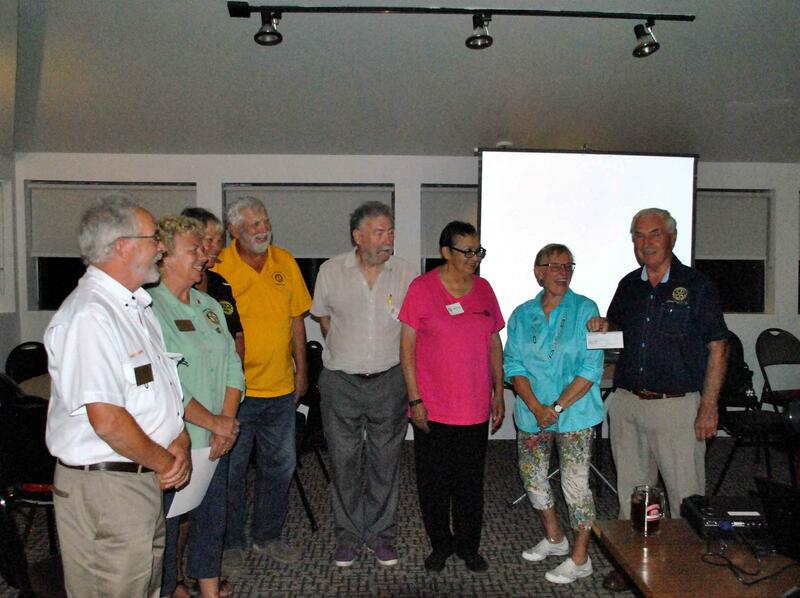 Our gathering tonight was a joint meeting with members of the Kemptville Lions Club. It was a chance for the two clubs to learn a little bit about each other and some of the projects we are involved in. 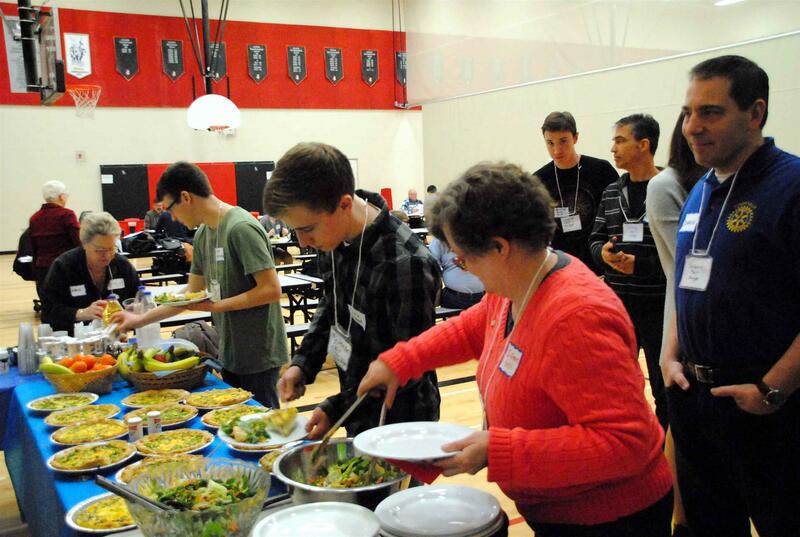 Service clubs have different areas of focus, but the main focus of all of them is service to their communities. If you would like to contribute to your community, contact one of your local service clubs to see what they do and what they have to offer. Pictured below, Presidents Wayne and Cora go through some of their clubs projects. 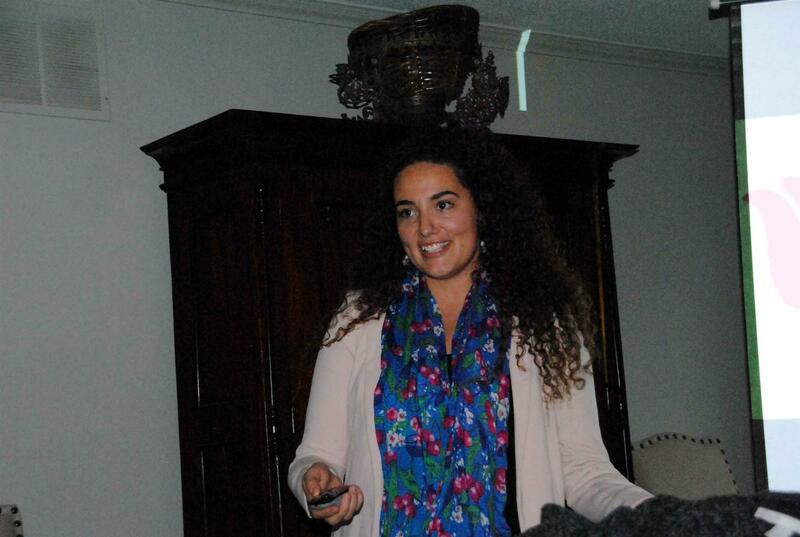 Our speaker this evening was Sabrina Rubli, founder of Femme International. Femme International is an NGO that is dedicated to promoting education regarding menstrual health in Eastern Africa. Femme has been working in Kenya since 2013 as well as in Tanzania. Menstruation is a large deterrent to education for women who are not able to access information or products. There are cultural taboos that exist in many areas and isolation occurs for many women during menstruation. The organization is based on educating women about anatomy and strategies to ensure women are safe and healthy. Our speaker tonight was the overall winner of the Rotary Science Fair, Kevin Streight. Kevin along with Science Fair organizer, teacher Matt Wilson spoke to the club about the fair. Kevin brought his display booth and experiment with him, explained the premise and demonstrated it to our club. The future of our youth looks bright. 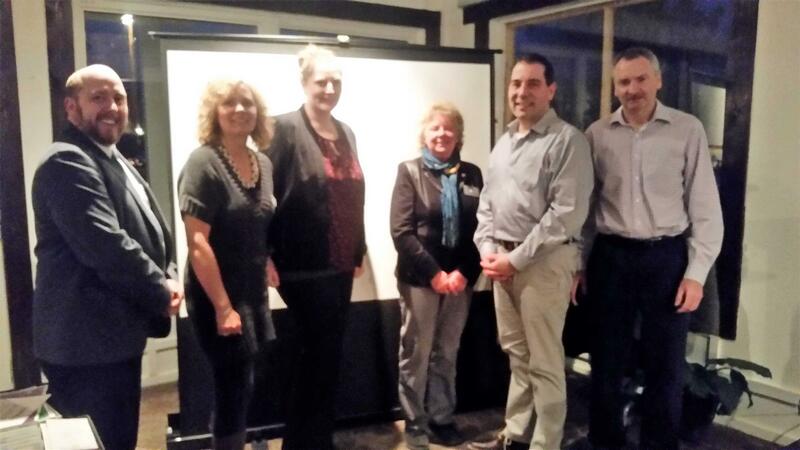 Rotarian Serge welcomed Anne Kotlarchuk of ALK Event Management to our meeting as our speaker for the evening. Anne provided us with an overview of her transition from UoG/Kemptville College to private event management in this area. • Shop Local – a spring trade show that will host 75 vendors on the area floor at MHG. Activities/displays will include food trucks, beer tasting, wine tasting, food sampling, animal petting, social media consultation, business coaching, and networking. very successful and well attended. A most informative presentation and a good news story suggesting that while closure of UoG is not good for NG, there are some good recovery stories that have come out of it for the individuals who were forced to move on. Tonight's meeting was one of those necessary events, a business meeting. Members broke into their various committee groups and did a review of objectives and accomplishments. As well the district budget was discussed with questions of concern to be asked prior to its passage at District Assembly. 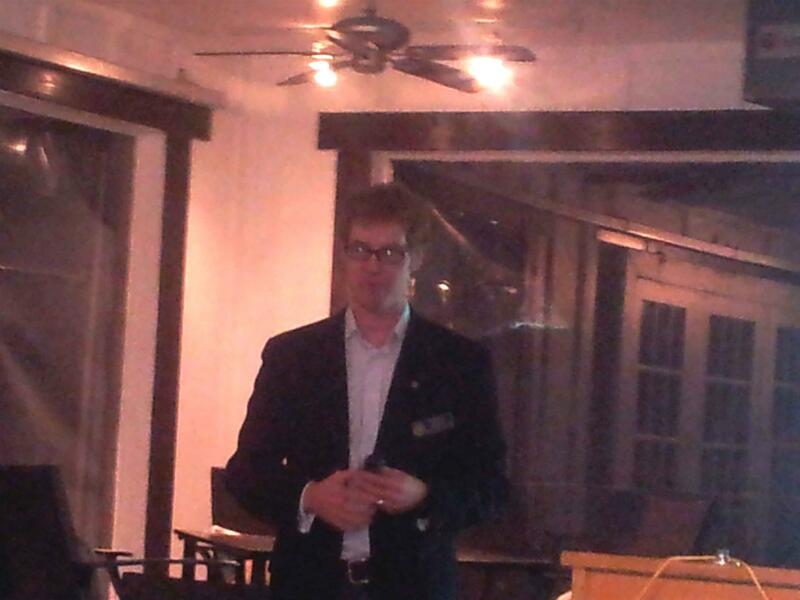 Our speaker this evening was Frank Vassallo, CEO of Kemptville District Hospital. Frank was here to give us an update on what has been happening at the hospital since his last visit. In addition to scoring 100% in its recent accreditation, the hospital is moving forward with other initiatives. In the planning stages are the doubling of clinic space and well as bringing new clinics to the hospital in partnership with other health care facilities. Frank closed by reinforcing the message the patient and family satisfaction is at the core of everything they do. 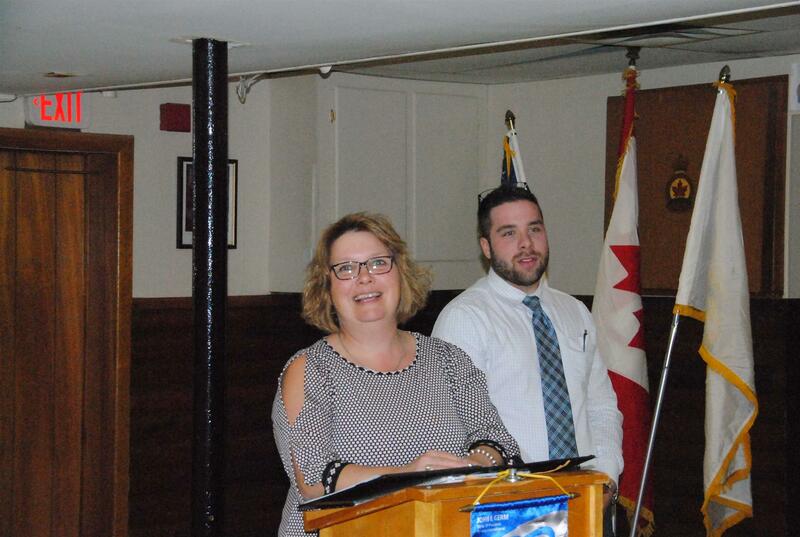 He was thanked by President Cora and Rotarian Anna. The Rotary Science Fair was held today at NDGHS. In addition to being the Fair's major sponsor, members of our club were there at zero dark hundred to set up the judges breakfast. The judges came in, received instructions and got themselves organized. And then it was "Fair On" for the exhibitors and judges. And finally, feeding the judges lunch before they went back to select the winner. Our speaker this evening was Rotarian Darren who spoke to us about the North Grenville Community Fund. Darren gave a brief history of the fund, as well as the types of funds available, how they work and how they are administered. Pictured with Darren below are members of the fund's board. Due to the current and expected weather conditions, this evening's meeting has been cancelled. If you have to drive, be careful and stay safe! 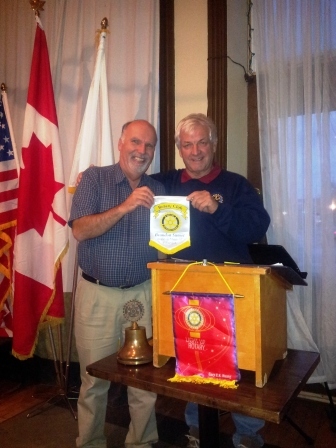 Our speaker this evening was Ken Graham, president of the Rotary Club of Smith's Falls. Ken's visit is the first of visits by presidents from clubs in our group as we get to know each other. 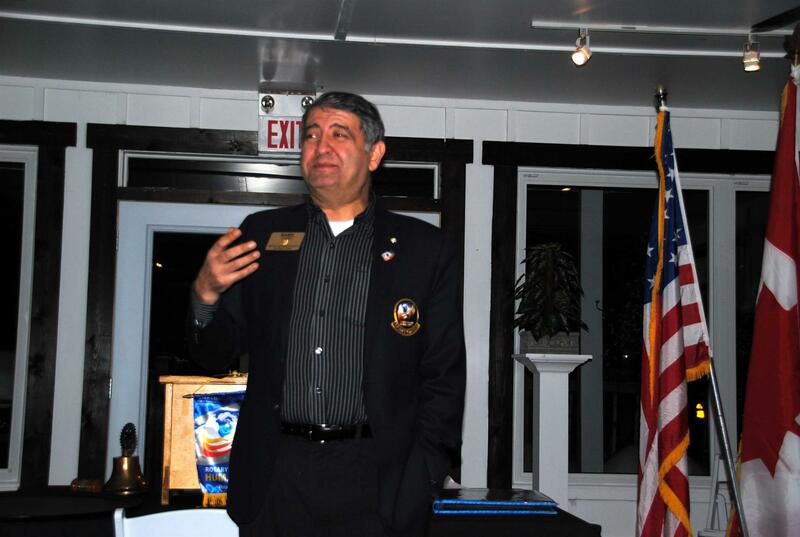 Ken gave the club an overview of his background, and what led him to become a Rotarian. Ken completed his presentation by giving us a brief description of his club and some of the things they do to improve their community. 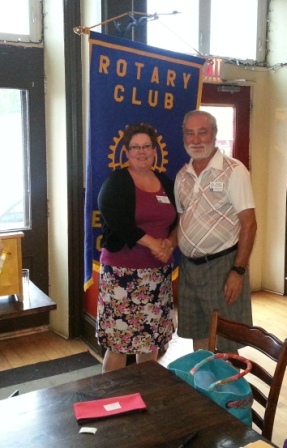 Tonight we welcomed Rotarians Cora and John back from their service trip to El Salvador. A slideshow was presented detailing the events of their trip. There is very little terrain that is flat. Most of the geography is rolling hills and mountains. The presentation included a visual a tour of the stove manufacturing plant where there were displays of previous prototypes and current models of the stoves. There are also latrines being produced in the same facility. The group also had a tour of the manufacturing facility that Tito (our El Salvador’s contact) operates. In addition to visiting a coffee plantation where housing is built by Rotoract clubs, they also participated in a programme which distributed over 600 backpacks with school supplies to needy children. 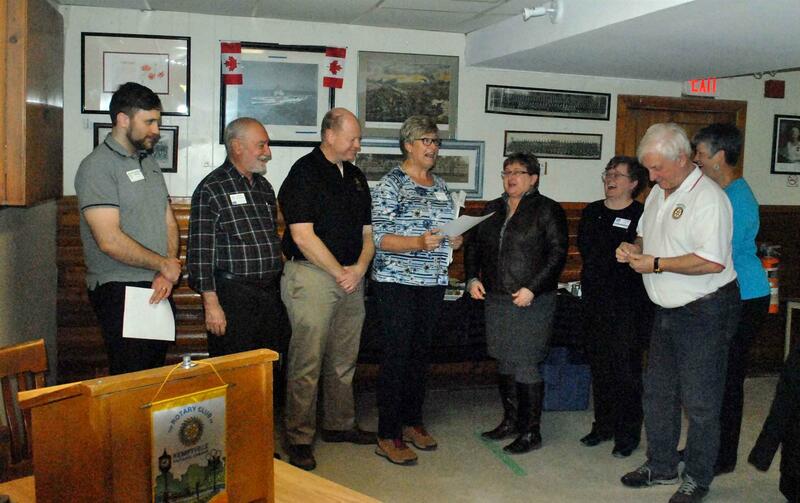 This evening we also inducted Rotarian Serge's wife Brenda, as a friend of Rotary. Next weeks meeting - pancakes at Leslie Hall! Tonight our meeting was hosted by the Kemptville Youth Centre. KYC is a non-profit organization with a mission to engage youth in making positive life choices in a socially accepting environment to reach their full potential as responsible productive citizens. 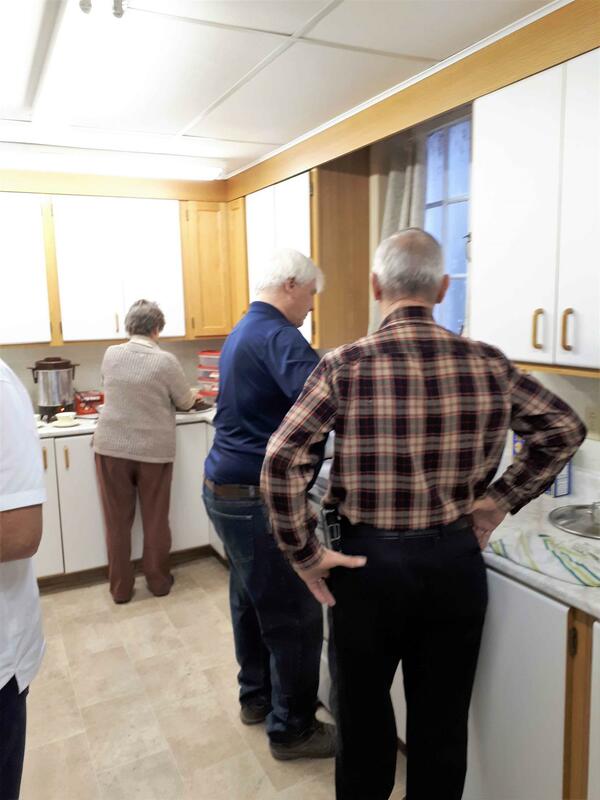 Some members of the centre prepared and joined us for a spaghetti dinner tonight while others were out for sports night. Following supper, KYC's new operations manager Pat Henderson, spoke to us about his background and some of the things he would like to see at the centre going forward. All in all, it was a great evening in one of the places that is very important to our club. Tonight's meeting is cancelled due to the projected incoming storm. 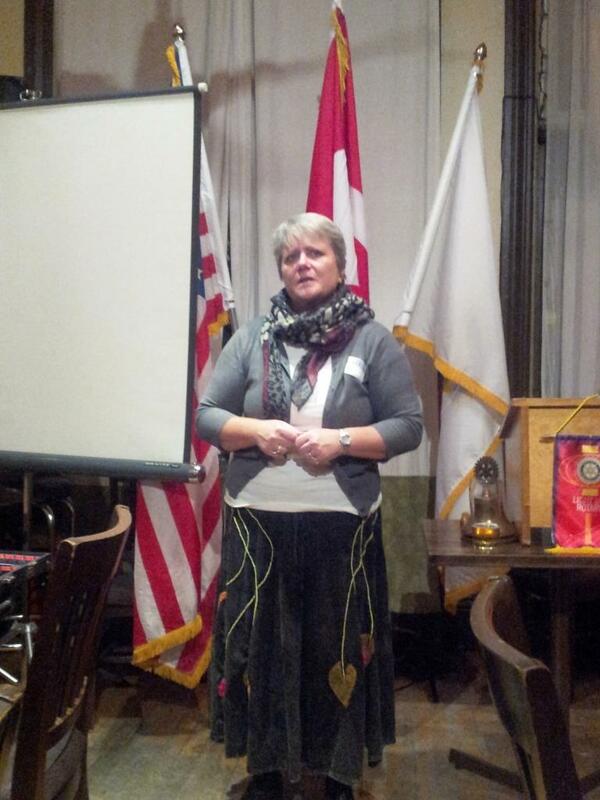 Our speaker this evening was OPP Community Safety Officer, Constable Cathy Lindsay. Cst Lindsay went through various types of fraud and scams that are perpetrated in our community. They generally break down to internet, phone or door threats. Fraud artists want to separate you from your assets. Recognition of fraud or a scam is the key. The following information is taken from the OPP Crime Prevention Section pamphlet. Caller asks for your personal information, is requesting a donation, has something to offer like you have won a cruise or weekend away, says 'act now- they are doing you a favour'. If it sounds too good to be true, it probably is. Be careful when clicking on links you receive in emails, even email received from friends. Email addresses are sometimes hijacked and the message isn't coming from who you think it may be from. Clicking onto a suspicious link could give a third party access to your computer and your private information. Also remember that your bank or the Canada Revenue Agency will not email you to ask you to confirm you accounts or personal data - they have that information - a scammer doesn't. 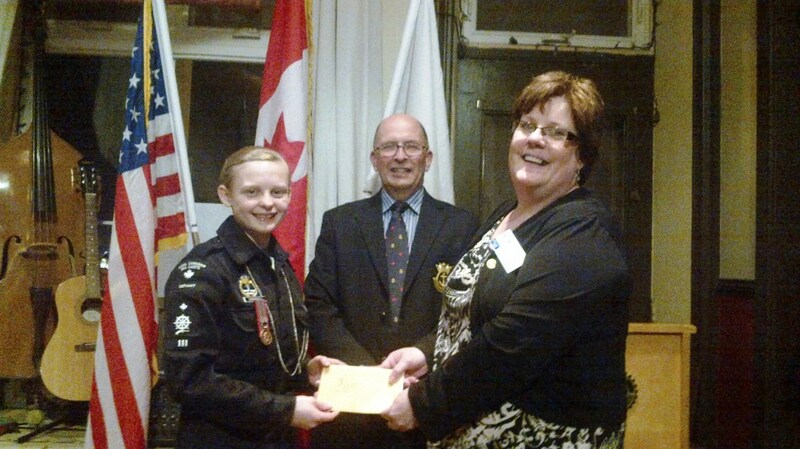 Constable Lindsay was thanked for her presentation by Rotarian Donovan. 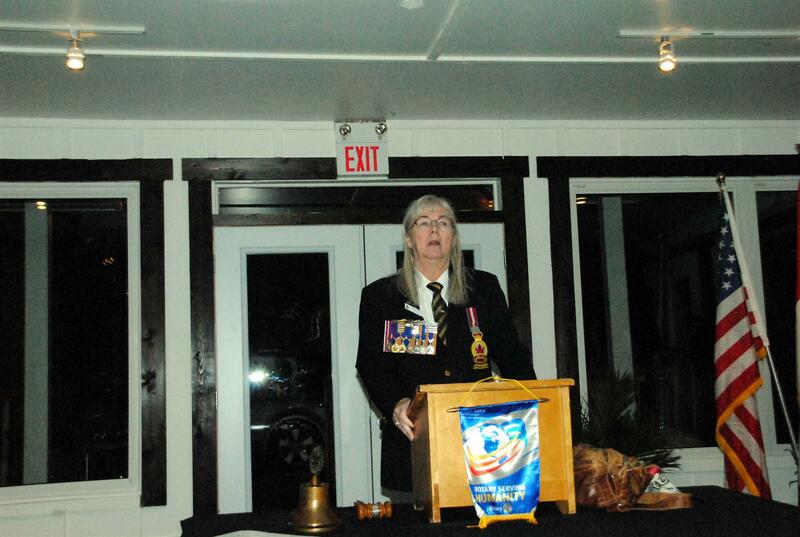 Tonight's speaker was Sharon Murray, a member of Royal Canadian Legion Branch 212 in Kemptville. Sharon gave the club an overview of why the Legion was founded, how they operate and who is eligible for their assistance. We were also informed that the only fundraising the Legion does is their annual Poppy Campaign in remembrance of our veterans. The campaign runs from the last two weeks of October until November 10th. It is their hope that on November 11th, every member of the community will wear a poppy whether a donation was made or not. The funds raised from the poppy campaign are used 100% for community service and are totally separate from other Legion activities. 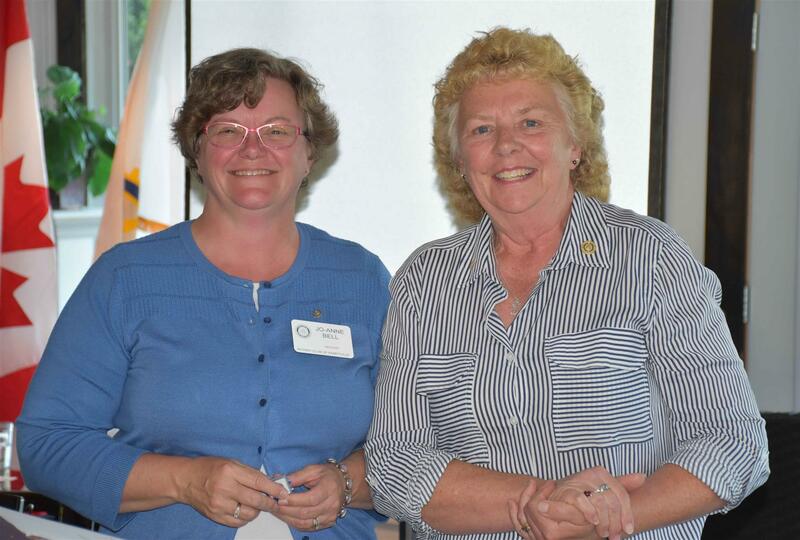 Rotarian Joanne thanked Sharon for her presentation. We had a busy evening tonight. In addition to District Governor Nabil visiting, we also had as guests representatives of various community groups that we partner with. 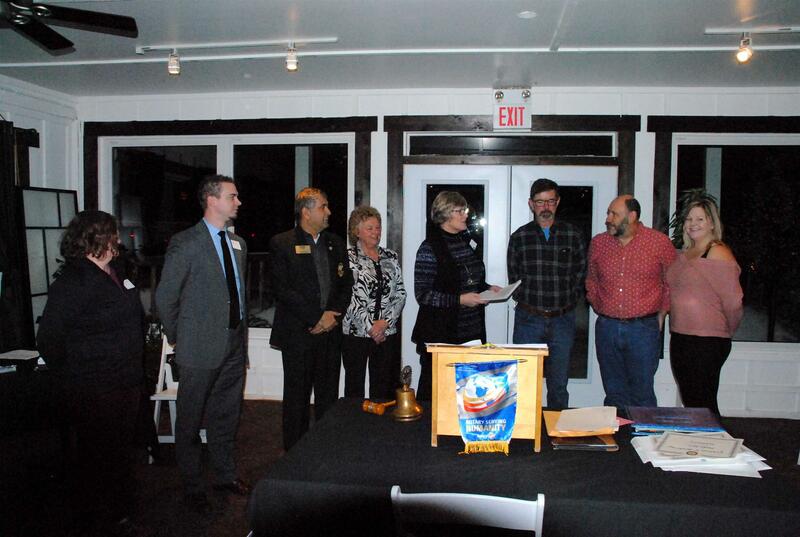 The evening began with the official welcoming of this club's new Friends of Rotary. Pictured below on the right are John, Steven and Laura and their sponsors on the left. 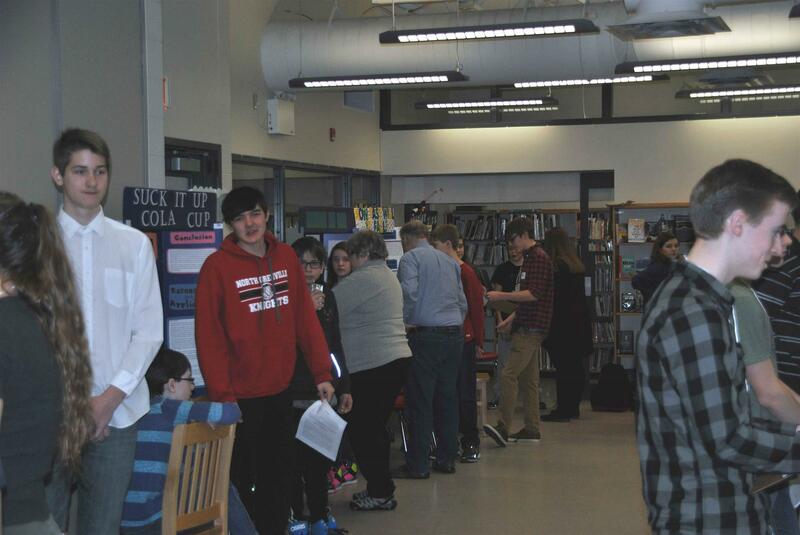 Following the welcoming of friends, presentations were made to North Grenville Accessible Transport, North Grenville Rotary Science Fair and North Grenville Scouts. Then our speaker, DG Nabil addressed the club and our guests. Nabil's profession is conflict resolution and he shared with the club his journey from being a medical student to what he does today. He also shared how he feels about membership, both recruitment and retention and the different ways everyone can engage. After our meeting adjourned, a desert of home made cake was shared with all. As the evening concluded, Nabil shared his time with members and potential members. 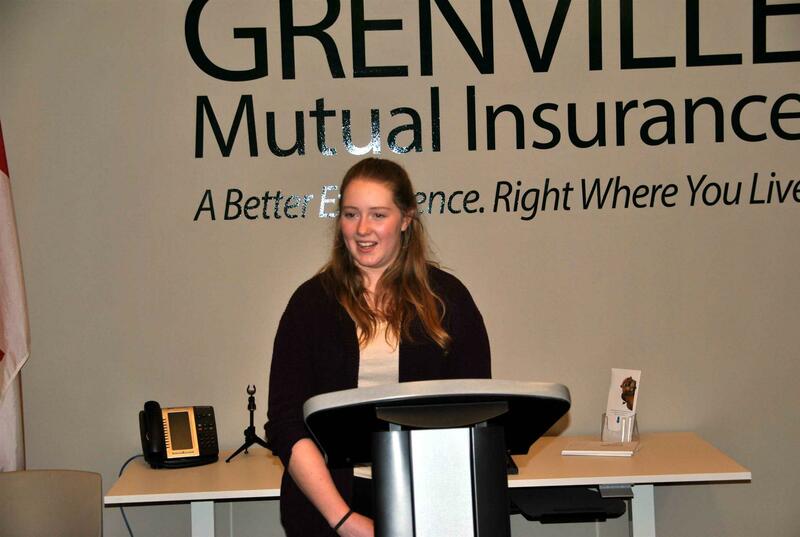 Our speaker this evening was Laura Scott, a 3rd year agricultural student at the University of Guelph. Laura explained that 4-H Clubs are separated into different classification sectors of farming. This programme is open to youth between the ages of 9 and 21 After the age of 21 interested members can become club leaders. Laura credits 4-H for giving her much of her confidence and work skills. 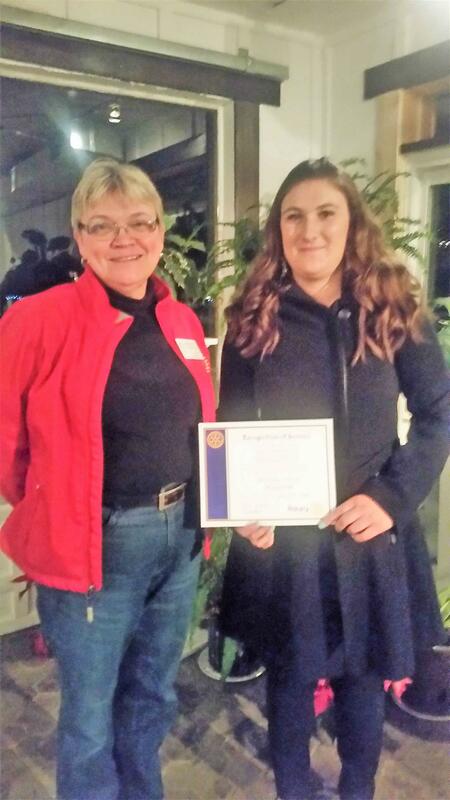 Pictured below, Youth Services chair, Rotarian Jennifer presents Laura with a certificate of appreciation. Our club ended this calendar year with a Christmas party for members, family and friends with ages ranging from 11 months to 95. This time for fellowship and food was enjoyed by all. From our homes to yours, a very Merry Christmas and a safe and Happy New Year. Our guests this evening were Cadets and Officers from Sea Cadet Corps Defiant and Navy League Cadet Corps Assiniboine. Each of the Corps officers and cadets gave a brief overview of their programme while local Navy League chairman, Mike McIntosh contrasted the two different programmes, how they are set up and funded. Pictured below are representatives of the two Corps with club members Cora and Donovan. We had a change of venue for tonight's meeting. We were hosted by Lee and Terry MacIlvenna at their business, Geronimo's in Old Town Kemptville. After serving a delicious soup and sandwich dinner, Terry gave us a brief overview of how they transitioned from banking to running their own small business. Members enjoyed the informal meeting and unique venue. 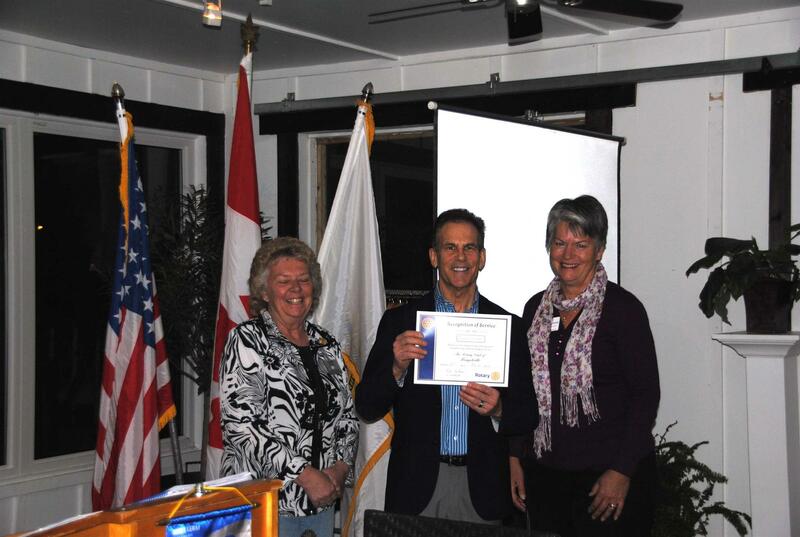 Pictured below, president Cora presents Lee and Terry with a certificate of appreciation. Rotary members, as volunteers, conduct projects and donated time and energy to address today’s humanitarian challenges, including illiteracy, disease, hunger, poverty, lack of clean water, and environmental concerns while encouraging high standards in all vocations. Rotary members strive to build goodwill and peace, and provide humanitarian service in the communities and throughout the world. For more information, visit www.kemptvillerotary.ca or contact President Jo-Anne. This past Saturday saw our club take part in the annual Santa Claus parade. 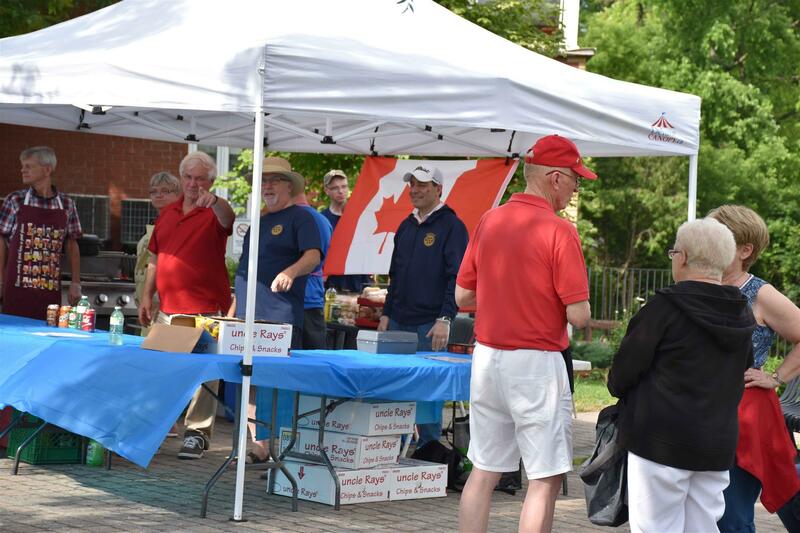 Our club split into two groups for this day, those who walked the parade route with our float passing out candy and collecting food for our local food banks and those who manned the BBQ at Rotary Park providing warm refreshment to those attending the parade. 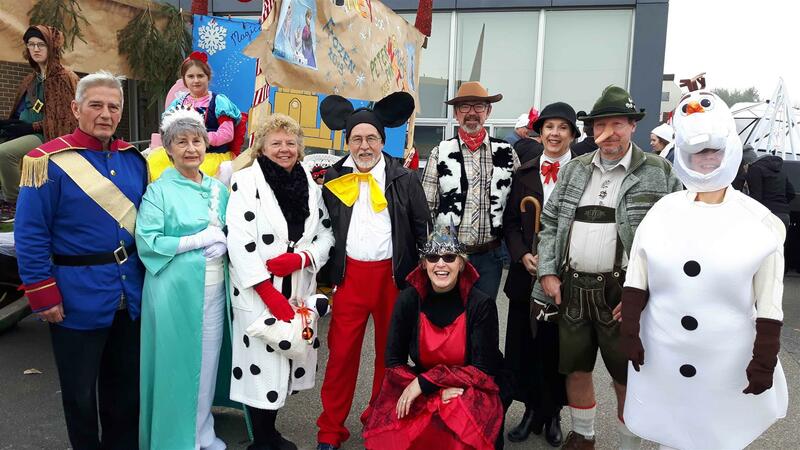 Pictured below are our Disney themed members who walked the parade route. A good time was had by all! A reminder that there is no meeting this coming Tuesday. Every year, clubs in District 7040 run a series of "Adventures" programmes for high school students. Some of the many adventures are in citizenship, environment and technology. 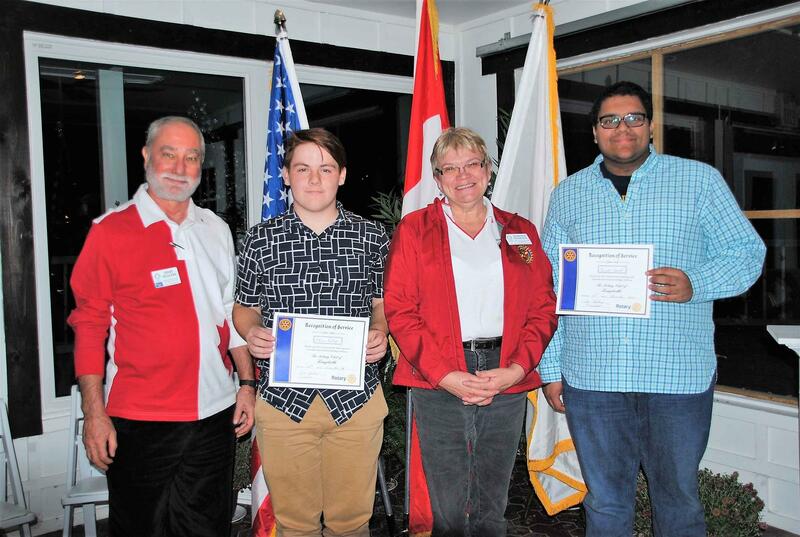 This year two students from our community participated in the Adventures in High Tech programme run by the Rotary club of Nepean-Kanata from October 16th to 20th. Tonight Gurjot and Oliver shared their experiences with members of the club. Included in their adventure were trips to Carleton and Ottawa Universities as well as Algonquin College. Commercial venues included InGenius Software, L-Spark, Shopify, NAV Canada and the Canadian Nuclear Laboratories at Chalk River. These young men said that they were made aware of educational and career opportunities that they wouldn't have known existed without the programme. 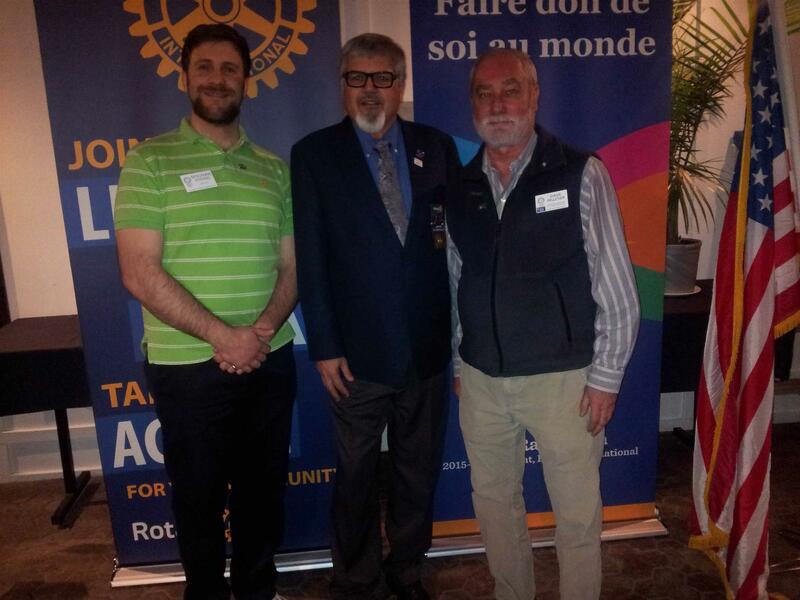 Pictured below with Oliver and Gurjot are Rotarians Dave and Jennifer of the club's youth services committee. We had an interesting presentation tonight from Rotarian Mike on "Roaring Rotarian" beer. Mike spoke about its origins and its availability. One thing that always makes a meeting enjoyable is the induction of a new member. Tonight we were pleased to induct Rotarian Wayne into our Rotary family. Wayne has contributed a great deal to our club already and we are pleased to welcome him on board. The 33rd edition of the Canada/Scotland Rotary Curling Tour has just passed through our area. The tour, which is 60 years old competes for a series of trophies, alternating sides of the Atlantic every two years. 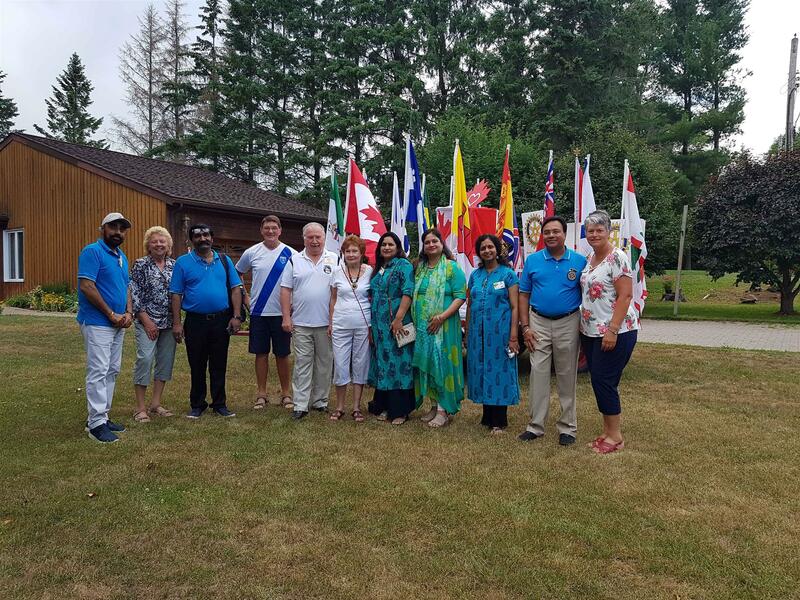 Hosted in this area by our club and the Rotary club of West Ottawa, the Scottish team and their hosts began with a Rotary luncheon meeting with West Ottawa. From there the team proceeded to the Hunt Club for a match against a Canadian squad. For the total score on 5 sheets, Canada emerged a point ahead. The following day included tours of the Aviation museum and Parliament. Our guests were treated to a pot luck supper at Rotarian Bruce's with entertainment provided by both groups. From here the group left for Kingston to continue the tour through central and southern Ontario. The tour is 29 days and is a test of skill and stamina. 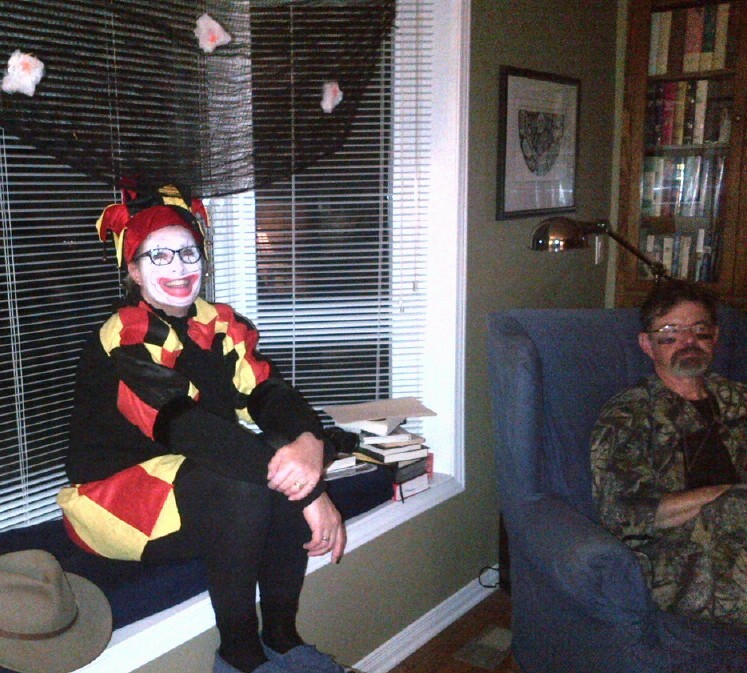 This year we had a non-traditional Halloween meeting. Members met at the home of Rotarian Jeff and his spouse Laura to gather around a bonfire in costume to enjoy fellowship and a great chili dinner. Despite the cool temperature, a great time had by all who attended. Tonight was a work night for the members of our club. 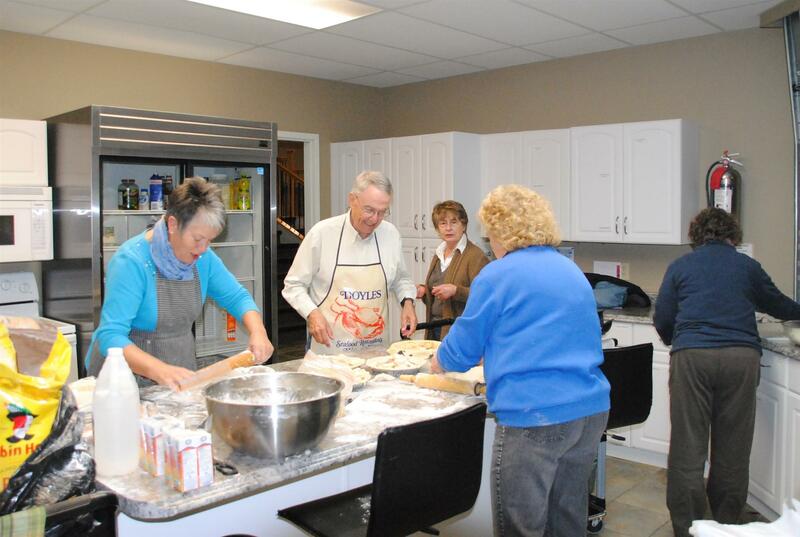 It was all hands on deck as we prepared Quiche pies for distribution at the House of Lazarus. Pictured below, above "Chefs Norma & Mike" work at prep for the waiting assembly line below. Tonight's speaker was Maj. Mike Calnan (Ret) who is the founder of the swords and Ploughshares museum. Mike gave us a background on the museum, how it came to be and what their objectives are. His history with the museum dates back to his time spent with his father collecting badges and medals. This eventually evolved to firearms and jeeps. The organization uses old and decommissioned vehicles and equipment to highlight military history. There are no paid staff everyone is a volunteer. The primary activity is research and acquisition of significant items. The second activity is restoration. The third is presentation and education through parades and ceremonial events. The fourth is preservation of the items. 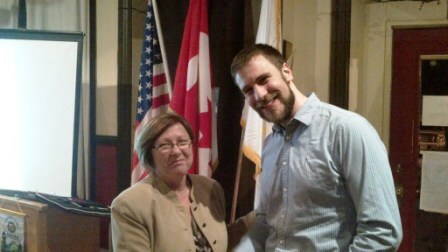 Pictured below, Mike is thanked by Rotarian Jo-Anne. Tonight we had an update from member Bob Johnston who is actively involved with Refugees In North Grenville (RING). Bob let us know about some of the logistical challenges they faced with the arrival of the community's family on short notice. He also went through some of the hurdles they have had since the family arrived as well as a lot of the background struggles they had with the applications and bureaucratic process in sponsoring. A very informative presentation. CANADA 150th BIRTHDAY HERE WE COME …. Mom always said, “It’s never too early to plan for a party!”. 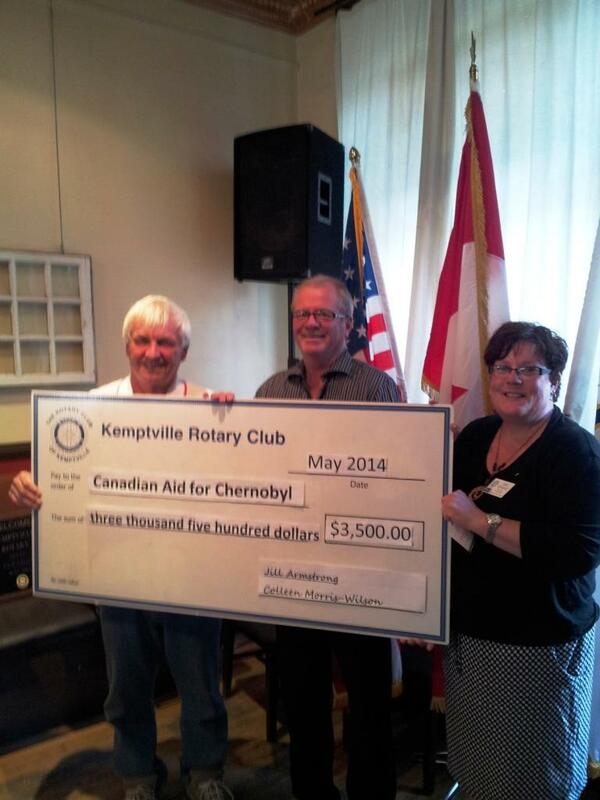 With this in mind the Rotary Club of Kemptville recently made a $500.00 donation to the Kemptville Horticulture Society to aid in preparations for Canada’s 150th Birthday in 2017. The donation ensures that the Horticulture Society are able to purchase five hundred Canada 150 tulips bulbs that have been specially developed by the National Capital Commission in honour of Canada’s sesquicentennial. With fall just around the corner, horticulture club volunteers will plant the bulbs at Rotary Park in Old Town Kemptville. Rotary Park was developed in 2000 as a community millennium project. 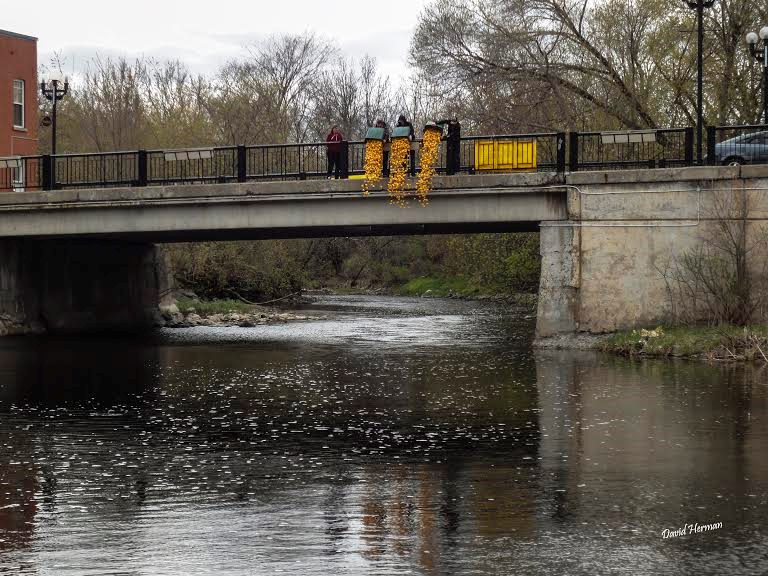 The park is now a destination point for locals and visitor alike to come, sit a spell, relax and take in the beauty of the South Branch of the Rideau River. Come spring the park gardens will be in full bloom with elegant white blossoms with red flames reminding the community of our maple leaf flag. 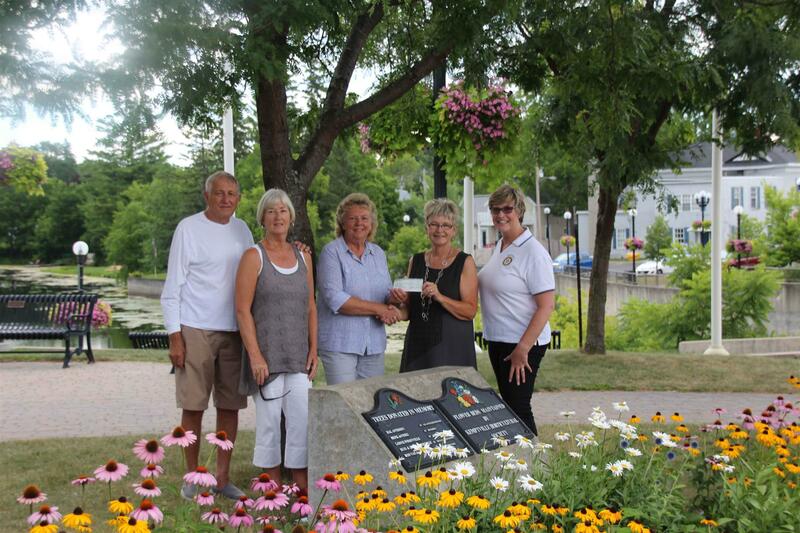 Pictured are: Horticulture Society members John & Doreen who recently took on much of the garden revitalization and President Diane Tappin along with Rotarians President Cora Beking and Nancy Miller McKenzie. Rotary members, as volunteers, conduct projects and donated time and energy to address today’s humanitarian challenges, including illiteracy, disease, hunger, poverty, lack of clean water, and environmental concerns while encouraging high standards in all vocations. Rotary members strive to build goodwill and peace, and provide humanitarian service in the communities and throughout the world. 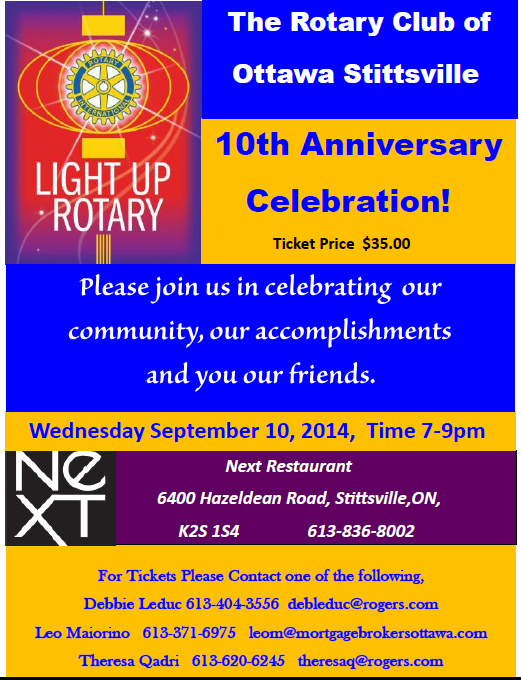 For more information, visit www.kemptvillerotary.ca or call President Cora @ 613-258-5396. For the past two weeks, Beverley Illauq has spoken to our club about communities in the north, the living conditions and some of the challenges these communities face. In looking at ways the club could partner with a northern community, she presented 5 workable options for the club to consider. Details are attached to tonight’s club bulletin and will be discussed next week. 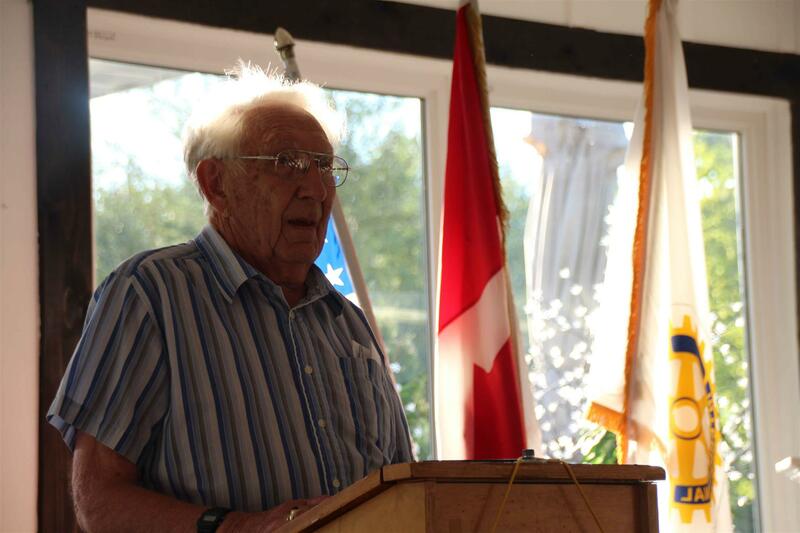 Former councillor and mayor, Ralph Raina was our club's speaker this morning. Still actively involved in the community, Ralph shared his vision and objectives for the municipality with the members. Youth are one of our club's main focus. Once again this year, members of our club turned out to partner with the Kemptville Youth Centre in preparation for its annual book fair. 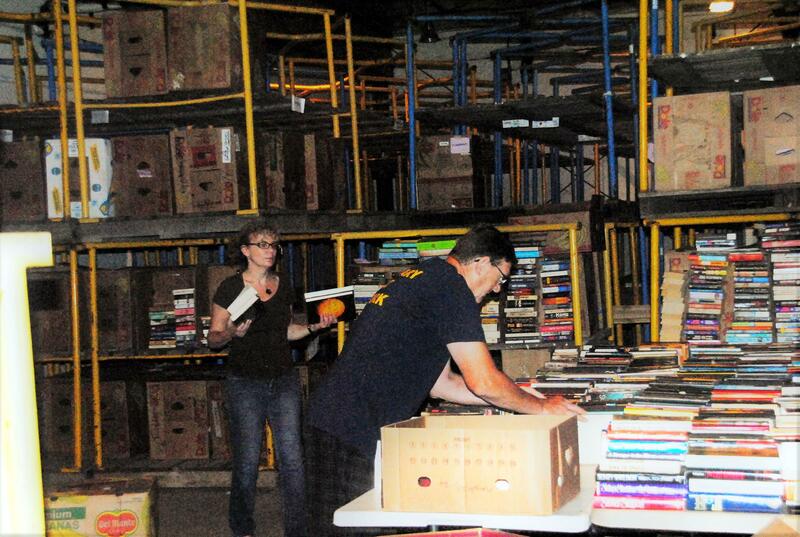 Members, as pictured below helped with categorizing, sorting and preparing sale tables. We are a small club in a small community and you would think everyone would know what's going on. We had a unique meeting tonight in which members shared the ways in which they serve the community. There were programmes that members didn't know existed and ways of sharing that we hadn't considered before. It restored why we do what we do. 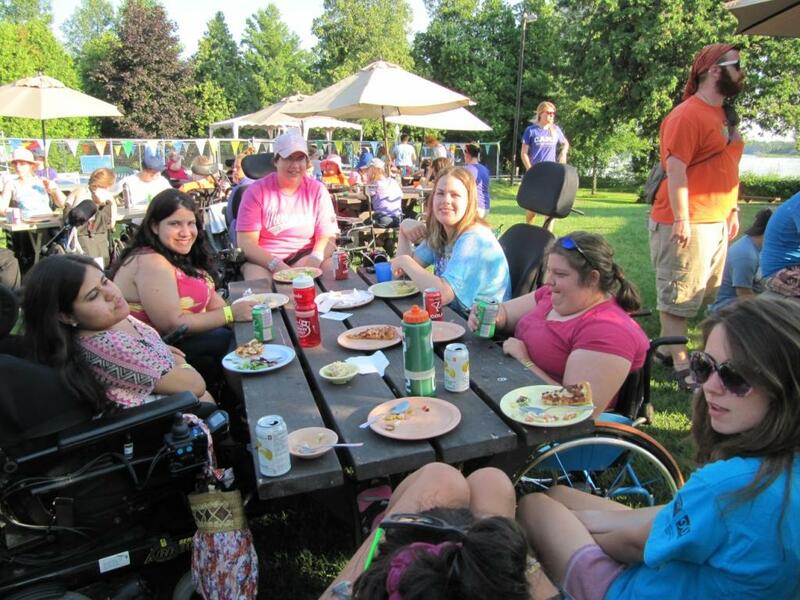 Last week, members of the club joined the campers and staff of Easter seals Camp Merrywood for our annual pizza party. The weather was great and we were able to enjoy our meal in the sun. The camp is designed for children with disabilities and the staffing ratio is one to one. 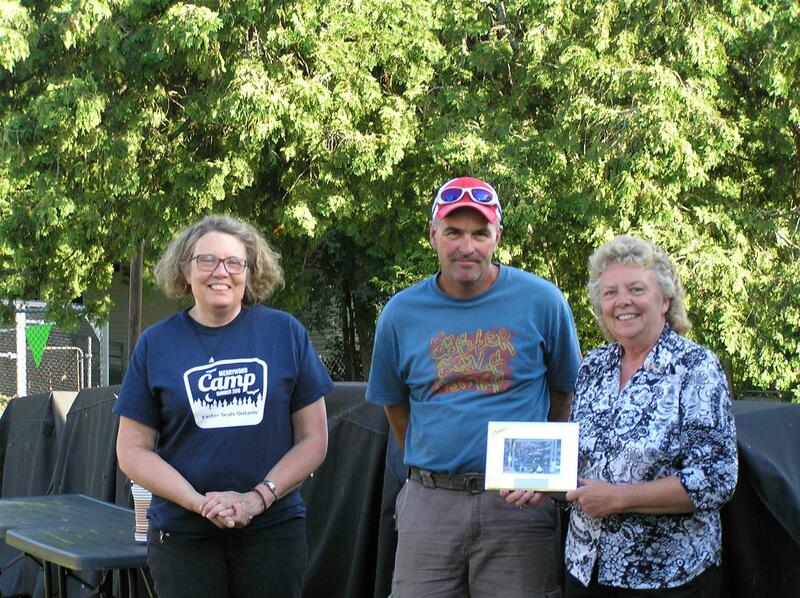 Once everyone had their food, there was some serious "chowing down"
At the end of it all, President Cora was thanked by Camp Director Beth and site manager Jacques who presented a plaque of appreciation. 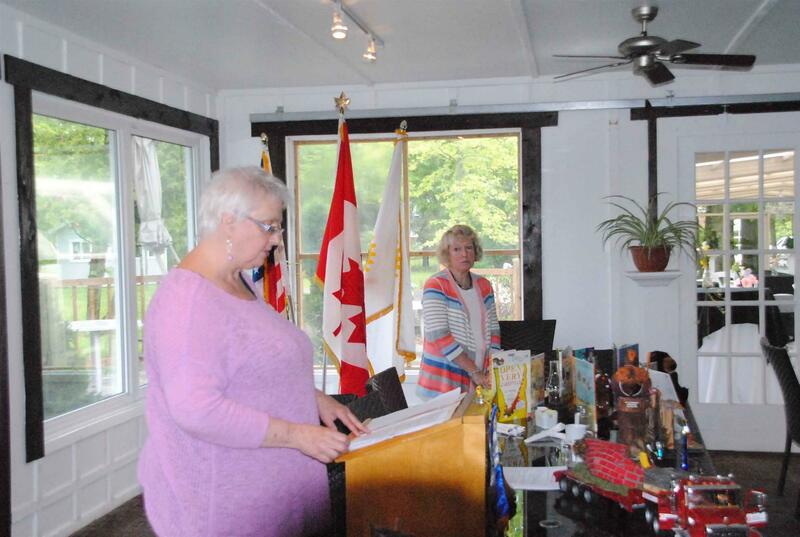 Our club celebrated its changeover of club officers at the Smokey Ridge Winery http://www.smokiesgrapes.com/ in North Dundas on July 5th. 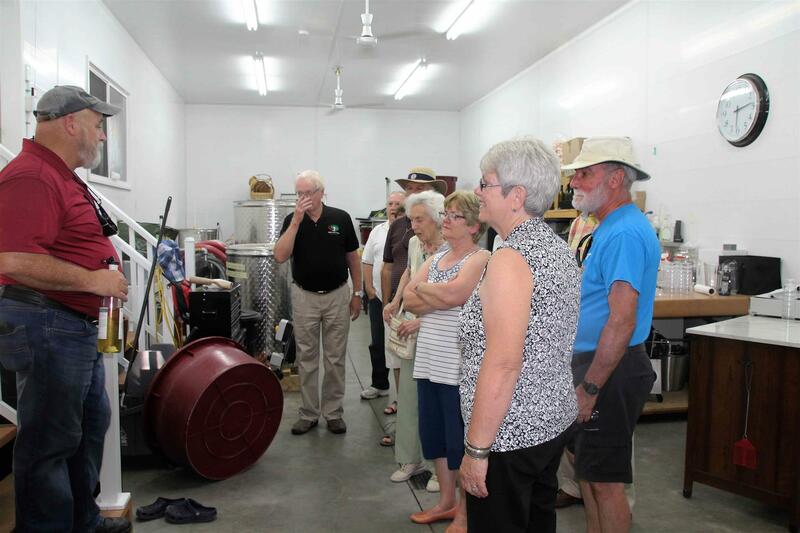 Our hosts Smokey and Debbie took members on a tour of the facility as well as to the vineyards. They explained they type of grape they use, the products they make and went through the process. Following the tour, a chicken and steak dinner was served with buffet salads and deserts. Grill master Donovan did another great job this year and the meal was enjoyed by all. 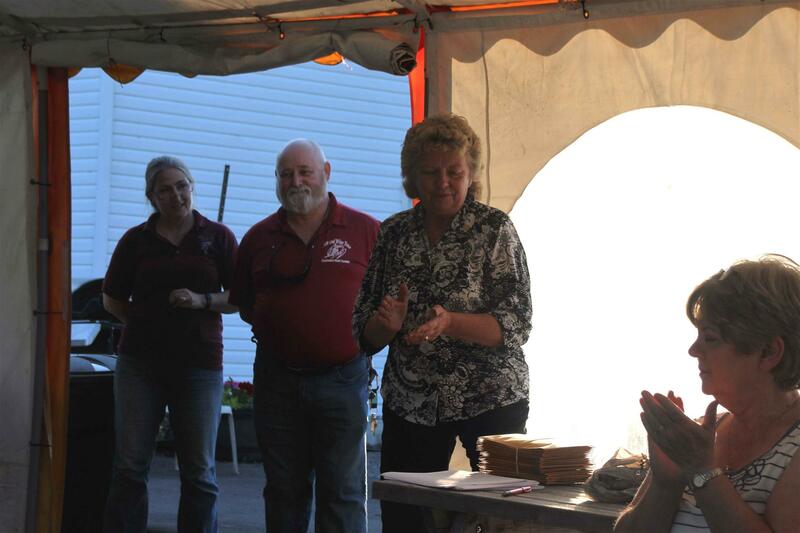 Following dinner, President-elect Cora thanked Smokey and Debbie for the tour and hosting us. 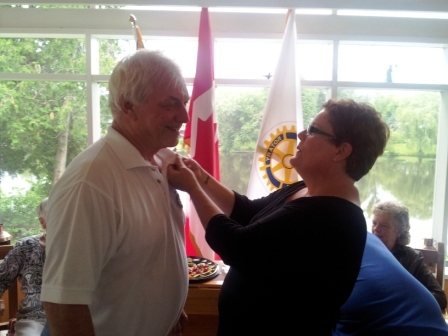 Then it was time to get down to business with Past-president John presenting now President Cora with the President's pin of office. The evening concluded with the presentation of the new board. After a great deal of planning, members and participants assembled at the college for the beginning of the 2016 Canada Day Parade. Floats and groups were assembled and ready to go. Unfortunately Mother Nature decided she would delay things a bit and sent a 20 minute Hollywood Rain Storm through the area. A lot of people got wet but that didn't dampen the enthusiasm of the participants and after a brief delay the parade got underway. The end of the 2015-2016 Rotary Year was a hectic one. In addition the tidying up all of the loose ends, we were also involved with Canada Day preparations and the presentation of bursaries at the local high schools. Pictured below is President-elect Cora presenting a bursary to the deserving student at St. Mike's. 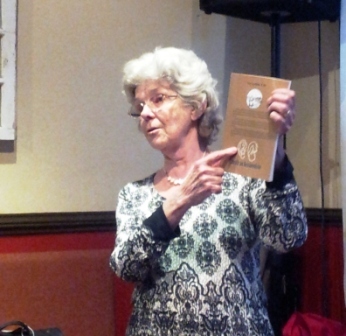 Our speaker this evening was Carol Pillar, a holistic nutritional counsellor. Carol councils people with concerns regarding healthy eating and Gastrointestinal concerns. Carol feels that she is essentially a teacher who works to allow people to achieve nutritional harmony. Each approach to nutrition is hinged on the individual. Organic, whole, live, is preferred over food that are/have artificial, modified, hydrogenated, flavouring, color. Mr. Dave Blue of Hudson Autobody, the prize sponsor of the 5th Annual Duck Race held Sunday, May 8th, We’d also like to thank B&H Grocer, Canadian Tire, Girl Guides, Craft Show Oxford Mills, Jonsson’s Independent Grocer, North Grenville Shop Local Fair, North Grenville Sustainability Fair, and the North Grenville District High School for providing us with space to sell tickets. Congratulations to our winners: 1122 - 1st Phil Neveu $ 500.00, 1068 - 2nd Catherine Brunton $ 200.00, 1302 - 3rd Kathy Lafontaine $ 100.00 and all $ 20.00 winners: 77 Alicia Hogman, 264 Don Johnston, 293 Jessica Nahmabin, 406 Ben Varano 421 Claude Smith, 429 Bruce Wehlau, 706 Terry Coville, 954 Leang Family, 967 Glen Higgins,988 Pamela Warner, 1071 Val Harten, 1109 Lianne Arbour, 1158 Lynda Sharpe, 1306 Monica Dalupan, 1308 Monica Dalupan, 1313 Lorna Carley, and 1323 Leah Curnock. We hope that everyone will try again next year … Your support provides much need funds to aid community projects and activities! 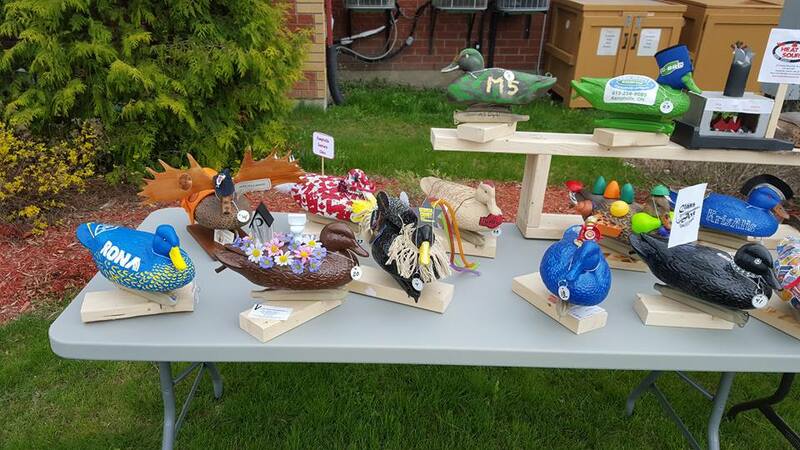 The generous members of our business community set the tone for the race by entering their business ducks for display prior to the running of the great race. and fellowship to be shared. 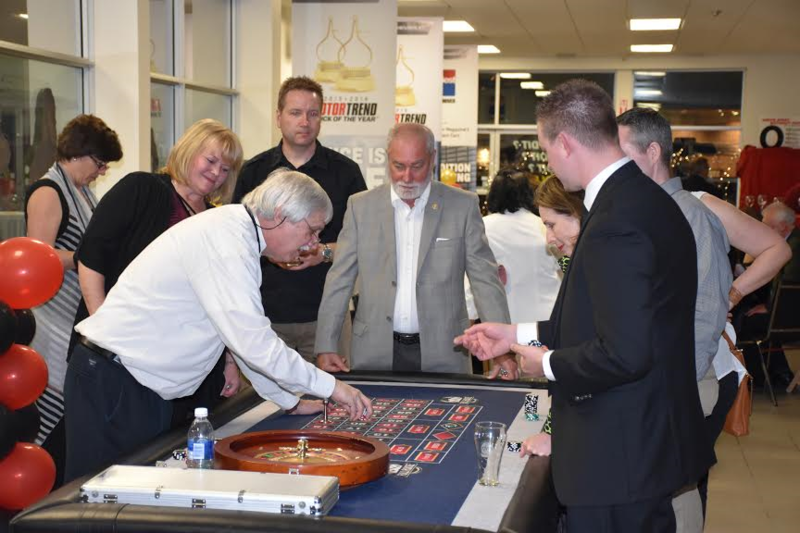 Join us on Saturday, May 7th for an evening of fun and entertainment at Rotary Casino Night. The event is being held in the Myers Showroom on Elvira Street. 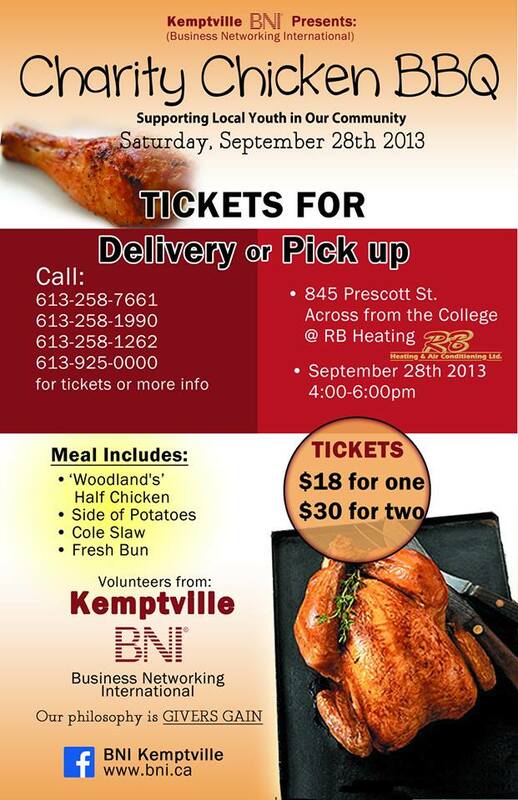 Tickets available at Kemptville Scotiabank. See below for complete details. Our speaker this evening was Beverly Illauq. In a very interesting presentation, Beverly went through a comparison of the northern Innu and indiginous peoples below the tree line as well as the effects of treaties and how people were gathered for both groups. Her thought provoking presentation allowed our members to reflect on a number of social issues. A major focus of our club is youth. Tonight we were pleased to welcome Best of Fair winner Jasmine Friedrich-Yap and the Rotary Science Fair organizer, teacher Matthew Wilson. Jasmine brought her well researched and documented project with her, displayed and explained it and her results to the club. It was very motivating to see the quality of the project that this young individual attained. Tonight our club was visited by our District Governor, Rotarian Claude LaLiberté. DG Claude was interested in meeting our members and not giving the typical speech that no one would remember. He touched on District matters and had a very open Q&A session. He concluded his visit with a presentation to what he called the least recognized and appreciated member of the club - the club secretary. Pictured below Secretary Ben, DG Claude, and e-Secretary Dave. Tonight's speaker was the CEO of Kemptville District Hospital, Mr. Frank Vassallo. During his presentation, Frank took members through updates to the hospital and things it has achieved. Frank also went through the hospital's new brand - The Patient Experience Starts Here - which is a reminder to each staff member that they are the face of the hospital and are how people will remember their experience with the hospital. Tonight's meeting began with a presentation on behalf of R.I. to Past-President Donovan for the increase in membership we showed last year. Pictured below President John presents PP Donovan his award. Our speaker this evening was Erin-Lee Marcotte. Erin is a manager with Lanark-Leeds-Grenville Family and Children's Services. In a very informative presentation, Erin took us through the steps and criteria used by family services when they intervene on behalf of a child. She indicated some of the sources the agency uses both to project children and assist families as well as pointing out the everyone is legally obligated to report suspected abuse of a child. 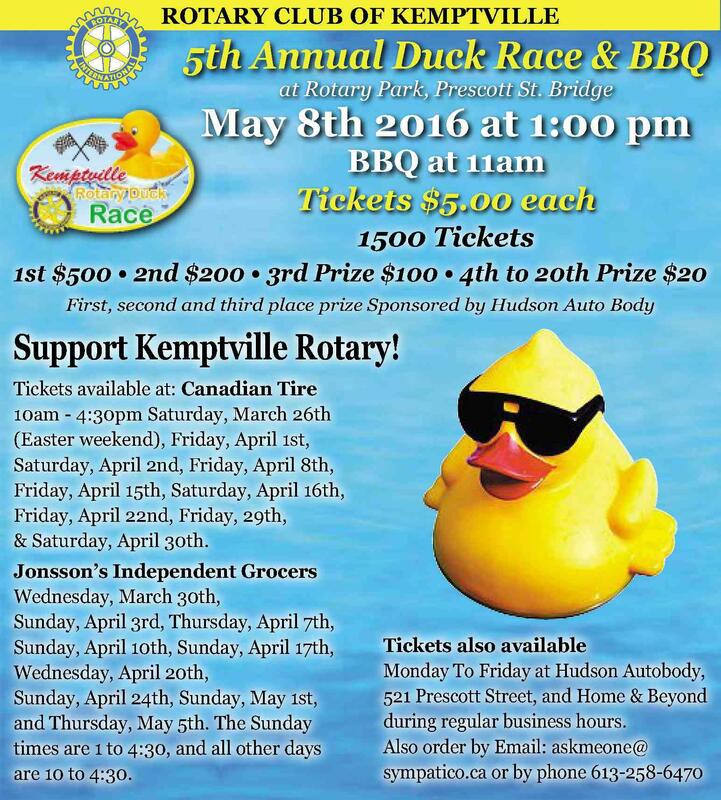 The 2016 Rotary Family Duck Race will be held on Sunday, May 8th at 1:00 pm from Rotary Park. First through third prizes sponsored by Hudson's Auto Body are $500 $200 $100 respectively. Thanks also to m5digital for supporting our printing needs. Tickets are $5 each and a maximum of 1500 tickets will be sold. Tonight's meeting is cancelled due to inclement weather. Please don't go out and if you have to, be extremely careful. 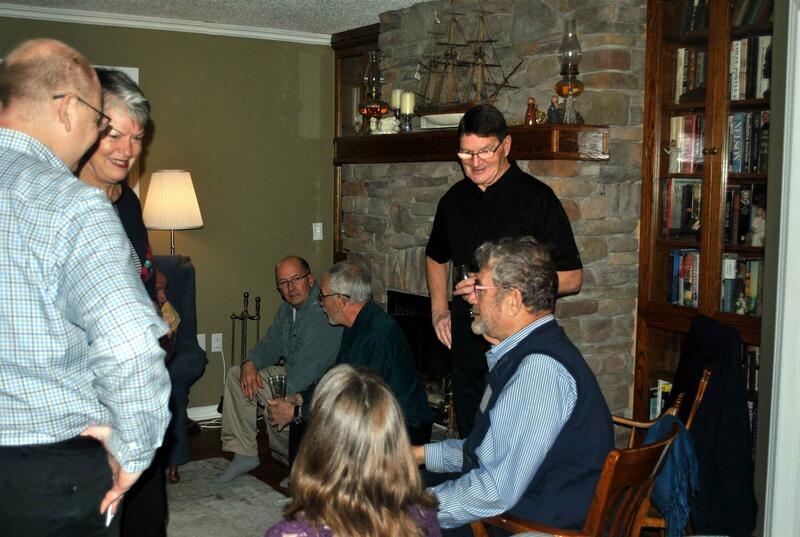 As the Lenten season is upon us, members of the club had an informal evening. 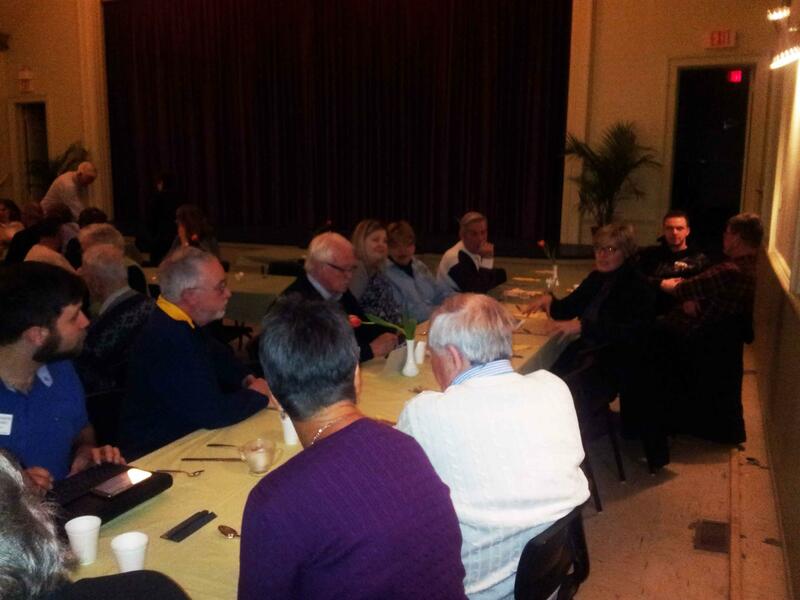 We joined together in fellowship at St. James Anglican Church for a delicious pancake dinner. Pictured below are members enjoying their meal and each other's company. Tonight's speaker was retired conservation office, John MacKenzie. 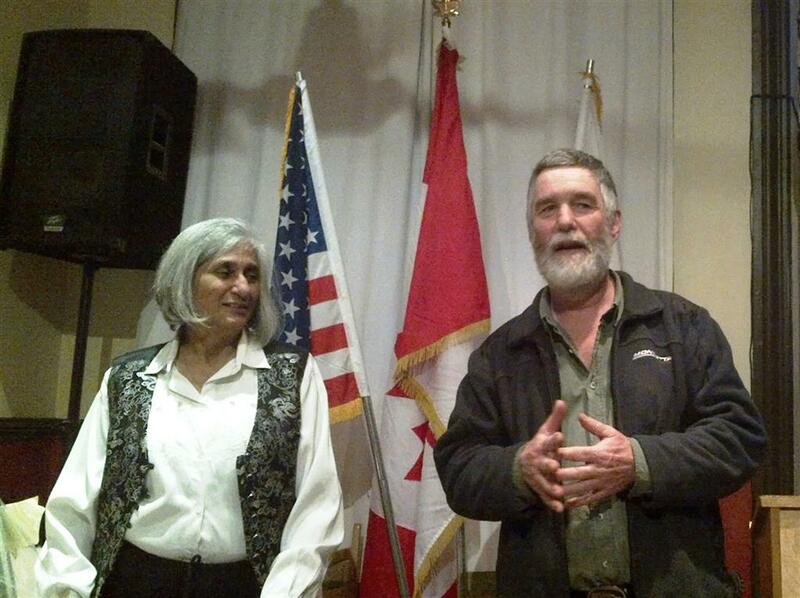 John spoke to the club about hunting and hunter safety. 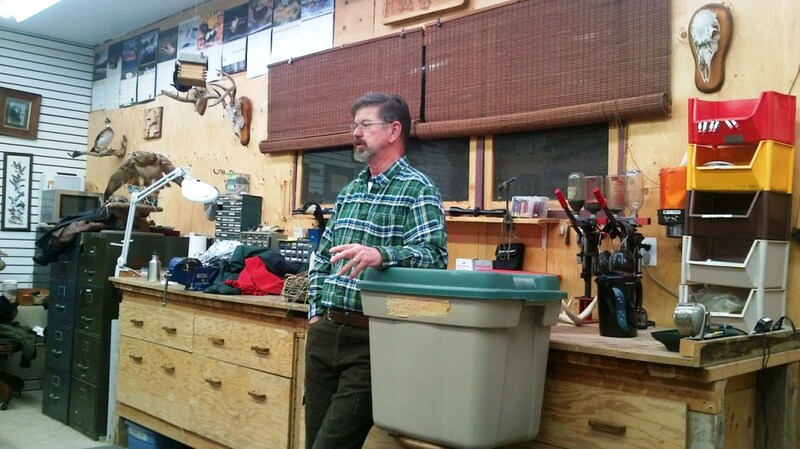 During his talk, John showed the evolution of safety in hunting. As well as safety, John also dispelled some of the myths surrounding the practice of hunting. Tonight our speaker was Josh Bennett who is with Ipsos Reid. Those who are politically inclined tend to think of poling as a political being. Ipsos Reid is the third largest poling company in the world and it was surprising to learn that political poling accounts for only 9% of their business. Josh took us through a polling process for the last federal election and explained how some of the questions are framed, and how some of those election night predictions come so quickly. A most interesting presentation was followed by a lively Q&A period. Tonight we enjoyed dinner at the Kemptville Youth Centre. Before dinner members enjoyed using some of the facilities (pictured above). Prior to dinner the centre's director, Robin Heald (below) gave members an update on KYC's services, usage and and future objectives. Following Robin's presentation, it was time to hit the food line. 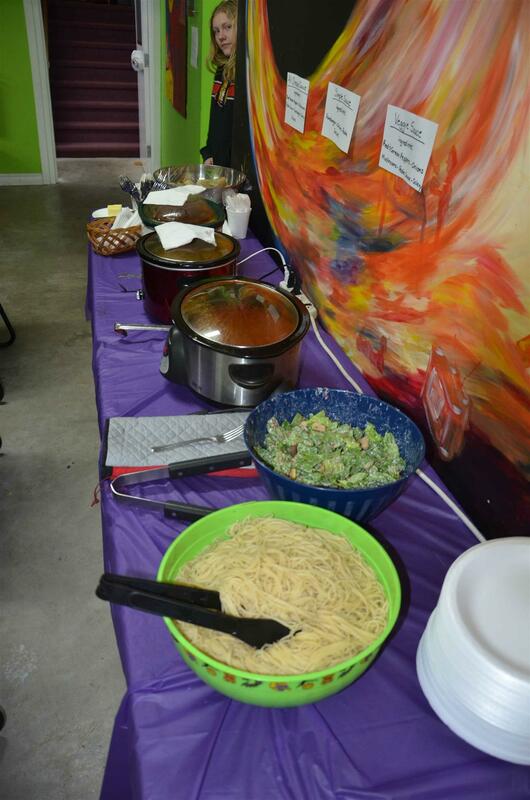 A delicious spaghetti dinner with various sauces, salad and juice was provided to us. A great evening. 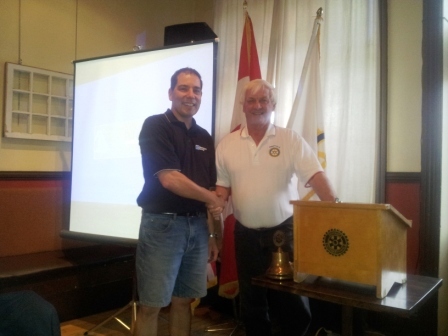 Our first speaker of the year was North Grenville mayor, David Gordon. Mayor Gordon spoke about where the municipality is and where he envisions it going. Club members enjoyed a very open Q&A period with the mayor. Also this evening, the club presented a cheque to the Harry Pratt Community Fund. 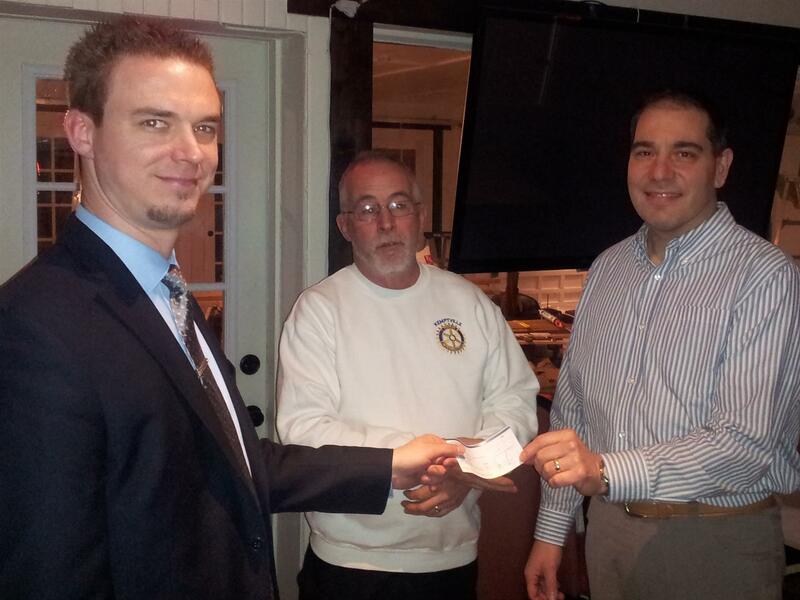 Pictured below is Rotarian Jeff (L) presenting a cheque to Rotarian Daren who also sits on the board of the fund. Happy New Year and best wishes to all for a safe and happy 2016. Please note our upcoming events and meeting locations. Members of our club took a break from its busy calendar to celebrate friendship at our annual Christmas party. We opted on a truly pot luck dinner​ and the meal we were provided easily surpassed what we would have had in a lot of commercial venues. Stories of Christmas traditions in foreign lands were shared as well as silent and Chinese auctions. A carol sing along capped a most enjoyable evening. 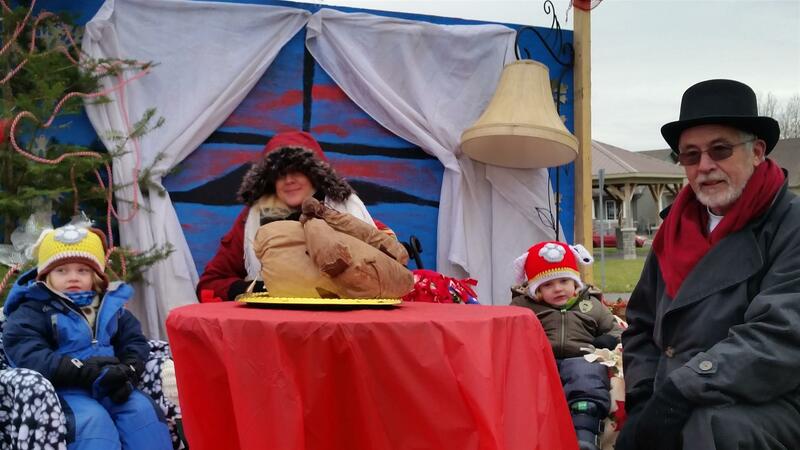 The weather was fantastic for the celebration of Kemptville's annual Santa Claus parade. Young and older alike enjoyed the parade with its many floats, a sure sign of our civic pride. Honourary Rotarian Harry Pratt was this year's Parade Marshall, a mark of respect for all that Harry has given to this community over the years. Our club's float once again collected food along the parade route for those who are less privileged than a lot of us are and we had a crew in Rotary Park providing comfort food and warm drinks to those who found themselves a bit hungry or chilled. ​ Pictured above are some of the kitchen crew that helped keep us warm and fed. 4-H Corn Roast and Visitors. This week Rotarians met at the home of Debbie and Daryl Brown for our annual 4-H corn roast where we and about 40 4-H members got together and enjoyed fresh corn on the cob and hot dogs. 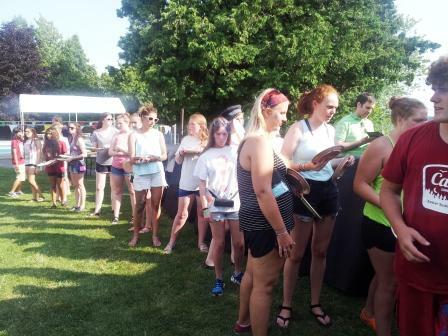 We were asked to assemble in the front yard after dinner and the 4-H club presented several members with awards for their 100th anniversary garden displays in various categories. 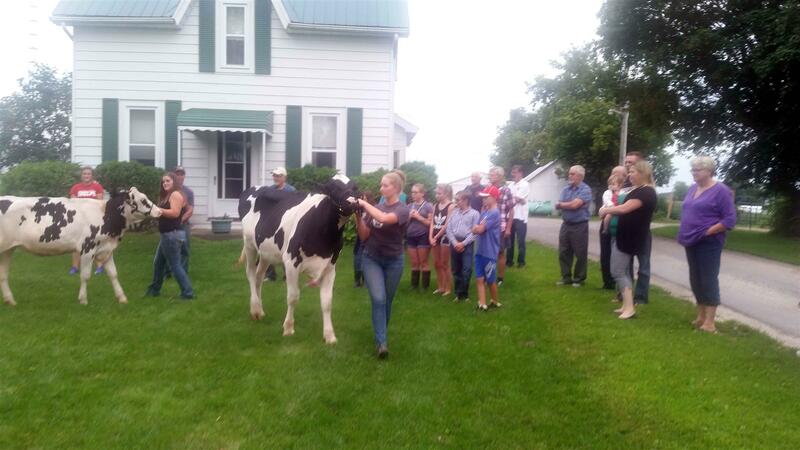 Then the 4-H club members lead a Holstein cow out and demonstrated how it is groomed for shows. The cow patiently put up with her tail being teased, baby powder put on to whiten her cream spots, and hair spray to keep the hair on her back standing up, and black polish to make her shine. Then it was time for photos and she continued to patiently stand there with everyone gathered around. Afterwards our Rotary club was presented with a 100th anniversary bench made by the wood working 4-H club members. Thursday August 27 was a special evening to meet our El Salvador, Noreste club friends and their partners. 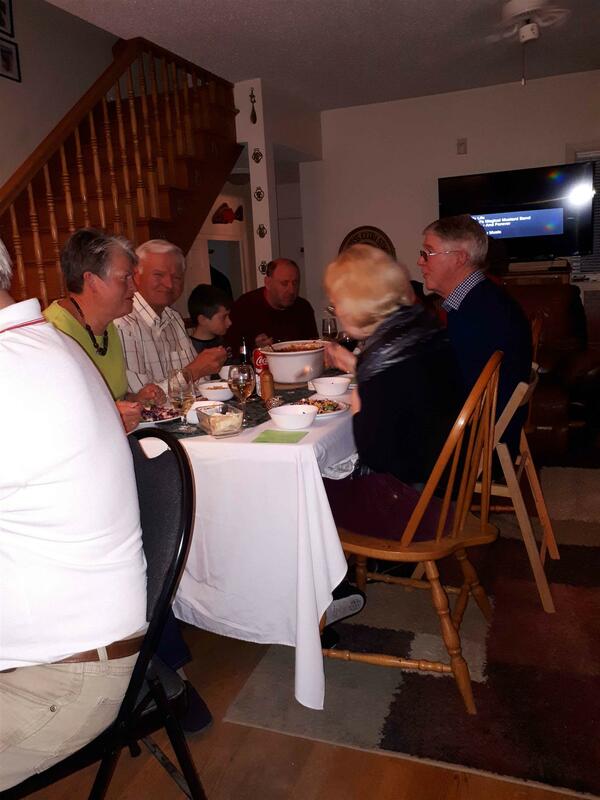 We had 8 Rotarians and two guests come over for a great evening of fellowship and reunion, especially for those who had gone to El Salvador as a team in 2012 and for those who have supported projects there. Tito shared with us some of the changes and growth in Telnique and we discussed our project for 2016. The project will include staying in the village, building latrines, building a fence around the day care, painting and setting up a play structure there, establishing community gardens, and a health clinic with our nurses and their doctors. 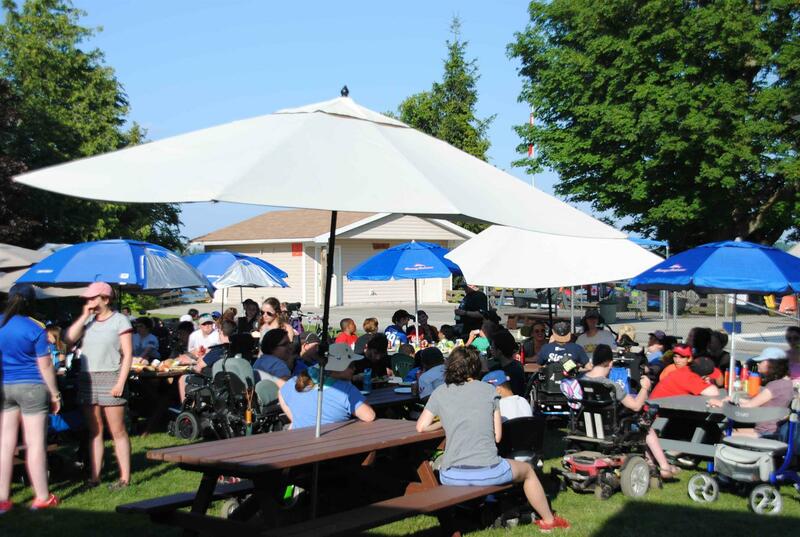 On a beautiful evening, our club hosted its annual pizza party for the campers and staff at Easter Seals Camp Merrywood. This event has been a tradition in our club for many years as has our affiliation with the camp. 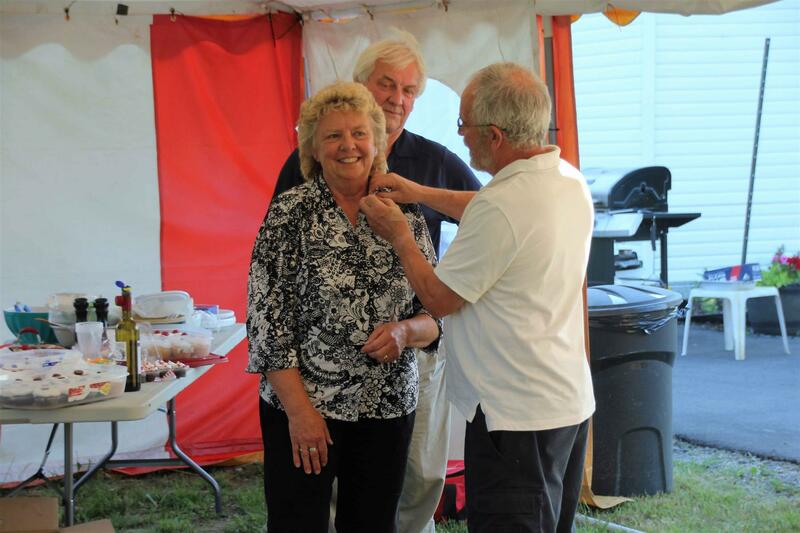 Our club's Queen, Norma serves up the first slice. And the line just kept going. Youth is one of the primary focuses of our club. Tonight we were visited by two short term exchange students, Elsa who is visiting from Belgium and Mallory who is sponsored by our club and will be traveling to Belgium. For more information on the District's youth exchange programme, click on the following link http://ye.rotary7040.com . 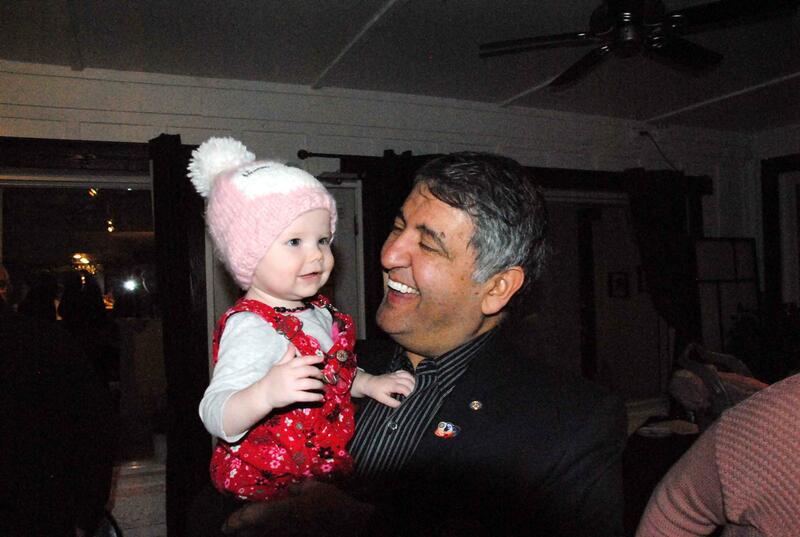 Pictured above left to right are Mallory, President John and Elsa. 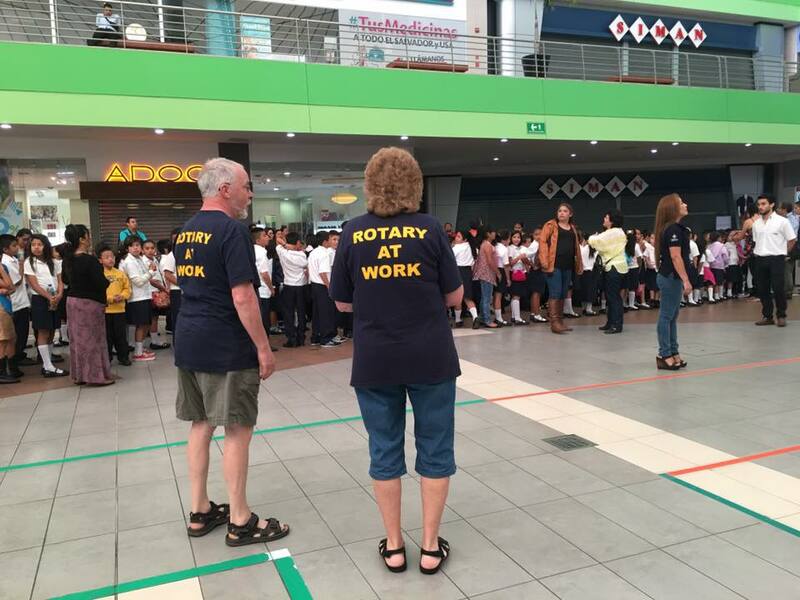 The new Rotary year began on Wednesday, July 1st. A contingent of our members met at Riverside Park to work a food concession in conjunction with the Canada Day festivities. 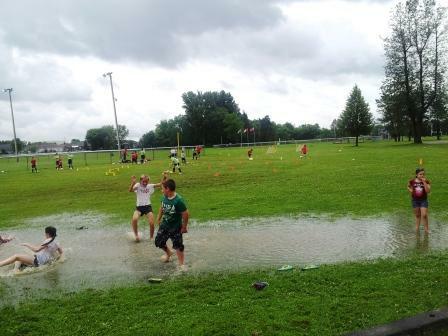 While the day was interrupted by staggered rain, some took advantage of the situation. It was great to see kids being kids. Our first official meeting of the year was held at Beking's Poultry Farm. Incoming president John took the members on a tour of the facility and explained their process to us. We have never seen that many eggs. 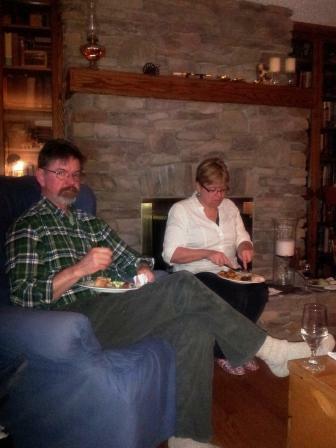 Following the tour, we retired to the house to enjoy the Presidential dinner. Steaks and chicken with all the fixings were enjoyed bythe membership. 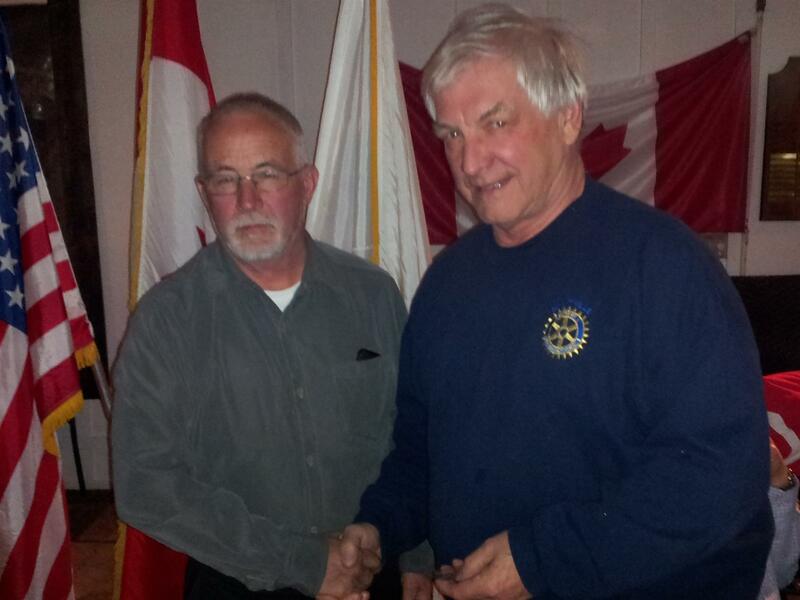 Following dinner, outgoing president Donovan presented incoming president John with his pin of office. The meeting concluded with Rotarian Rob being named Rotarian of the Year. Pictured below is Rob receiving his award. We were pleased to have the winner of the decoy section of our Annual Duck Race, Howard Wilson join us this evening as our guest. 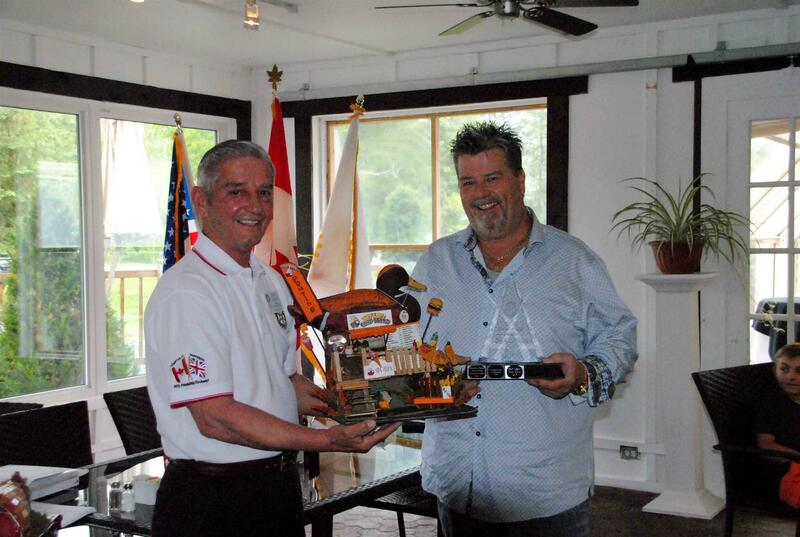 Pictured below is Howard with the winning decoy and President Donovan with the winner's trophy. 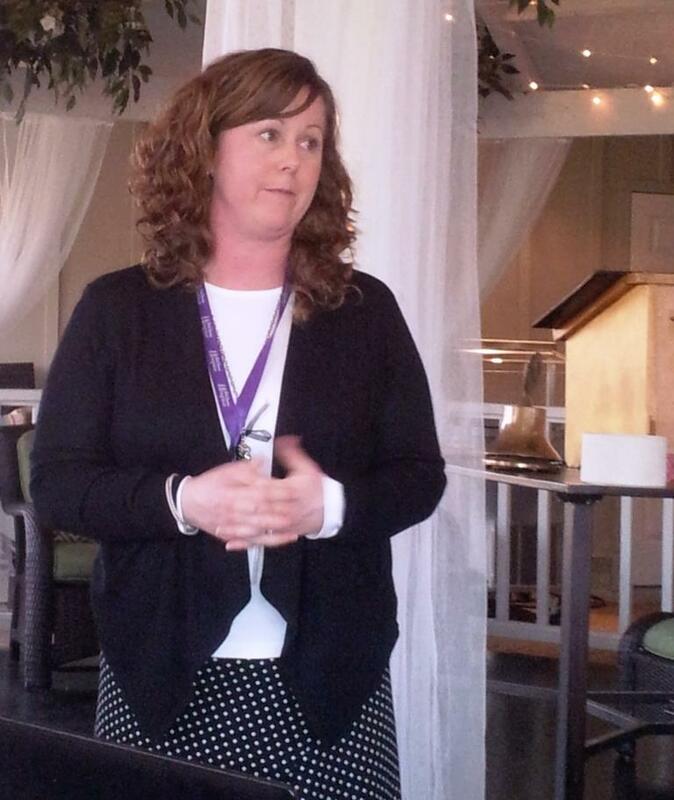 Our speaker for this evening was Dawn Rodger, Executive Director of the Beth Donovan Hospice. Dawn is a licensed funeral director who worked with a local funeral home prior to making the transition to Beth Donovan Hospice as a Volunteer Coordinator in 2008 and eventually to its Executive Director in 2010. She believes that Hospice is a calling and a lifestyle for her. Dawn began her presentation by showing a short video of three families who have experienced the Beth Donovan Hospice for what it is. She then gave a quick history of where the Hospice started and where it is today. It began in Merrickville at the St Ann Roman Catholic Church in 1992 and moved to Kemptville in 1997. Hospice has called Asa Street and the KDH home but has now resided at 25 Hilltop Crescent in Kemptville since 2013. In 2014 they started a Day Hospice at St.John’s United Church in Kemptville on Thursdays from 10am to 3pm and offer breakfast snacks and lunch, caregiver respite, shared experiences, yoga, reflexology and art therapy. As well a local automotive dealer has provided a vehicle that transports those who require it to and from the program. Dawn informed us that in 2013/14 they offered palliative care to 137 people and in 2014/15 have offered palliative care to 201; all at no cost to those who requiring their assistance. Beth Donovan Hospice provides compassionate support and professional care to individuals and their families as they journey through the challenges of life-limiting illnesses and end-of-life transitions. Whether in a home or hospital setting, the experienced staff and trained volunteers of Beth Donovan Hospice give of themselves to ensure that the families receive the assistance, support and guidance they need. If you wish to find out more about the Beth Donovan Hospice, on how to volunteer or to donate to their organization you can visit their website at www.bethdonovanhospice.ca or call them at 613-258-9611 or as Dawn said just stop by at their location 25 Hilltop Cres. Kemptville. We have had a busy couple of weeks at the club. 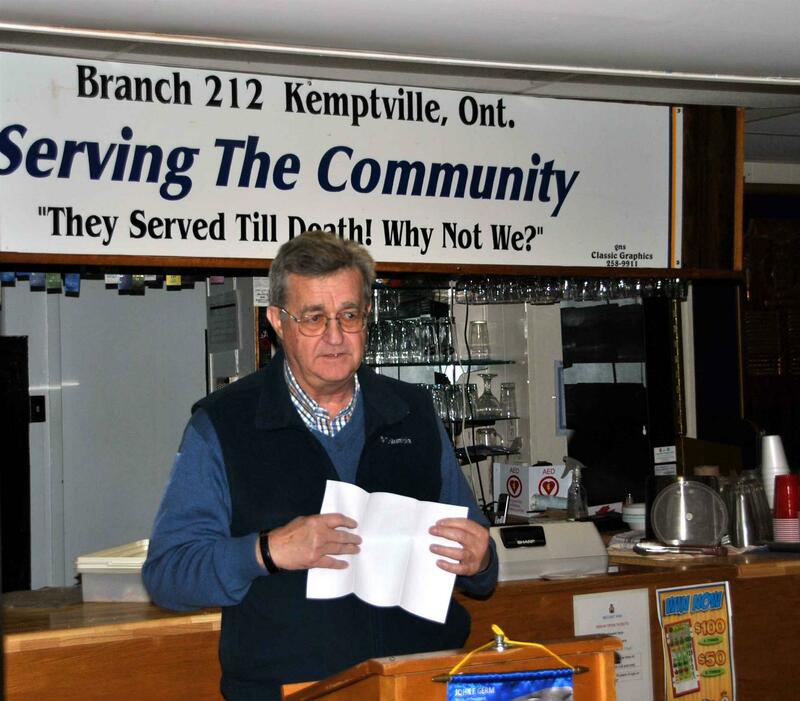 On April 14th, Mr. Dirk Visbach representing the Kemptville Players was our guest speaker. Kemptville’s longest running theatre company, which has been in existence since 1937, was started by G Howard Ferguson. It briefly closed from 1948 to 1950 when it reopened. In 1967 they performed out of Leslie Hall and were called the St. James Players and in 1974 the name was changed to Kemptville Players Inc. A move to the FJ Parish Hall from 1980 to 1990 was followed by a trip back to Leslie Hall from 1991 to 2005. The N.G. Municipal Centre has been their current home since 2005. Kemptville Players have won numerous awards for their productions and are always assisting the community in one way or another during various community events. They encourage new members and support existing members to develop their theatrical skills while providing opportunities for creativity and camaraderie. They accept all volunteers whether it is for acting onstage or backstage duties such as prop design, make-up and hair, costumes, etc. Their upcoming production is "The 39 Steps: A Live Radio Play" by written by Joe Landry and directed by Sandra Tobin. It will be staged May 8th, 9th, and 10th 2015 at the North Grenville Municipal Centre Theatre. Our speaker on April 21st was Dr. Gerasimos Kambites. Dr. Kambites is a 3rd generation Canadian of Greek heritage who was born and raised in Montreal. He studied at what was the Sir George Williams University in Montreal and following graduation, had an interesting and varied career. He was a videographer for the Transworld Snowmobile Expedition in 1973. That experience led him to Holy Cross Seminary in Brookline, Massachusetts and Sinai’s St. Katherine’s Monastery where he spent 6 months. Earning a Master’s in Divinity, he went to medical school at McMaster University in Hamilton, Ontario before heading to Uganda. He was ordained to the priesthood by the late Metropolitan Vitaly, founded Annunciation Orthodox Church on Bukasa Island and St. Xenia’s of St. Petersburg in Ottawa, eventually leaving the priesthood. He then studied psychiatry and now works as an Orthodox psychotherapist. In 2008, Dr. Kambites took part in National Geographic’s Genographic DNA tracking program. The greatest irony for him is that his genetic map marks him as having originated in East Africa, in the Northern part of Lake Victoria. By moving to Uganda, in a true sense, he was just coming home. His book, Tears on the Equator tells us of his life in Africa. Some advice he gave to those wanting to accomplish projects in Africa or elsewhere Internationally is that you should listen to the people on the ground at the because those are the folks who know what is really needed the most, a lesson he learned from experiencing this first hand. Like almost most things, when there is cooperation things work better for all involved. 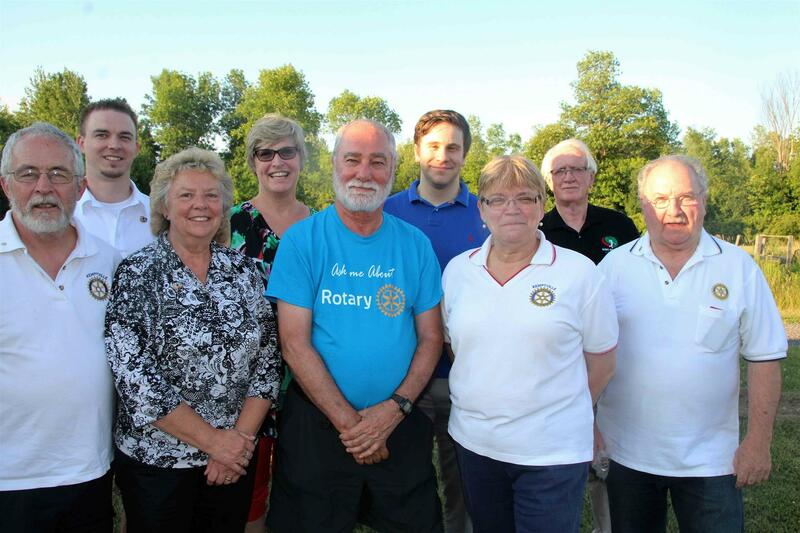 The Rotary Club of Kemptville has partnered for several years with the Rotary Club of West Ottawa on a cash calendar project to support community projects. 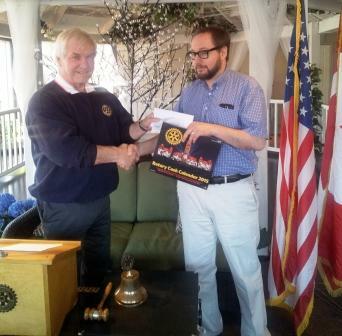 Pictured below president Donovan receives our club's share of the calendar proceeds from West Ottawa's Rotarian Brook. 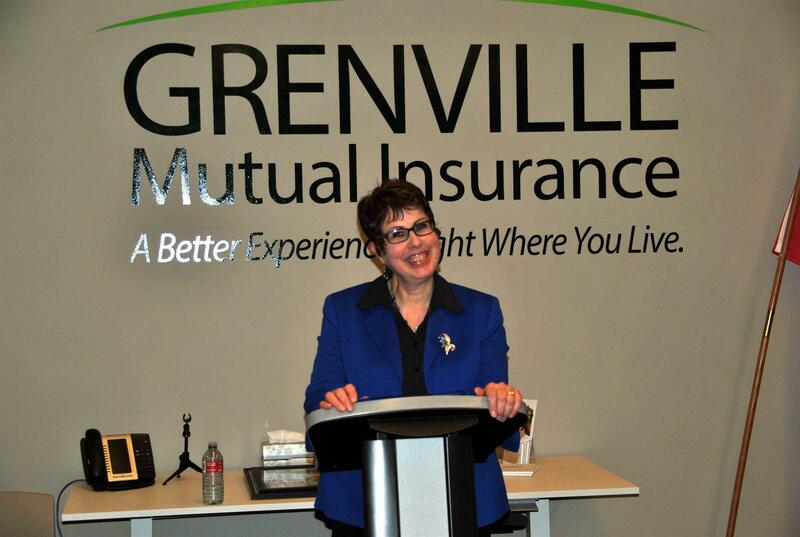 Tonight's keynote speaker was Jane Fullarton, Executive Director Big Brothers Big Sisters of Leeds and Grenville. The Big Brothers Big Sisters of Leeds and Grenville was founded in 1977 with one office in Brockville.The office in North Grenville was opened in 2011. The organization provides quality mentoring services for children. Over 879 children in Leeds and Grenville were served in 2014, 250 of which reside in North Grenville. They have many different programs;Traditional matches, Couples matches, Big for a day and Go Girls Game On. For Traditional matches you are asked to commit for 2-5 per week for a minimum of 1 year. There are currently 34 children on the waiting list for a Big Brother or Big Sister. While they are waiting, they participate in a program called Big Bunch and activities are organized and supervised by adult volunteers who are BIGS for a day. There is one outing per month and they have a variety of fun activities for the youth clientelle participate in. Further information on Big Brothers and Sisters can be found on their website http://www.mentoringmatters.ca. Jane was thanked for her in depth presentation by President Donovan. Our program director, Ben Vorano introduced this evening's speaker, Councillor Barb Tobin. 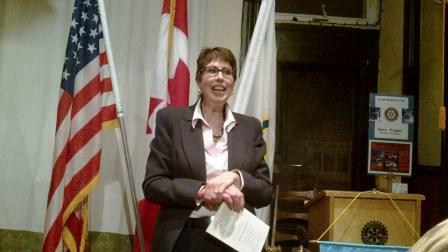 Councillor Tobin began by telling us a little of her childhood and why she is who she is. Born and raised as an only child in Cornwall, Ontario her parents were quick to tell her that yes she was special at home but she would be viewed quite differently outside her home, teaching her a lot about life. Growing up in a mixed faith family, she learned to navigate different types of people and their perspectives. She studied Graphic design as post secondary education and ended up teaching at North Grenville District High School when her husband was posted to the Grenville County O.P.P detachment. 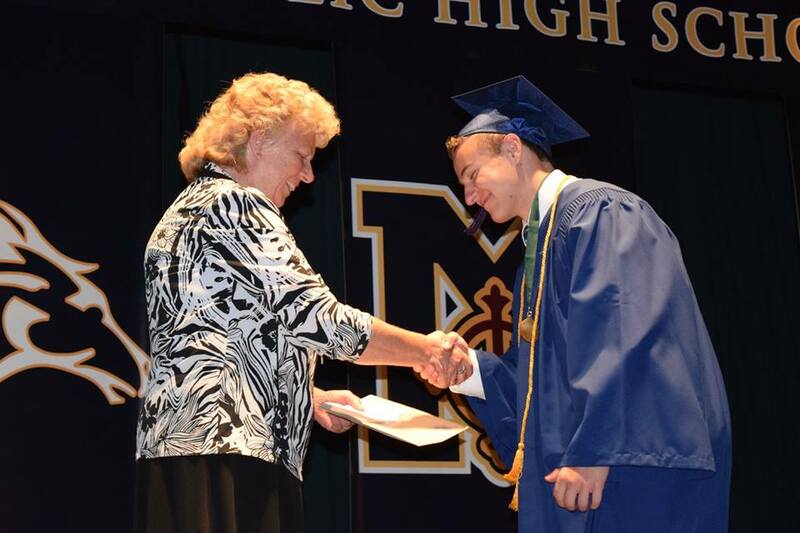 After teaching for 28 years at NGDHS she is still in her first year of retirement. Barb really enjoyed teaching at NGDHS and thinks teaching is the best reality show going, she loved it so much she worked past her retirement date. Entering her 3rd term in politics she is asked many times why she didn’t run for Mayor. She responded by saying that she wants to focus on volunteering more in the community. She has taken the Hospice Volunteer course and has done some volunteering at the Salvation Army sorting canned goods, a job she always wanted to do. 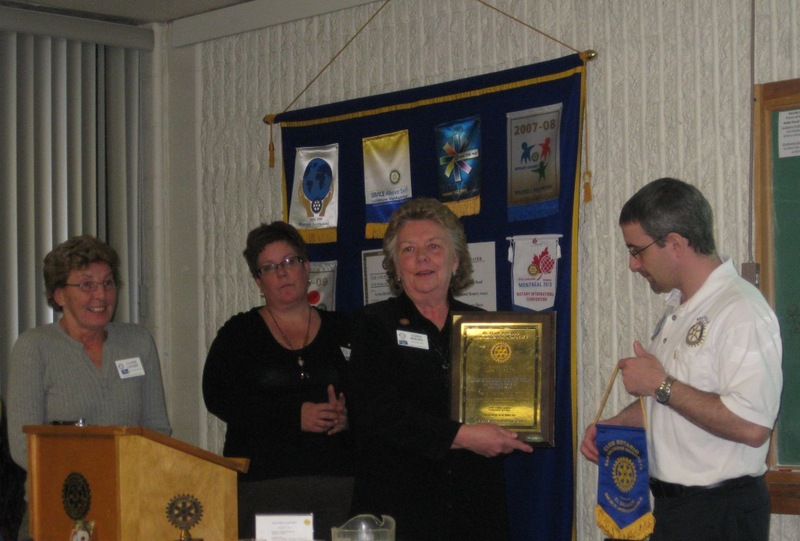 Barb thinks very highly of Service Clubs and thinks they are “the backbone of the community”. 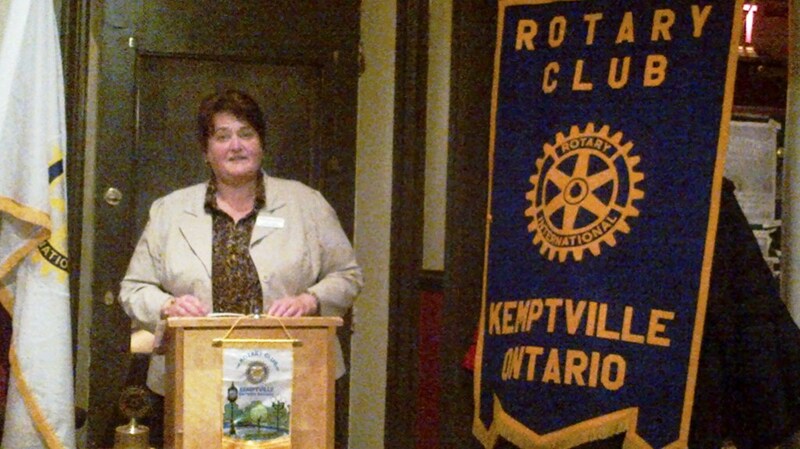 Barb touched on some points of interest in Kemptville. The Highway 43 expansion is vital with our community’s continued growth to allow people to flow into our community without too much restriction and traffic. The Kemptville College is a big project that has a lot of work yet to be done. Councillor Tobin was thanked by Rotarian Jenn Franssen who is a fan of Barb because she knows how much she advocates for youth in our community also thanked her for sharing about herself. 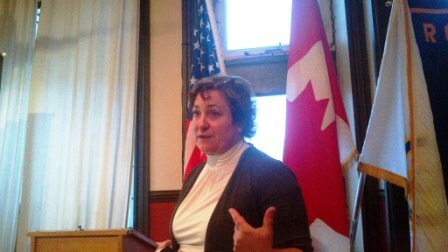 Our speaker this evening was Cathy Sheppard from Sheppard and Associates, accountants and tax preparation specialists. Cathy shared with us information about tax deductions that we can get which a lot of us aren’t aware of. These deductions could ultimately either save you money or enhance the amount of your refund. Her presentation was filled with tips on tax filling and was at times quite candid. 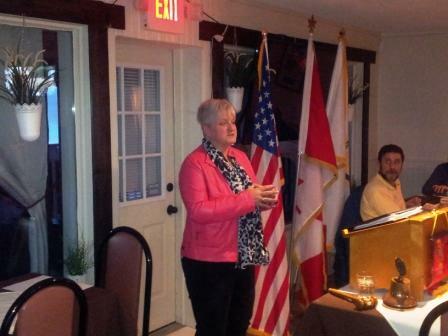 Pictured below, Cathy engages our members. 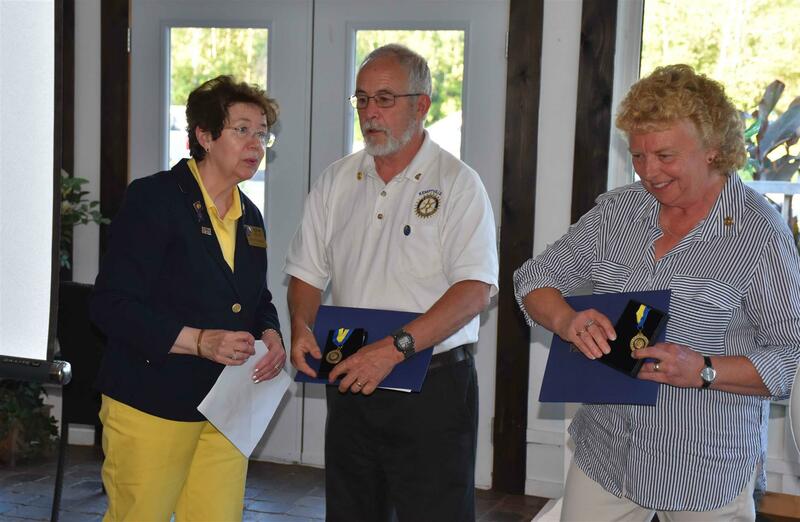 Members of the club had a twofold reason to celebrate tonight, the first being the induction fo our newest members; Rotarians Bob, Jeff and Joanne. They are pictures below with their sponsors; Rotarians Donovan, Jennifer and Gord. 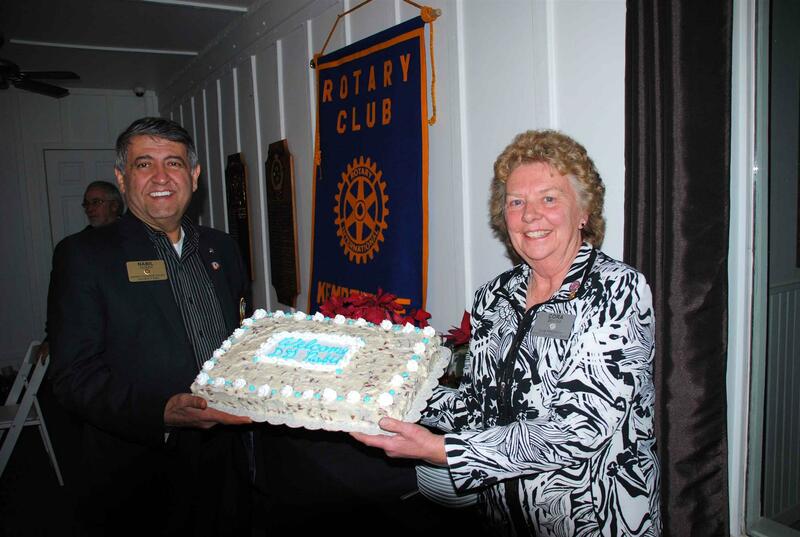 Also in the photo is our membership chair, Rotarian Nancy. 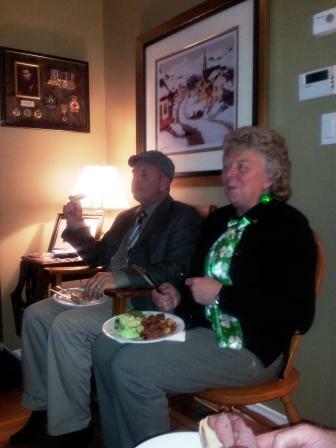 Following the induction ceremonies, members of the club celebrated St. Patrick's Day with a delicious pot luck supper. No one went home hungry! Tonight's guests were Michael Pacitto and his wife Ness McCutcheon. 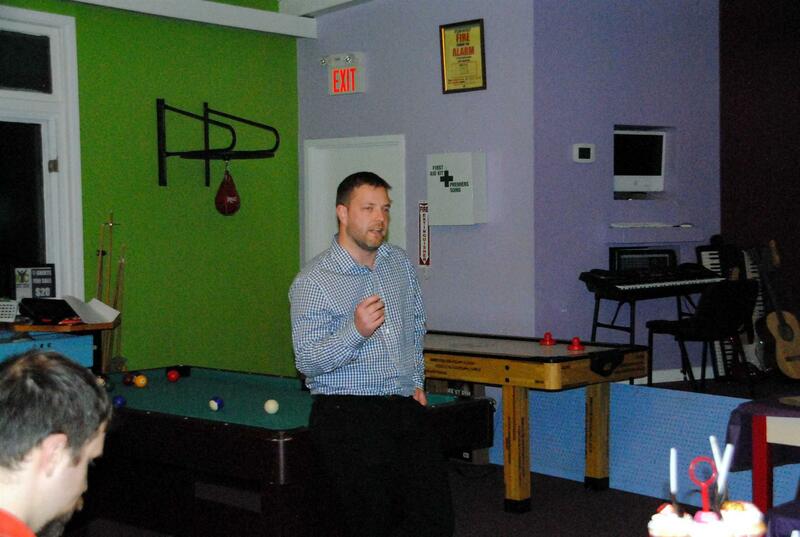 Pictured below, Mike gave our club members an overview of their background and business. Mike is originally from the area while Ness hails from New Brunswick. Mike and Ness moved from the Ottawa area back to North Grenville to assist Mike's parents with our local paper, The North Grenville Times, where he does the graphics for the paper. They also run a photograpny business, Mike+Ness Photo. Their photography business came from their mutual love of photography. They participated in some shows in Toronto and found that people were willling to pay them to take their photos. Their website www.mikenessphoto.com reflects that they specialize in Weddings, Band Promos, Business Headshots and Real Estate. Mike also mentioned that they have done website and graphic design, video production. Mike says that they are at a turning point in their business and they are going to go into video production. 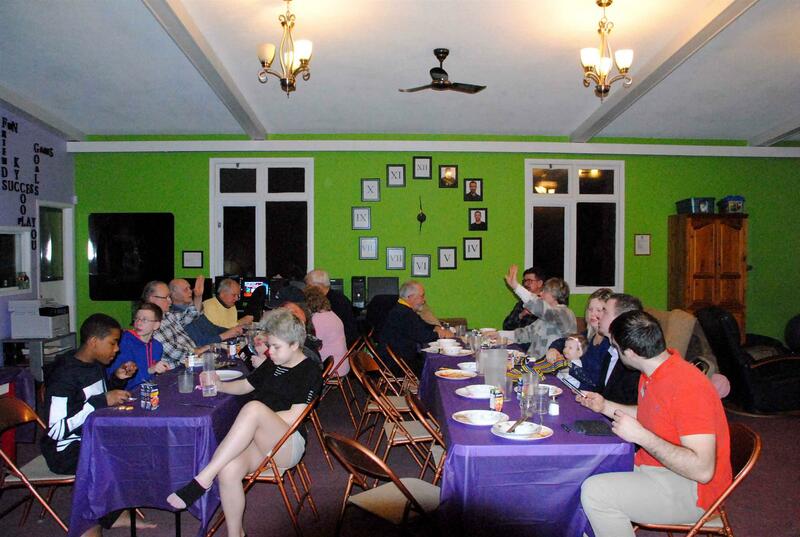 Last week's meeting was an informal pancake dinner at Leslie Hall to mark the commencement of the Lenten season. Tonight's meeting was devoted to club business as we had some catching up to do. 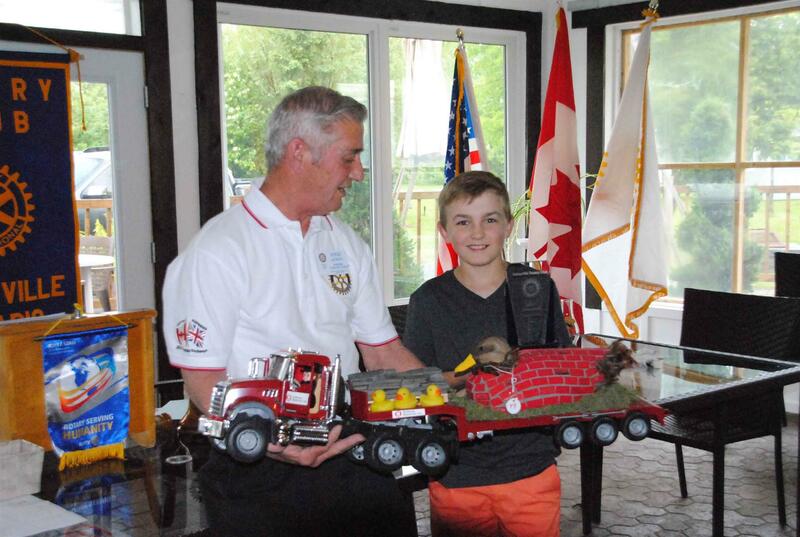 President Donovan informed us that the Municipality of North Grenville has invited us to participate in this year’s Canada Day festivities which will be held at Riverside Park. The theme is going to be “Old Fashion Family Picnic”. It is up to us in what capacity we wish to help, whether it is as food vendors or just volunteers, it remains entirely up to the club. 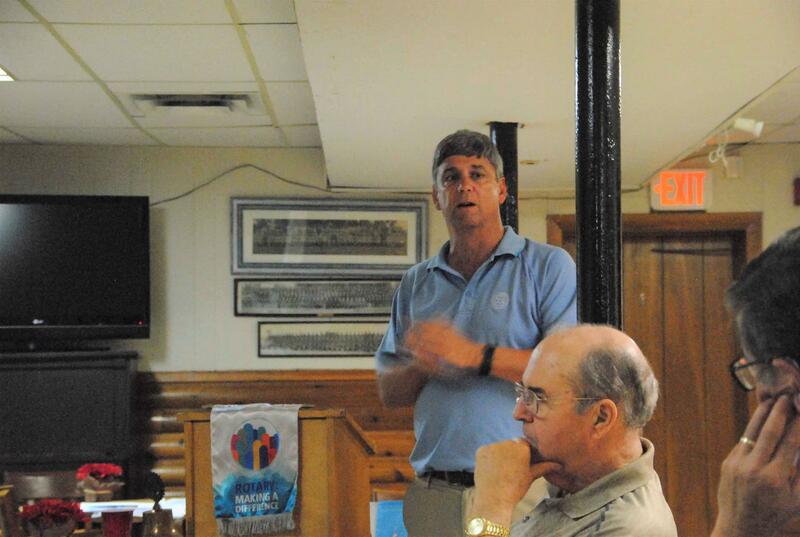 Rotarian Rob spoke about the cash calendars. We were shut out last week but managed 3 winners the week before. Our total for the year now stands at 10 winners since January 1st. He also mentioned that the Rotary Club of West Ottawa has received their cheque and will be attending in the coming weeks to deliver a cheque for the proceeds that we earned by selling the cash calendars. 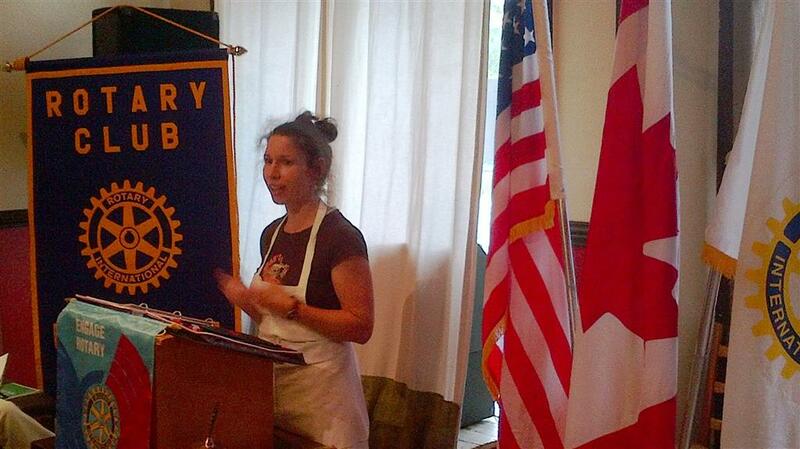 Youth Committee Chair, Rotarian Jenn spoke about the upcoming North Grenville Rotary Science Fair. It is happening on Friday March 27th at the North Grenville District High School from 8am to 2pm. The organizer of the event Matthew Wilson is looking for volunteers to act as judges for the event. Jenn passed out an itinerary for the day in case anyone was interested in judging or just to stop in and take a look at the various projects. If you are willing to be a judge please contact Matthew by February 25th at 613-258-3481 or email him at Matthew.Wilson@ucdsb.on.ca. President Donovan spoke about the Bike Rodeo. 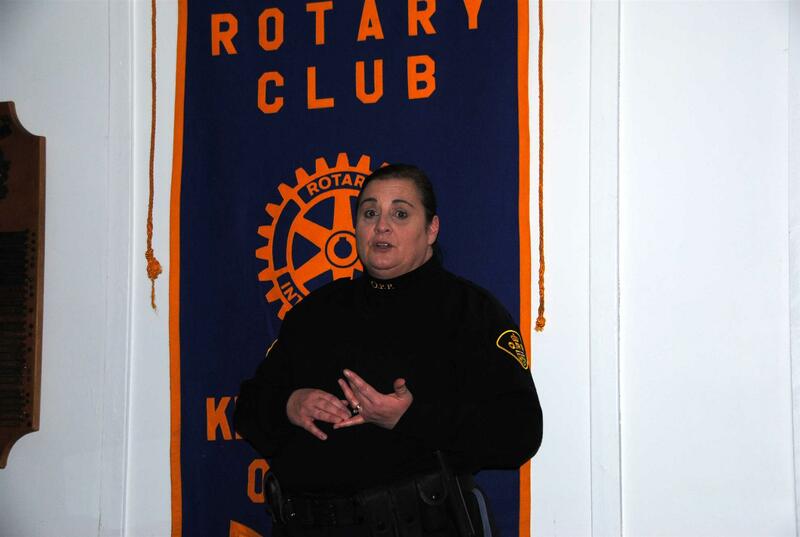 On February 17th O.P.P Officer Cathy Lindsay came to the club to speak about a project that she was heading up and asked if we were interested in helping with instead of conducting a bike rodeo. She has planned a day at the skate park for BMX biking and skateboarding on the first Saturday after school ends for summer break. The official date is Saturday June 27th 2015 and the location is the skate park at Riverside Park. We could be in charge of the food and Gord has mentioned he could provide entertainment. The Police Services Board are providing shirts and the health unit will be there ensuring all skate park users are wearing their helmets properly. We as a club agreed to help as a partner in this event in lieu of a bike rodeo. Storm Internet was founded in 1996 with a motto of “Rediscover Customer Service”. With customer driven support and service serving over 8000 square kilometres, Storm provides many personalized services including...Internet (in various forms); D.S.L. ; Wireless; Fibre Optics; WiFi “Hotspots” and Phone- Voice over IP- Internet Protocol. They are a company that is looking to provide rural areas with the best internet that they can get. Myles started his job with Storm in February of 2014 and is one of 30 employees that make up the Storm Internet’s company. 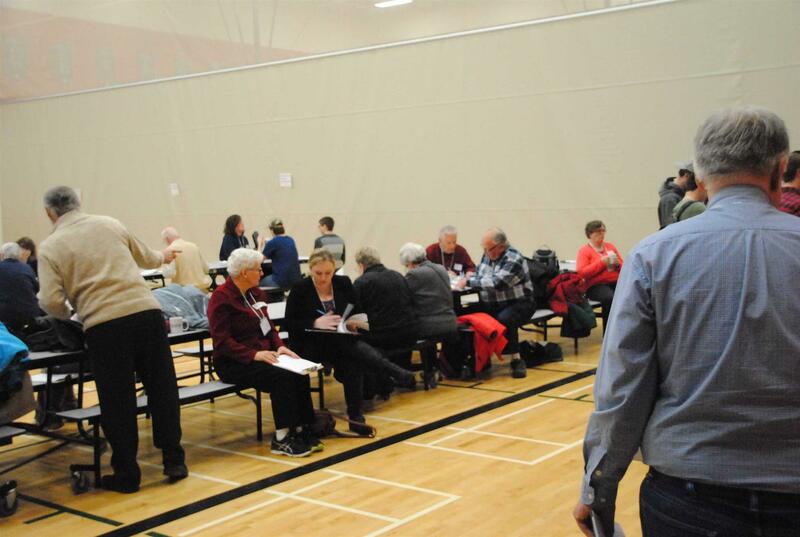 Myles spoke about the Ottawa Valley South Project which is enabling places such as Campgrounds; Yacht clubs; Centre Towns; Trailer Parks; Housing Developments, to access Internet services not otherwise provided. They also facilitate fairs and festivals receiving internet services which in turn help the businesses there sell their goods via debit and credit card transactions. Myles mentioned that Internet benefits and Community in many ways be it through education and schools, businesses, government and tourism which go hand in hand and finally events such as fairs and festivals. 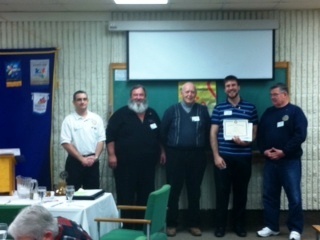 Rotarian Rob thanked Myles on behalf of the club. 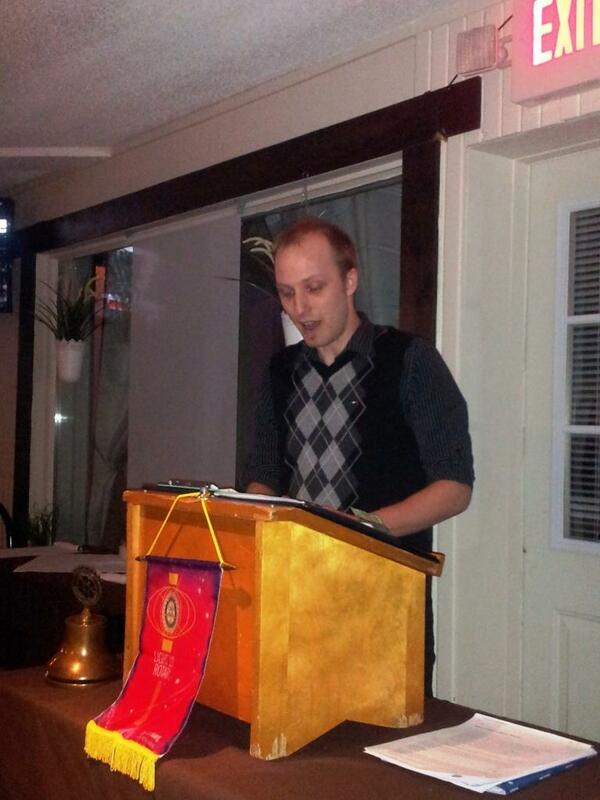 Rotarian Ben had a split format this evening as he covered the topics of hunger and oral cancer. Ben discussed how he had found the Hunger Awareness Day to be a fun event to participate in. Based on what he discovered, he decided instead to quiz us all on how much information we had on Canada’s food banks and how many citizens utilize their services each year. -Just under 900,000 Canadians turn to food banks each month. 93,000 are using them for the first time. There are currently only 800 food banks in Canada. A total of 14 MILLION people per year use a food bank. Basically, the equivalent of the entire population of Ontario! This information certainly gave cause for reflection. Ben continued on with the second part of his program and spoke about Oral Cancer, the third deadliest cancer. Close to 43,250 people are killed in the U.S. each year. Average of 1 person per hour per day! Often oral cancer is only discovered when the cancer has metastasized to another location, most likely the lymph nodes of the neck. Prognosis at this stage of discovery is significantly worse than when it is caught in a localized intra oral area. Besides the metastasis, at these later stages, the primary tumor has had time to invade deep into local structures. Ben recommended that at your regular Dentist appointments you ask for a thorough exam of your mouth because early detection is the key to successful treatment and a longer life span. 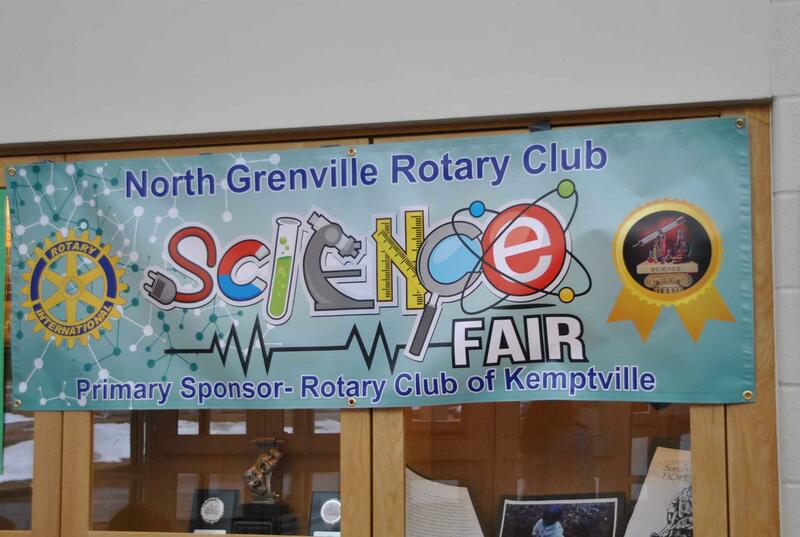 The Rotary Club of Kemptville has donated $1,000 to North Grenville District High School (NGDHS) for its inaugural intermediate science fair scheduled for Friday, March 27 from 8:00 a.m. – 1:30 p.m. 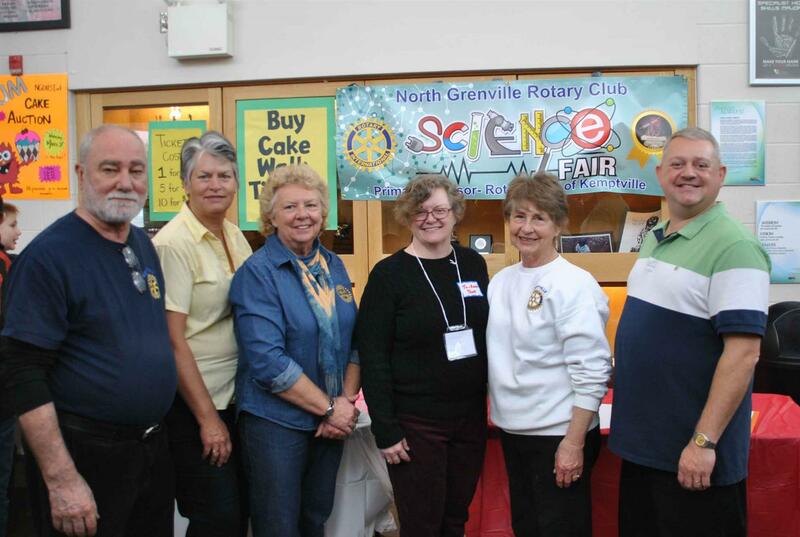 The science fair, which will be named, “The North Grenville Rotary Science Fair,” is spearheaded by teacher Matthew Wilson. Last October, Wilson presented at a Rotary meeting where he talked about the importance of science in the lives of students. He shared his wish to create an annual science fair at the school. Following his presentation, club members decided to donate funds to help make Wilson’s idea a reality. Wilson, who has been teaching for 14 years, but is new to NGDHS, has hosted science fairs at a number of schools. But, his new goal is to create a science fair at NGDHS that grows each year to involve secondary grades and students from other schools. This year’s fair will be open to students in Grades 7 and 8, and will involve community judges. Student participants will have the opportunity to win Best of Fair, Best Visual Display, and an environmental naturalist award sponsored by the Ferguson Forest Centre. 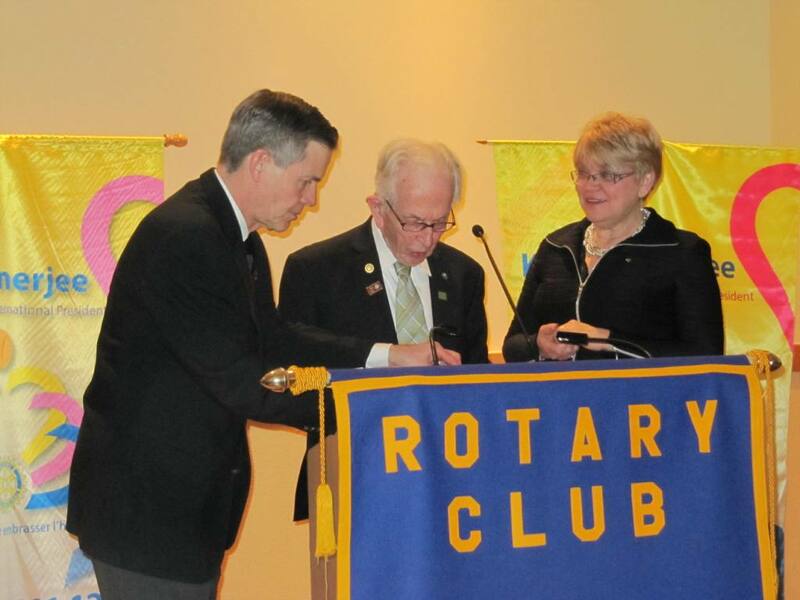 Pictured below, Rotarian Rob Horning persents a cheque the school. Our club participated in Rotary Hunger Awareness Day on Saturday January 24th with several of our members participating in baking goods for needy families in our area. Many thanks go out to all who participated and special thanks to Rotarians Cora and John for making the arrangements and taking care of all the leg work involved in such an endeavour. 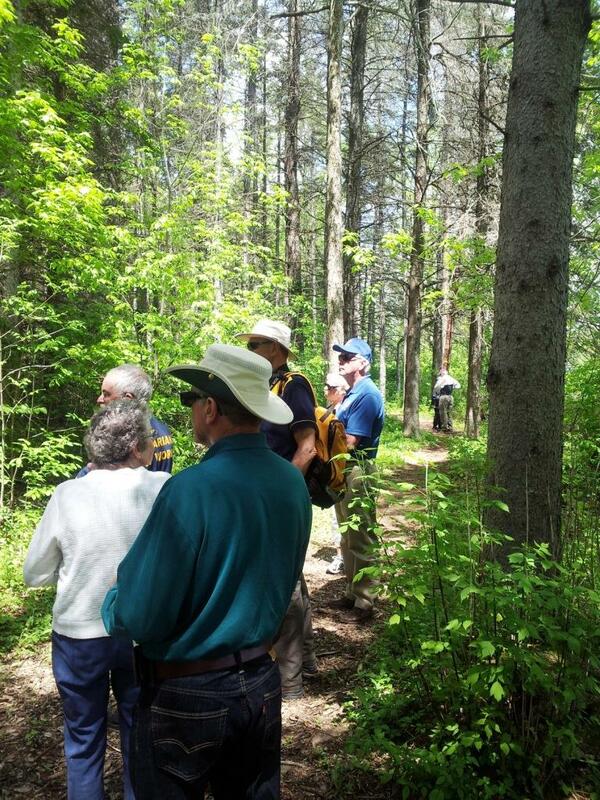 Members of the club enjoyed a great day outdoors at Rotarian Nancy's. 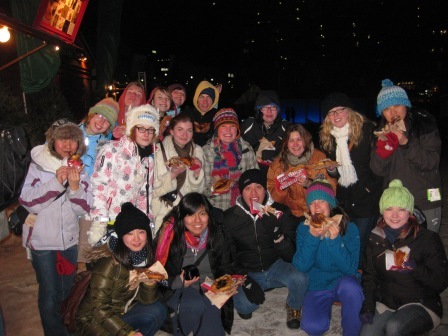 Part of Canada is winter and club members made the best of it with a sleigh ride. 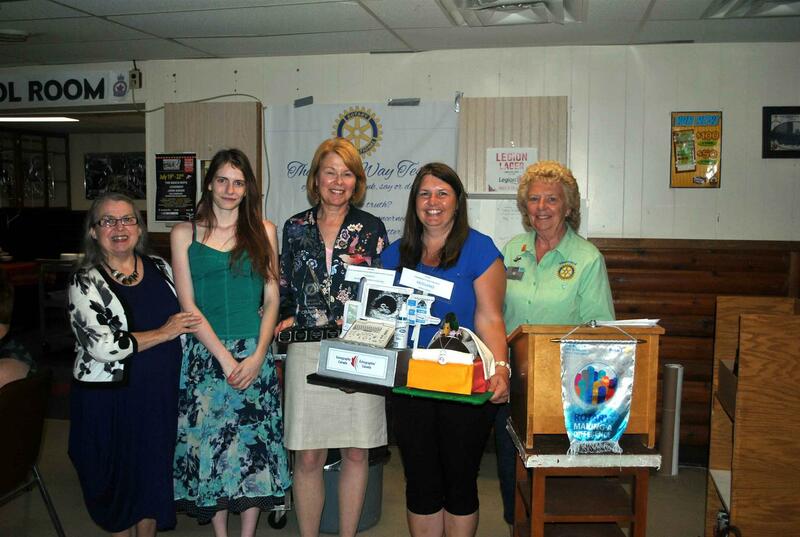 The club recently participated in the sale of mums in partnership with the Rotary Club of West Ottawa. The proceeds of this fundraiser are earmarked for our club's youth programmes. 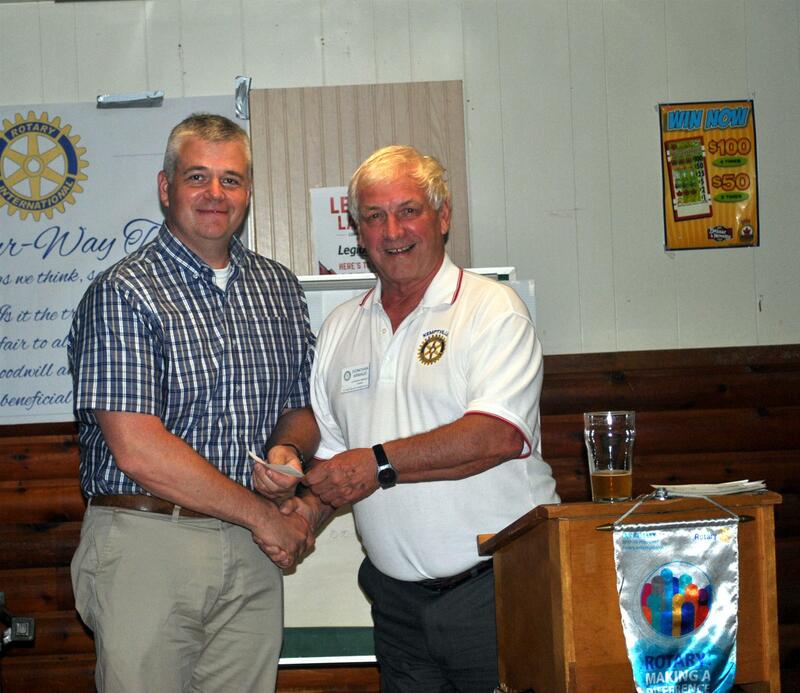 Pictures below is Rotarian Darren receiving a cheque for our share of the sales. No one in our community should go hungry. With Rotary’s help, no one will. 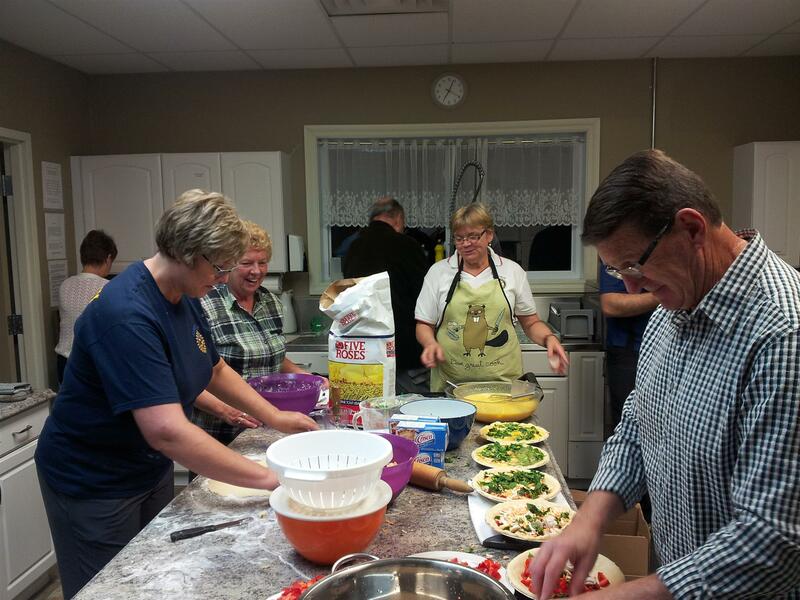 24 January 2015 the Rotary club of Kemptville and local churches are joining forces to combat the issues of hunger and food insecurity in our community. 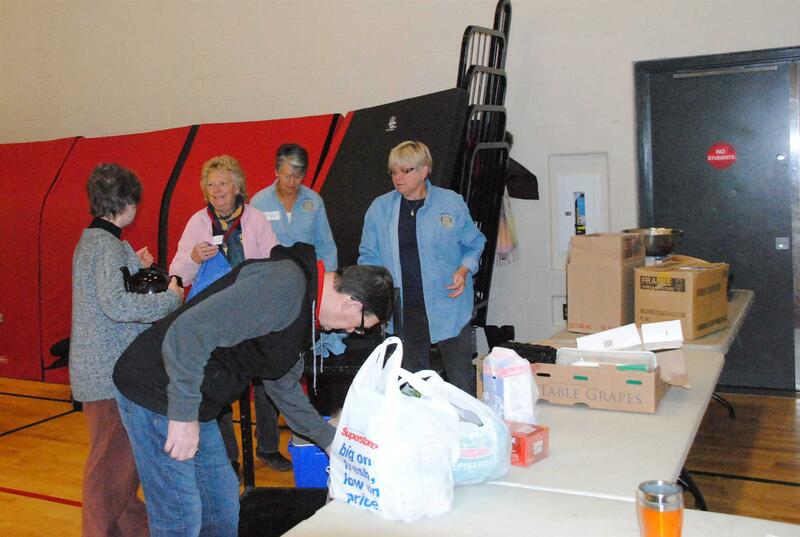 Members of the Rotary club of Kemptville will collect donations for the House of Lazarus at the churches of Kemptville to assist people and families who are having difficulty obtaining adequate healthy food. Donations of non-perishable food and cash will be accepted next Sunday Jan 25th. Organizers from the House of Lazarus have stated that they cover a wide geographic area and the need is great. Any donations and help are always appreciated. After our Christmas break, tonight's speaker Carolynne Doucette spoke to us about Bowen therapy. Bowen therapy is a unique, noninvasive muscle and tissue therapy. Through sequences of precise and gentle moves applies over areas of the body rich in sensory receptors, the body is encouraged to relax and reset or rebalance itself at a cellular level. The body is then able to let go of old patterns of pain and tension, restoring itself to a state of balance and wellness. Pictured below, Carolynne applies touch to volunteer, Rotarian Jennifer. Tonight’s guest speaker was Fred Heller from Trillium Housing. Fred was here tonight to speak to the club about the downtown condominium development. He represents an investors group in residential housing. Fred advised that they had bought the old Scotiabank building and woudl be renovating it into a sales center, construction on that to begin in the next few weeks. Mr. Heller stated that he doesn’t have much info on the specifics of the building itself because that is not his area but he did mention it would consist of enough units for 100 families with the prices of the units ranging from $150,000.00 for studio sized to $500,000.00 for penthouses. There would be no rentals. He hopes this is a catalyst to bring more people in and could be a prototype for other small towns. If all goes well construction would begin in the Summer of 2015 with 9 to 12 months of construction of the concrete framed building. You could see the first occupancy in2016 and completed in 2017. There would be no commercial outlets in the building, it would be all residential. Fred was thanked by president Donovan. 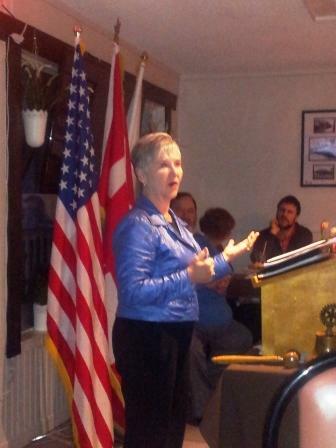 Tonight's speaker was MGen Christine Whitecross, Canada's chief military engineer and a fellow Rotarian. General Whitecross has previously spoken to our club about the role our military engineers have played in Afghanistan. Tonight due to a last minute glitch with the availability of AV equipment, she modified her presentation to explain how a small town girl from Chalk River became Canada's top military engineer. The membership probably enjoyed the personal touch of this presentation more than they would have the prepared one. That being siad, it is hoped that we can have her back to do her planned programme. 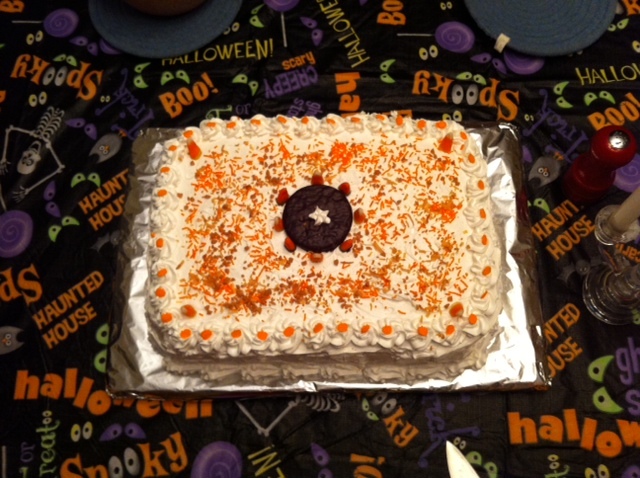 Members of the club got together last Saturday for a potluck halloween party. Some creativity was noted in the costumes worn. 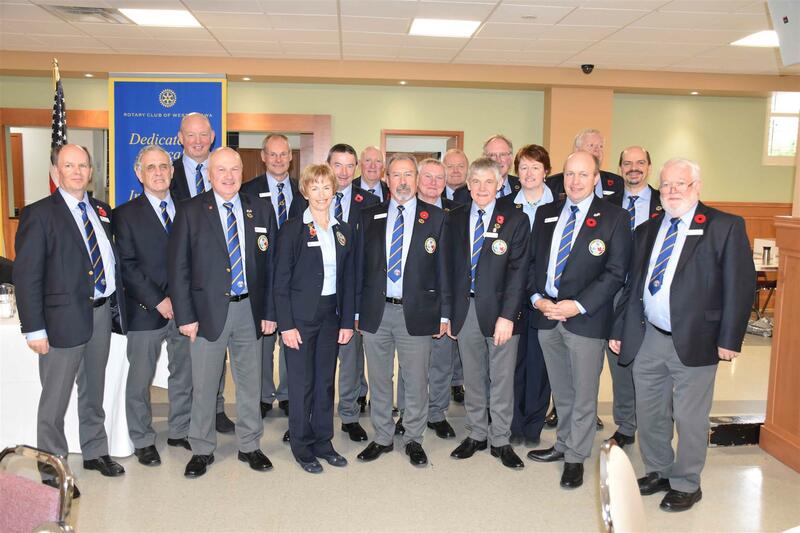 Rotarians from D7040 will be getting a taste of Rotary in Scotland all through the month of November as part of the 2014 Canada to Scotland Rotary Curling Tour Team. You are invited to follow the team through the Team Blog – www.canada-scotland2014.com and on Twitter @CanadaScot2014 . During the tour the team will be posting both the curling results and some of the off-ice highlights. Visit the Blog now – have a look and bookmark the page. 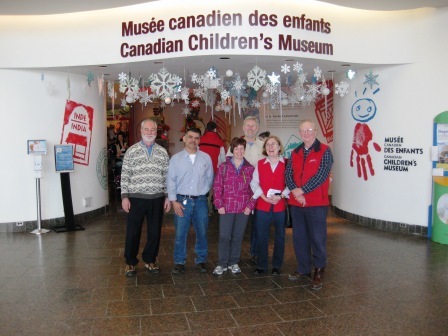 22 Rotarians from across Ontario and Quebec will be visiting 12 different locations across Scotland this year. While in Scotland the team members will be staying with and curling against local Rotarians in each area. 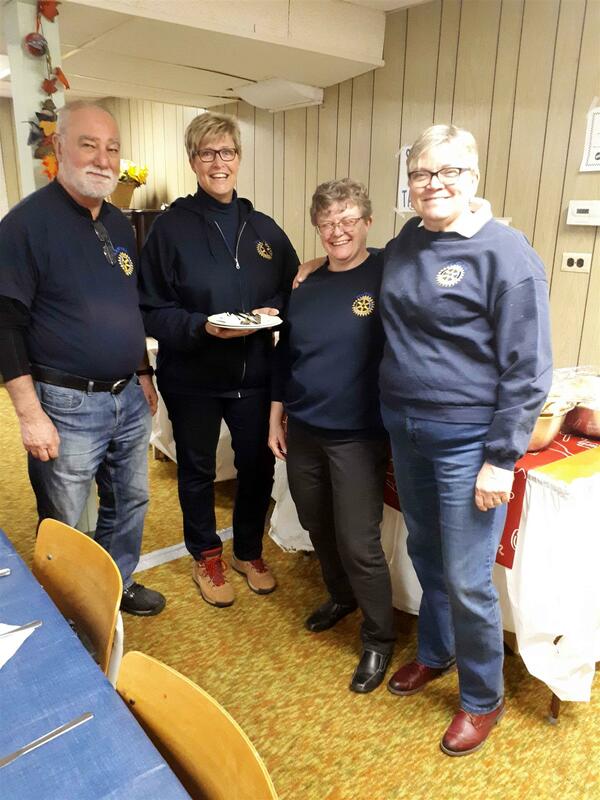 Canadian and Scottish Rotarians meet and compete for the Transatlantic Rotary Curling “Quaich” every 2 years – alternating play between Canada and Scotland. The first tour took place way back in 1956 – and has been going strong ever since. The scores of all the games played at a dozen different curling rinks over the month are added together to determine the winner that year. The 2014 team from Canada will be out for revenge after the touring Scot’s won the Quaich while touring Quebec and Ontario in 2012. Curlers from D7040 are Sherri Agnew (Captain) - Kingston , Bill Beattie- Kingston and Dave Pelletier (Sgt. at Arms) from Kemptville. Joining us as guests this evening were Carole Pollock and Odette Leger representing People First North Grenville.This organization is a self-advocacy organization, committed to creating a supportive community for people with intellectual disabilities and reaching out to people who may be in need of guidance and support. 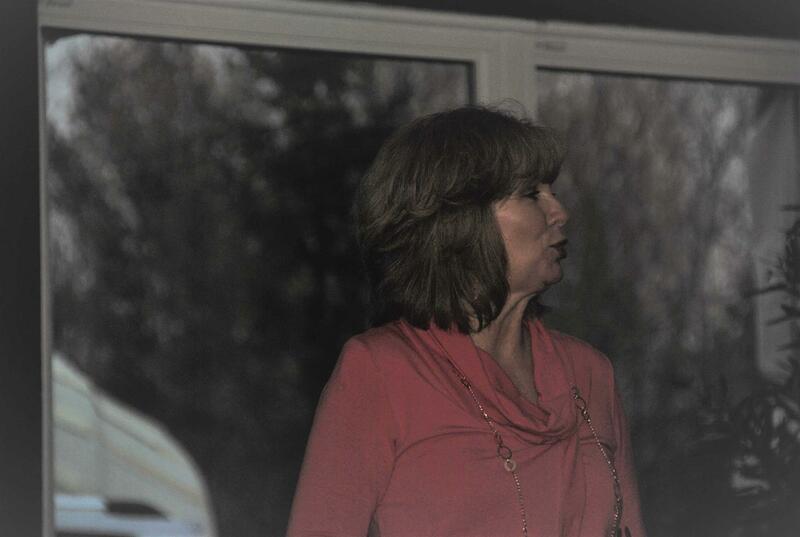 Carole presented a brief slideshow on the history of People First, explained what it is all about, its benefits and their mission statement. Carole also had information on how to get involved and news on upcoming events and activities. A fundraising BBQ at the Kemptville Legion will be held on Sunday Oct 19 from 12pm to 2pm, followed by a dance from 2pm to 6pm. Tickets are available at the door. Carole and Odette were thanked by President Donovan. Tonight’s speaker was Mr. Matthew Wilson, an intermediate school teacher at North Grenville District High School. Matthew has taught intermediate school for his entire 14 year teaching career. Matthew believes that science fairs are a great chance for students at all levels of learning. Ultimately, Matthew is looking to start the science fair at N.G.D.H.S. this coming spring and is looking for support from our Rotary Club. His goal is to expand it to the high school level and eventually the community but must first create the culture for it in the school and then work on that base. Returning from a western tour, Rotarian Mark presented President Donovan with a banner from the Rotary Club of Brandon Sunset. 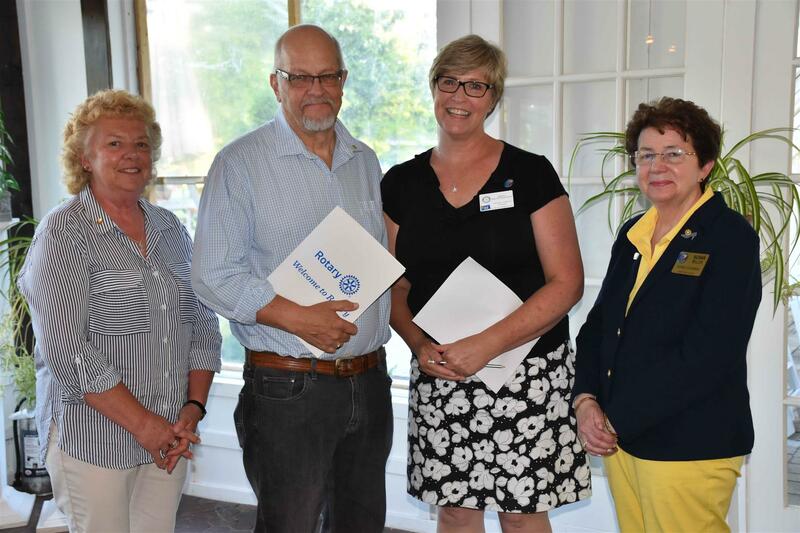 Rosemary Wrong recently attended a meeting of our club to receive a special Rotary International Benefactors Certificate on behalf of her late father, Mr. Jim Wrong. 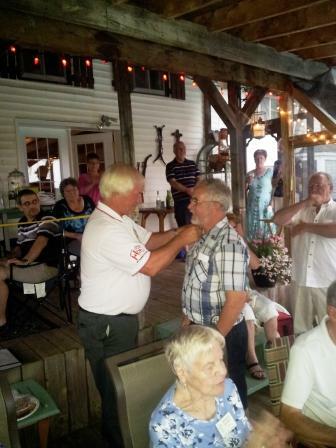 Jim was a Rotarian in Kemptville and member of our club for many years. He was a Paul Harris Fellow and Past President of our club. Pictured below is Rosemary receiving the certificate from President Donovan who made the presentation on behalf of Rotary International. 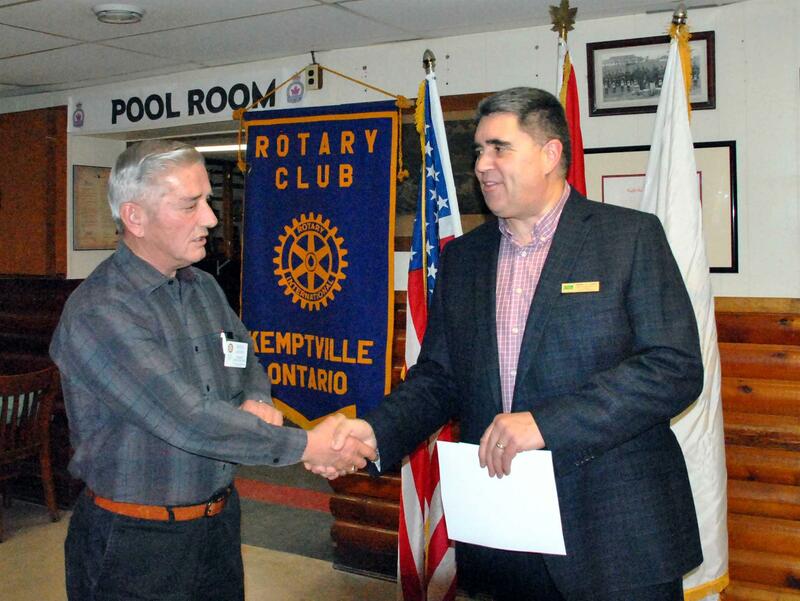 For 80 years, the Rotary Club of Kemptville has been serving our community. Please join us for a gala dinner to celebrate our anniversary on November 22nd. 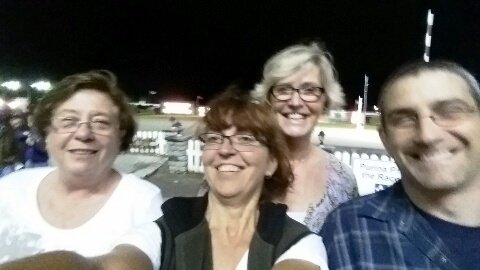 Members of the club took a break from our normal routine and had a fun evening at the Rideau-Carleton Raceway. 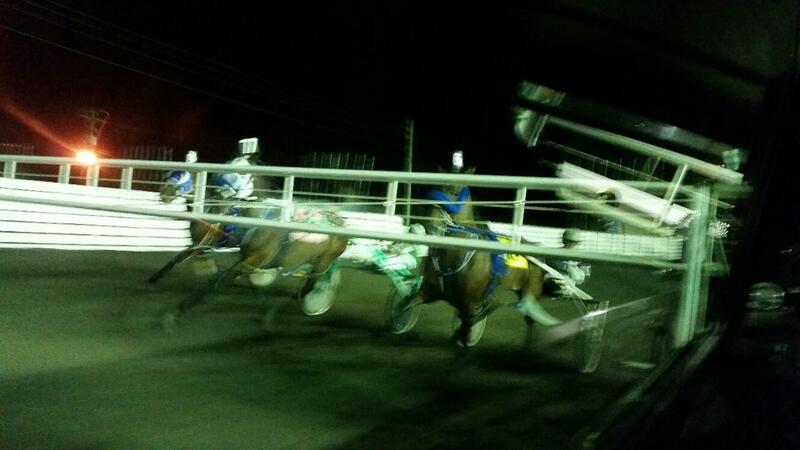 In the 5th race, some got to see a bird's eye view of the events on the ground by riding in the pace car. A great time was had by all. Joining us this evening as guests and speakers were Patrick McGarry, Sharon McGarry and Meghan Murphy. Patrick shared an overview of their firm's move to North Grenville and plans for their family based business in our community. Meghan spoke to us about some of the aspects of preplanning a funeral and the various factors involved, including some of the misconceptions. A series of seminars are also available ranging from Executor Duties to Final Estate Tax and Funeral preplanning. Our meeting this evening was a mix of sadness and celebration. Our programme was a celebration of PDG George's life. Members told stories of George and his influence on their lives. We were priveledged to have the long time love of his life, Norma, join us and share this special evening with us. Tonight’s Rotary Club meeting was held at Harvex Agromart located in Oxford Station. This meeting was our annual 4H Corn Roast evening. In the continuing series of visits to 4-H clubs, this year we were informed about field crops by Harry Bennett, 4-H leader and an employee at Harvex Agromart. The 4-H group he leads is a 10 member group between the ages of 9 and 21. They have named their group “The Bad Weeds”. Tonight 6 youth and their parents were present for the meeting. Harry went on to tell us that their motto is “Do by Doing”. During their time with Harry the youth learn about farm safety; weed identification; herbicides; and plant fertility. 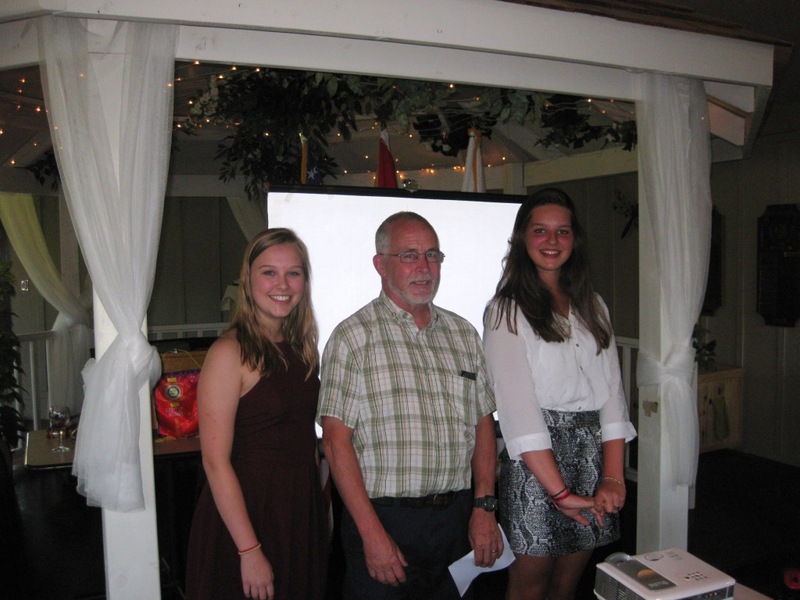 They partner with the Food for All food bank project and raised $6350.00 this past year. Harry also noted that this is the 101st year of 4-H in Canada! 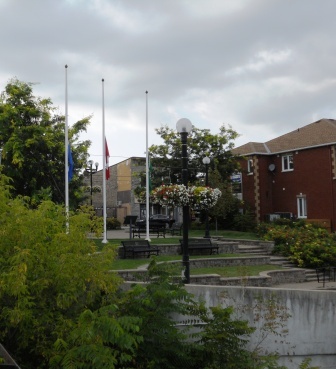 Flags were lowered to half staff today in Rotary Park to mark the passing of club member and twice District Governor, Dr. George Fisher. He will be missed not only by members of this club who he mentored and nurtured, but as well by our district and our community to which he and Norma gave so much. Members of our club had a nice social evening with our partners offsite tonight. We enjoyed a tranquil cruise on the Rideau canal system from the Merrickville Lock up to Kilmarnonick and back. 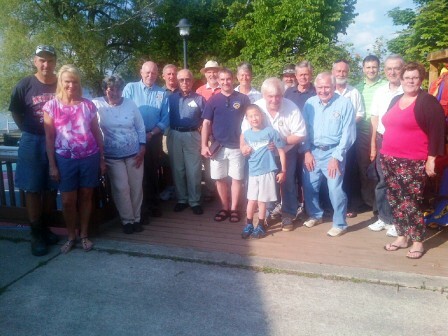 Afterwards several members of the club enjoyed dinner in Merrickville. 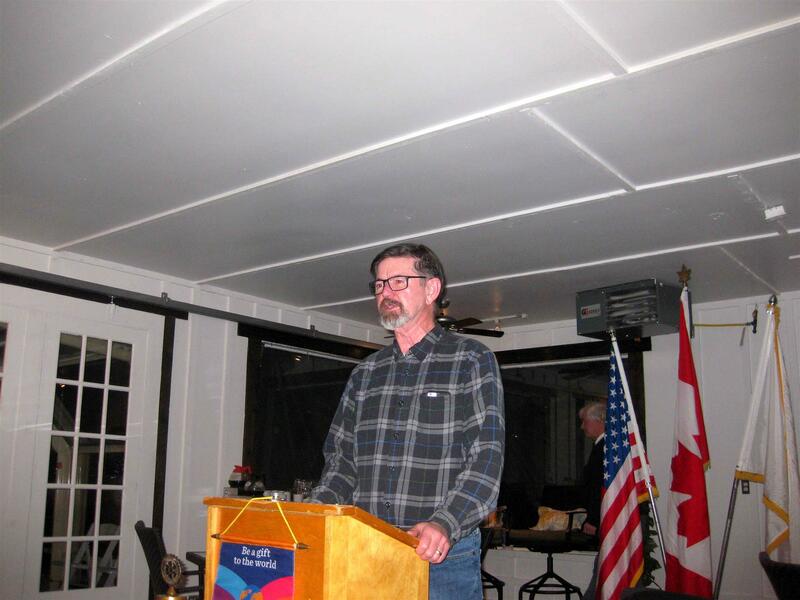 Our guest speaker this week was Dr. David Shanahan, editor of the North Grenville Times newspaper. David spoke about the ups and downs of running a local paper and how it became a weekly issued paper. “A Truly Local Community Paper” was the core idea, with local content and is “open” to the community because “a community really works when they know what’s going on in their community”. He deems it “The Voice of the People”. It was noted that 7000 papers are distributed each week with 4 to 5 paid staff and that the paper is paying for itself now. 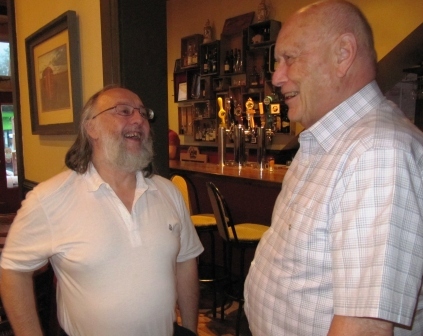 Pictured above David and Honourary Rotarian Don share a laugh. Please come help us celebrate our 10th Anniversary. Our choice of venue for this celebration is at the "NEXT Restaurant" here in Stittsville where you will enjoy hot and cold hors d'oeuvres created by Chef Blackie. Please view the attached flyer which shows all of the information for our 10th Anniversary Celebration. Let us celebrate with you, our fellow Rotarians. We were pleased this evening to host our District Governor, Ariane Carriere. 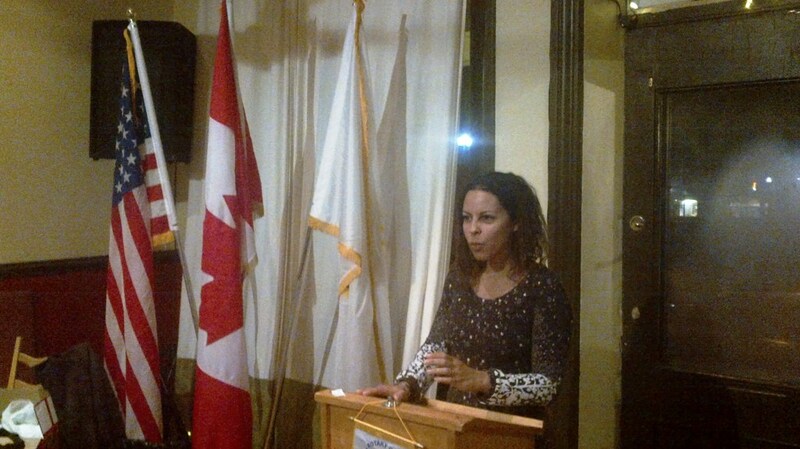 DG Ariane spoke of some of the accomplishments this club has had in our community and elsewhere. We were given a review of the District's goals for the year and how they tailored into Rotary's goals for the year. There was also a presentation on our Foundation and the various ways we can support it. 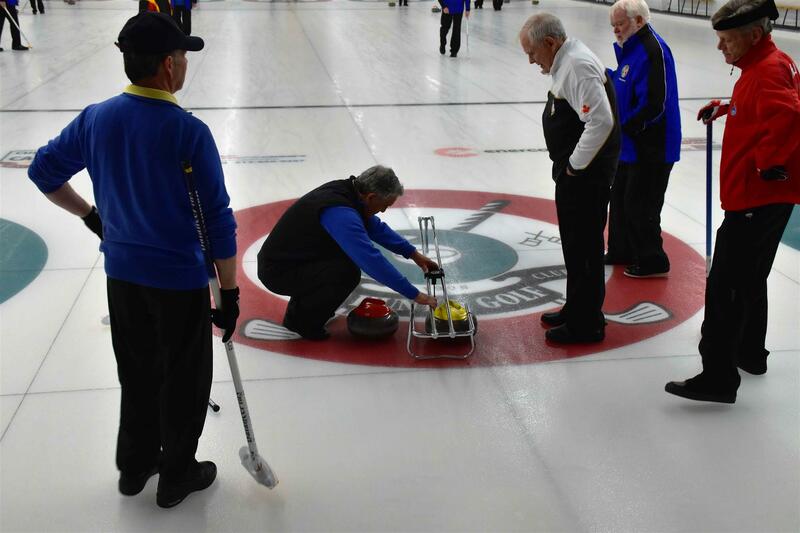 This Rotary curling tour began in 1956 and is played every two years, rotating between Canada and Scotland. Going to Scotland this year representing our club and one of three members from our District is Rotarian Dave. Rotary Clubs are composed of members of varying backgrounds and talents. 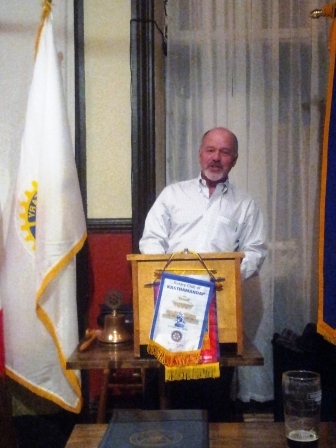 Pictured below, Rotarian Mike McIntosh presents the club with his vocational talk. 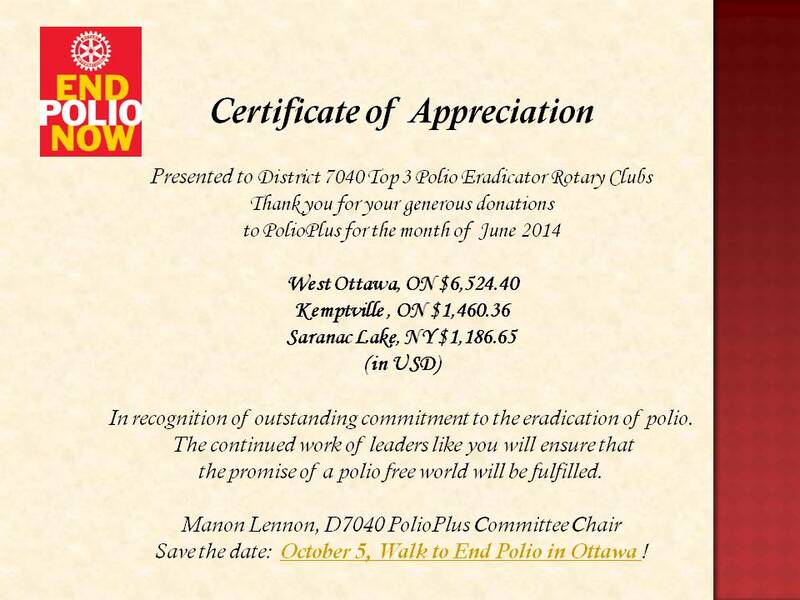 Our club was recently recognized as one of the District's top three contributors for the month of June in the ongoing battle to end the disease of polio. 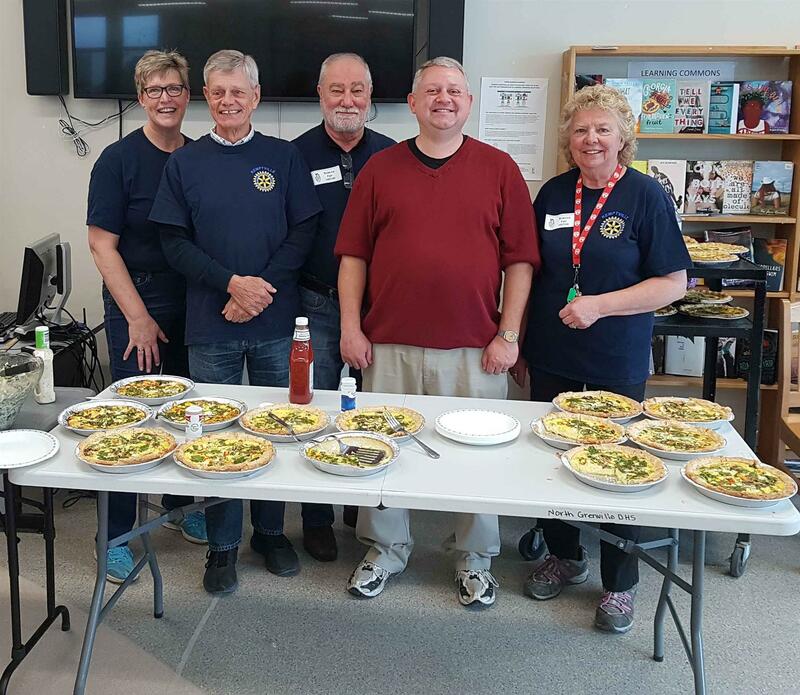 Members of the club and their significant others participated in our annual Pizza Party at Easter Seal's Camp Merrywood located on the Big Rideau near Port Elmsley, ON. The camp, opened in 1948 caters to children with physical disabilities and helps them to succeed. 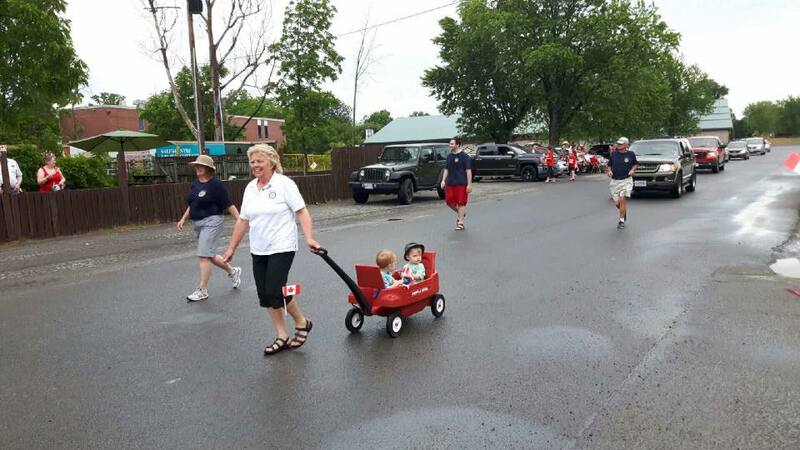 Members of the Club once again participated in the Kemptville annual Canada Day celebration. 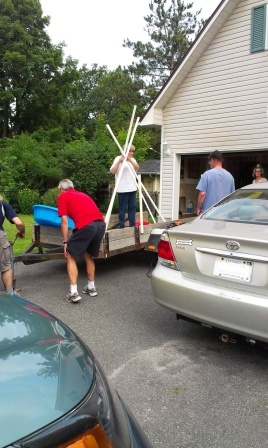 Pictured below are club members in the early stages of float preparation. Tonight we had our annual changeover of club officers. Pictured below, Past-president Jill presents incoming President Donovan with his officer's pin. Members of the club recently manned the Fast Food Station for the golfers participating in the annual Tallman Truck Centre Charity Golf Tournament. This tournament annually contributes the proceeds of the tournament to a local charity. The members below are set to go for their first customer! 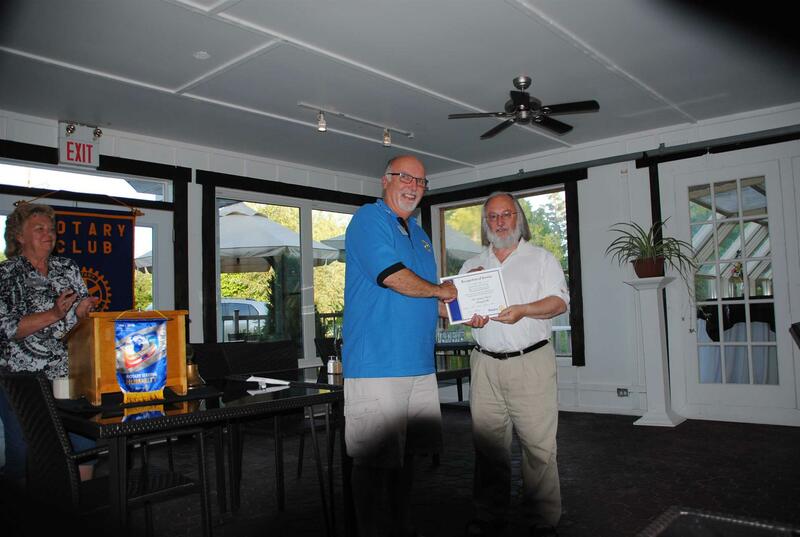 Prior to dinner, a shocked Rotarian Dave was presented with a Paul Harris Fellow. It is not often that you will ever see him speechless. This evening’s speaker, Cahl Pominville is the Director of Corporate Services/Clerk for the Municipality of North Grenville. He spoke to us about a trip that he had taken to Japan as a result of his being president of (AMCTO) the Association of Municipal Managers, Clerks and Treasurers of Ontario. His interesting presentation complemented by a slide show gave us an overview of the purpose of the trip as wll as some of the interesting things he encountered. He was the only Canadian in the group which consisted of municipal officers providing feedback on local tourism at the request of the government of Japan. Our newest member, Rotarian Daren gave us his classification talk this evening. Pictured below with Daren is President Elect Donovan. 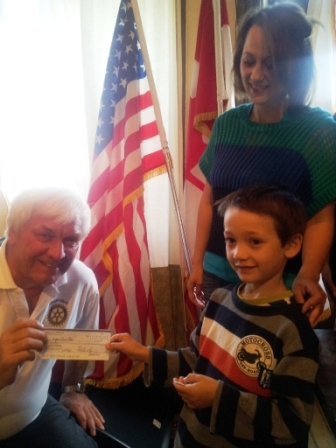 This year's Duck Race winner Logan, and his mom Laura receive his winnings from President Elect Donovan. Logan wasn't sure how he was going to spend his new found fortune. This has been a busy week for our club. On Saturday we hosted the Ontario portion of the District Foundation Walk which was the most successful of the three walks held in our District. 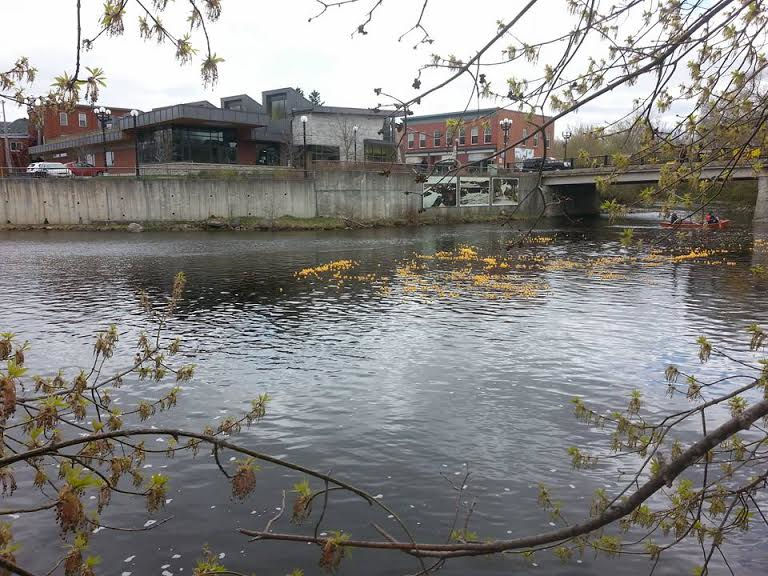 On Sunday in conjunction with the Dandelion Festival, we held our annual Duck Race. Pictured below is the duck recovery boom. On Tuesday prior to our monthly business meeting, a cheque was presented to Canadian Aid for Chernobyl to support a 13 year old girl at the orphanage in Chausy, Belarus. 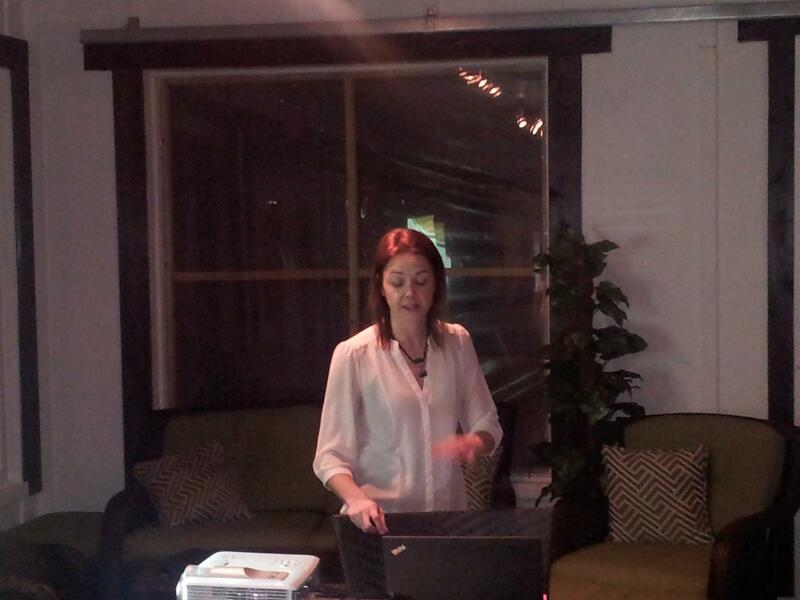 Our speaker this evening, Lise Couture spoke on the topic of auricular acupuncture. Lise described how this form of acupuncture differs from Chinese acupuncture. She spoke of some of the things that this type of treatment can be used for and how long it typically takes for relief to begin. Our speaker this evening was Dan Gilpin, Group Commissioner of the North Grenville Scouts. During his talk, Dan spoke of the Scouting movement, its aims and some of the challenges it faces. He also gave the club an overview of the programme that our area youth are provided with as well as a recap of the events the members of the scouting movement have participated in this year. For more information on our local Scouting movement, please contact ngscouts@gmail.com . 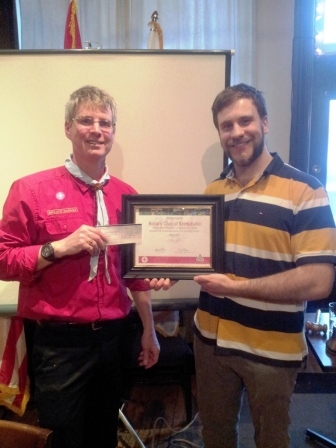 Pictured above is the presentation of a certificate of appreciation to the club from the Scouting movement. Our club was the charter sponsor for the scouting movement to come to Kemptville in the first half of the last century. 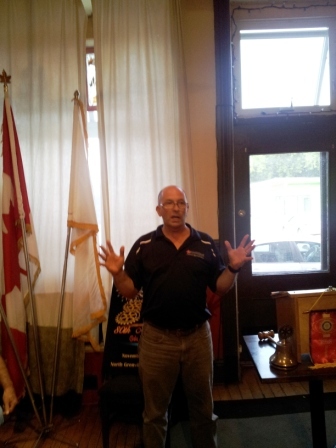 Our speaker this evening was Rotarian Dave Shaw from Brockville. Dave is the founder of Canadian Aid for Chernobyl. This registered charity was founded a couple of years after Dave and his family hosted one of the victims of the Chernobyl nuclear disaster in Belarus. 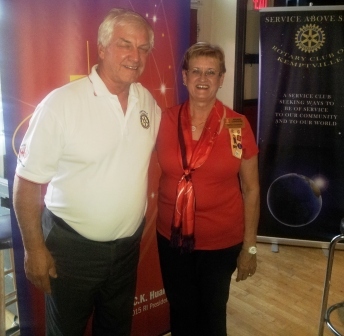 After seeing how her health had improved due to living in a clean, healthy environment with a proper diet, he wanted to do something to help those people living there.The Rotary Club of Brockville partnered with Dave’s organization and sponsored the first container to go to Belarus. 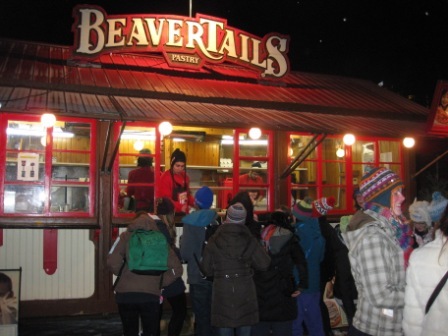 Currently the two Brockville clubs as well as the club from Prescott pack the banana boxes full of food that now go to Belarus in multiple containers. The list of recipients for the 600 boxes of food that is sent changes annually. Dave also spoke of the orphanage in Chausy. Canadian Aid for Chernobyl works extensively with them and has improved the facility greatly over the years. The children living there have much better living conditions than do the children in the general population. If you are interested in finding out more about this organization and what it does, visit their website at http://www.canadianaidforchernobyl.com . Our speaker this evening was Kevin Savoy. Kevin is a business coach who works with business owners who want to take their firms to the next level. Although he works in a variety of areas, Kevin ran us through a personality profiling platform called DISC. He explained that each of us have a dominant set of characteristics in one of these four areas: outgoing, people orientated, reserved and task oriented. He went through the characteristics of each group and how they work with each other. Rosemary Wrong, the daughter of late Rotarian Jim thanked the club for all the support and organization for her father’s memorial service. 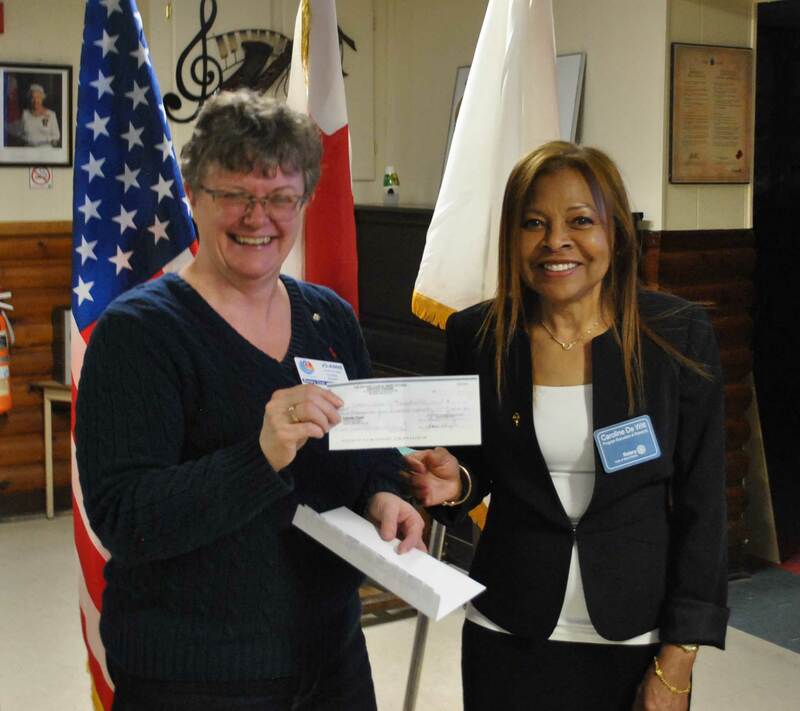 Above, Rosemary presents President Jill with a cheque to the club from her colleagues in memory of Jim. Ashley Hill, owner of High Performance Recovery spoke to the members about Athletic Therapy and how it can be used not only for recovery from injury, but for prevention of pain and injury as well. Tim and Roshan Aubin of Aubin Farms run a completely organic farm near Spencerville.They grow a little bit of everything. In addition to veggies they also sell beef, lamb, chickens and turkeys at the farm. About 50% of their product is sold at the farm with the balance being sold at local markets or to customers who pre-order their meat and vegetables. Some of the points made about organic farming were quite interesting and gave our members cause for thought. 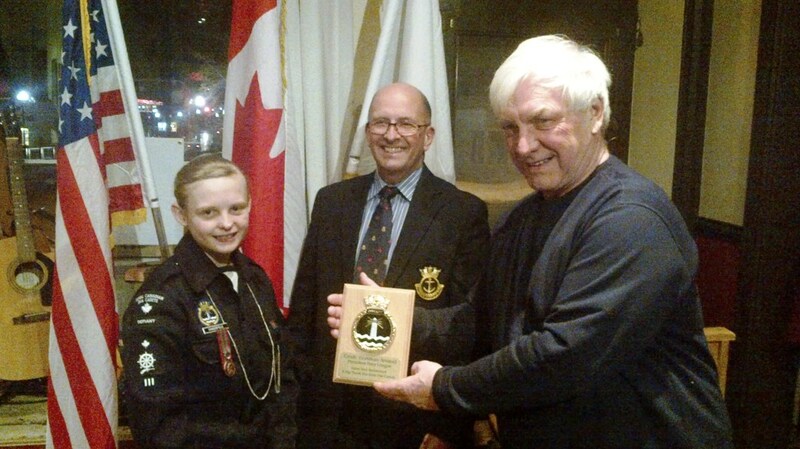 President Jill presented a cheque for $1000 to local cadet Navy League chair Mike and CPO Katie on behalf of the club. These funds will assist the local sea cadet corps in their operations. Sea cadets are an organization which provide leadership and basic military skills to youth between the ages of 13 and 18. 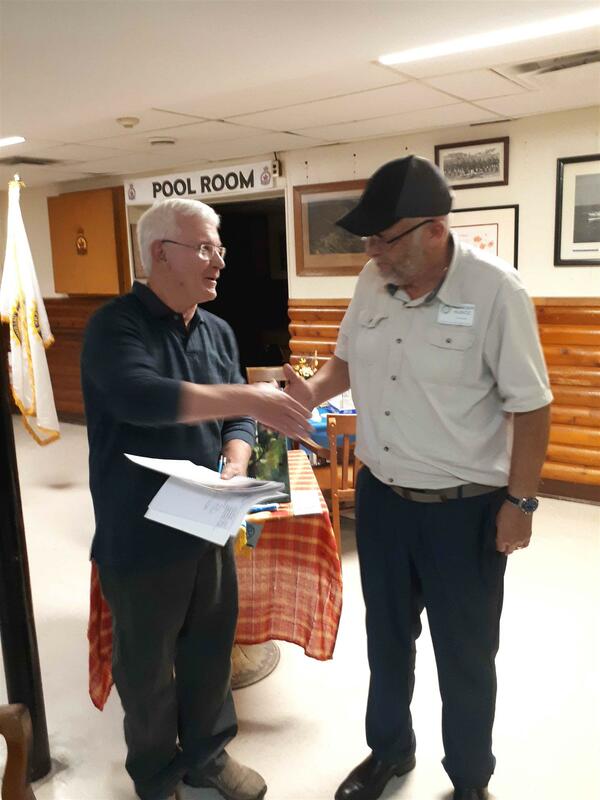 Following the cheque presentation, a presentation was made to outgoing League president, Rotarian Donovan in recognition of his efforts to put the local corps on sound footing. Donovan will now be involved with the Navy League at the provincial level. Louise Noble the executive director of the Alzheimer’s Society of Lanark, Leeds, and Grenville spoke on some of the aspects and symptoms of this terrible disease. In a very interesting presentation she covered items such as steps that can be taken to slow the disease as well as the resources that are available to caregivers and the community. 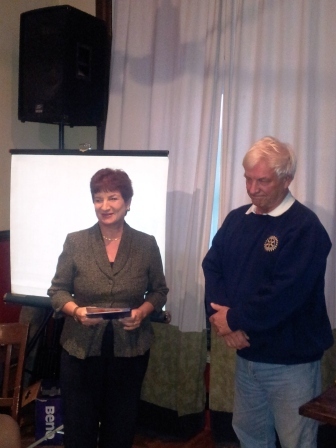 Before we commenced with dinner and our programme, President Jill presented Rotarian Don G. with a certificate honouring his over 50 years of service to our club and recognizing him now as being an honourary member of our club. 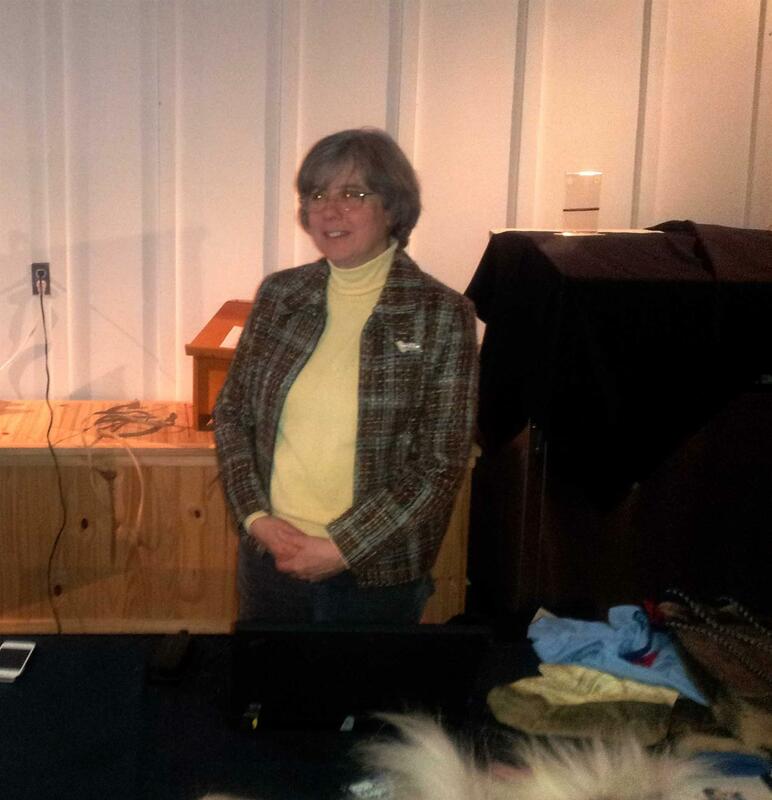 Our speaker this evening was Dr. Carla Eamon. The theme of Dr. Eamon’s presentation was the World Sight Day Challenge and Optometry Giving Sight. During her talk, Dr. Eamon pointed out that in many countries of the world; there is no one to provide eye care. Optometry Giving Sight helps to set up local colleges so that there are trained individuals available in some of the world’s poorest countries to help with basic diagnosis. 300 million people in the world are unnecessarily blind or vision impaired because they cannot obtain an eye examination and the glasses they need. As a result they are restricted in their education, in the work they can do, and the lives they and their families can lead. The amount of $5.00 can provide an eye examination and a pair of glasses. She also pointed out that 85% of the amount contributed goes directly to programme. 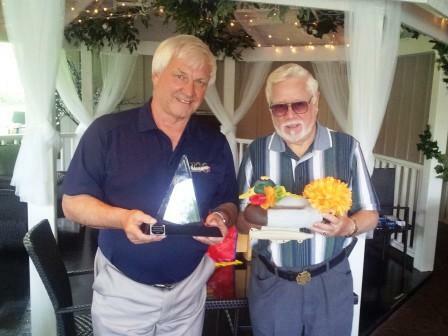 Dr. Eamon was thanked by Rotarian Ben. This evening’s speaker, Anne Walsh returned to give us a practical demonstration of the Art Therapy process she had previously spoken to us about. In an interesting an exercise, we were broken into groups and given a series of questions which asked us who as a club we felt we were, who our target groups were and how do we reach them. After we had identified the points given to us, we were asked to build a physical bridge with craft supplies demonstrating how we arrived at our conclusions. Some of creations were quite interesting. This was an exercise that was enjoyed by the members of the club. 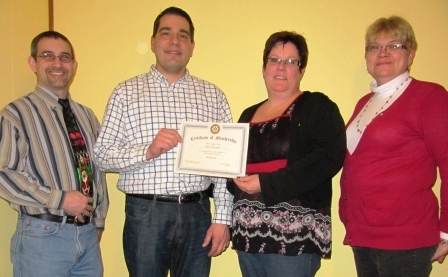 Our newest Rotarian, Daren was welcomed into the club at our annual Christmas party on December 17th. Pictured with him below are his sponsor, Rotarian Rob, President Jill, and past President Jennifer. Our speaker this evening was Anne Walsh, the proprietor of Art and Soul. Anne is a therapist who uses art as a medium to enable her clients to express themselves. In addition to doing monthly sessions with KYC and KPS, Anne also works with our local hospice. Her most interesting talk was followed with an equally interesting Q&A session. John McKenzie spoke to us on wildlife and habitat as well as the habits of various animals. In an informative session which was a cross between presentation and Q&A, John gave humorous examples of “bad guys” which ranged from hunters and fishermen to tourists and the perception and reality of each group. He noted that habitat is more important than animals because if you have the habitat you will have the wildlife. As an aside, he pointed out for those who feed wildlife including birds, that in the USA, the feeding of wildlife is a $2 billion industry. 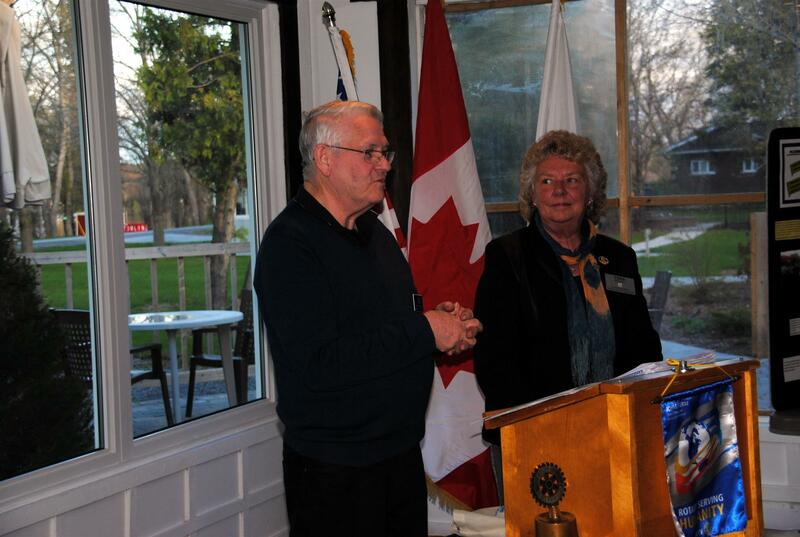 Rotarians Monique and Ian Warrack from the Rotary Club of South Ottawa spoke to the club on behalf of Rotarians for Wabano. The Wabano Centre for Aboriginal Health is one of 10 provincial specialized Aboriginal Health Access Centres that is recognized and funded in part by the province of Ontario. In addition to health services, the centre also provides after school, community, Social Enterprise and Vocational areas and training programmes. For more information on the centre, you can visit their website at www.wabano.com or email Rotarians at rotarians@wabano.com. 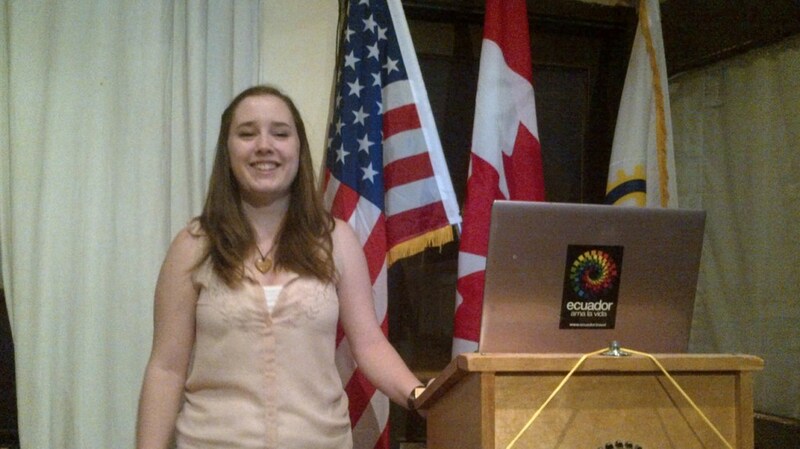 Recently our returning Youth Exchange student Katherine, spoke to the club about her year long exchange to Ecuador. Katherine gave us an overview of her year in Ecuador; her host families, her schools, as well as the trips she took to the Amazon and Galapagos (where she spent her birthday) which were facilitated by the Ecuadorian youth exchange committee. She spoke of the differences in celebrations,food, and cultural differences. In closing, she thanked the club for selecting her and for providing her with the opportunity to become a citizen of the world. If you are a high school student interested in participating in a life changing experience, Contact our Service Projects chair or see the District Youth Exchange website http://ye.rotary7040.com/ . 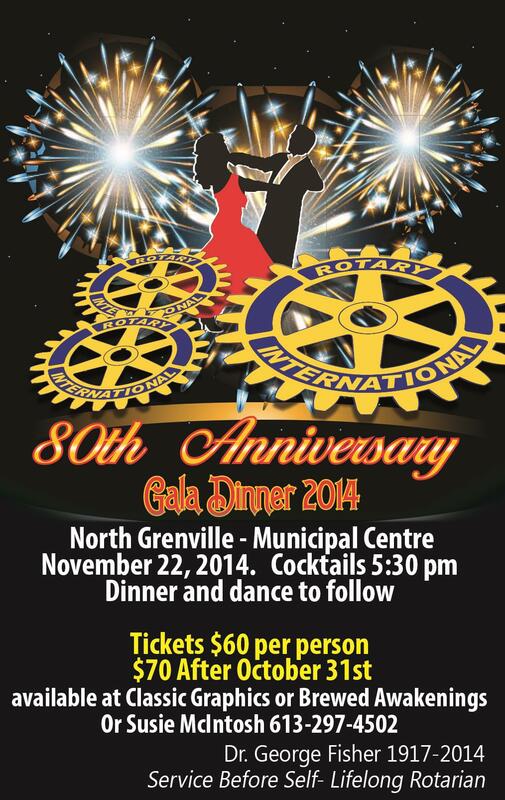 The Rotary Club of Chesterville will be celebrating its 75th anniversary on Friday, October 25th. The cost of the event which will be held at the Chesterville Legion is $35.00 per person. Enjoy a roast beef dinner and the evening's speaker, Max Keeping. Cocktails at 6:00pm followed by dinner at 7:00pm. Should you wish to attend or require additional information, please contact club president Eric Duncan (eduncan2@gmail.com). In the Rotary calendar, September is New Generations Month and this year, the week of September 8-14 is Youth Exchange week. This past weekend, the new inbound exchange students and the returning students to our district gathered at 4-H Camp Overlook outside Malone, New York. For the incoming students, there were orientation sessions to help them adapt to their new surroundings. For the returning students, there were debriefing sessions which enabled them to share their experiences with each other as well as their correspondents. 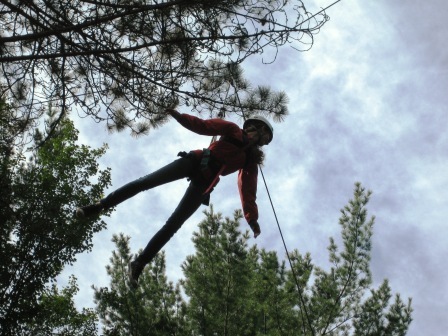 These sessions were complimented with integrated team building games and exercises including low and high ropes courses as well as a zip line. Pictured below is Katherine, our club's student who has recently returned from a year in Ecuador on the "Flying Squirrel". If you are interested in participating in a once in a lifetime experience, please contact our Service Projects Chair. 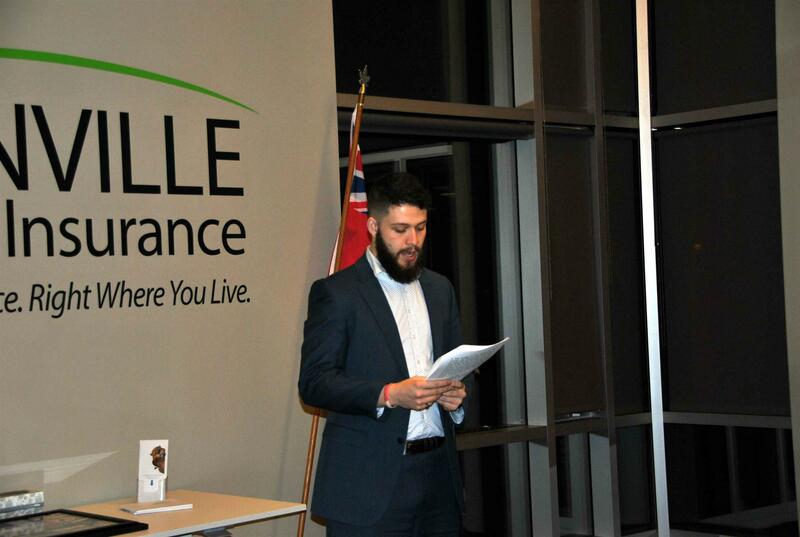 The local BNI (Business Network International) has committed to support youth initiatives in Kemptville for the next three years exclusively with every collection and event they do. They have already taken a number of collections for KYC this summer. The work they are doing for our community and support specifically for our next generation of leaders is greatly appreciated. Enjoy their wonderful chicken dinner Saturday, September 28th with your family. They have a goal to raise $5,000 for local children’s charities. Please see the poster below for complete details. 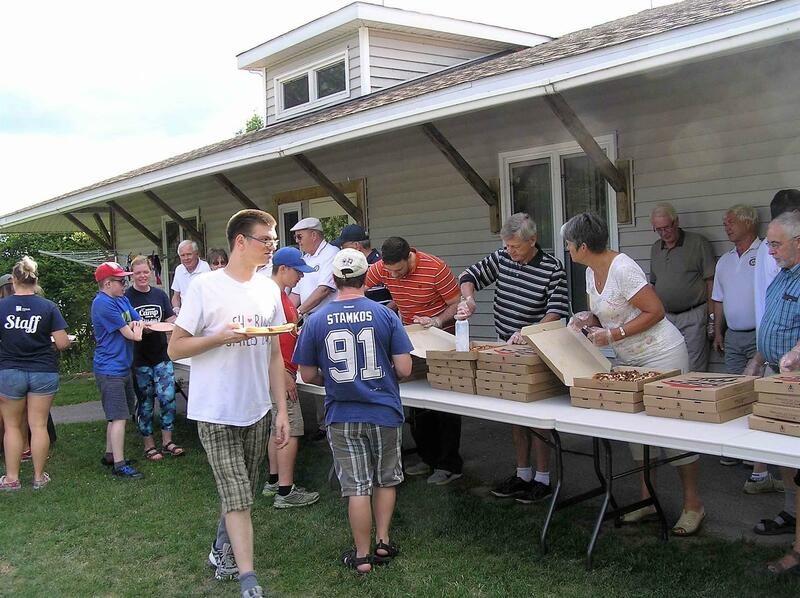 The first annual Investor's Group golf tournament on behalf of the Kemptville Youth Centre was held on August 17th at the Rideau Glen golf course. The weather was perfect and the participants were treated to a BBQ lunch and dinner as well as some interesting contests on a couple of holes. 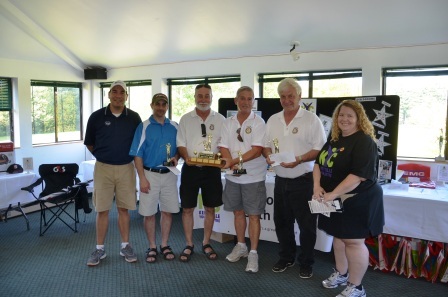 Pictured below are the tournament winners, Rotarians Rob, Dave, Serge and Donovan receiving their prize. Rotarian Rob also won the prize for the longest drive. 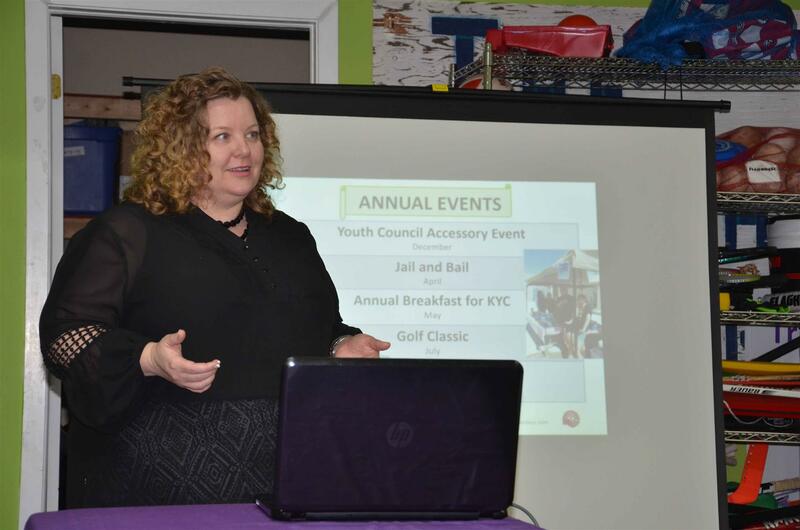 Approximately $5000 was raised to support the activities of the Youth Centre. Our meeting on August 20th will be our annual 4-H BBQ and corn roast. 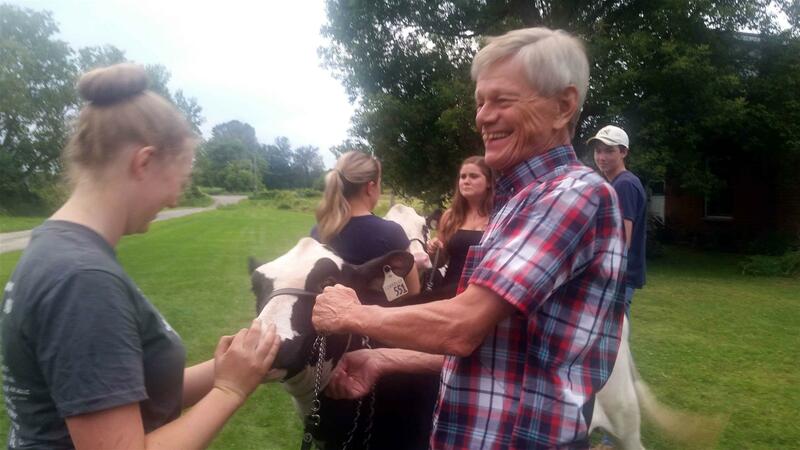 This year's event will be held at the farm of Howard & Lynn Carkner in Easton's Corners. A map to the event will be included in the Kemptarian. We will be holding an inter-club picnic at Blockhouse park in Merrickville on Saturday August 24th. This meeting will serve as a replacement for our meeting of August 27th. The meeting on August 27 is cancelled. 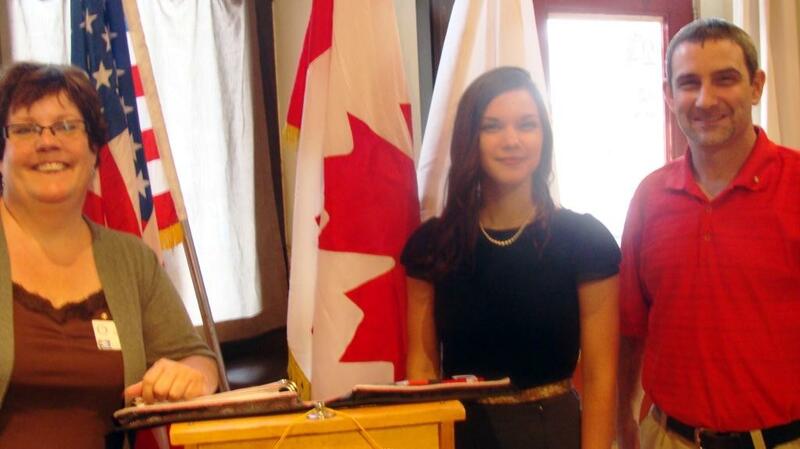 Lauren Nickerson has won the Rotary Bursary for Grade 12 students from the North Grenville District High School with excellent academic achievement and outstanding community service. Nickerson had a mid-term average of 91% and has been active in the Kemptville Youth Musical Theatre Company, the Merrickville Children’s Choir, Sarah’s Hope (which is raising money to help rebuild a school in Kenya) and the North Dundas Soccer Association, among other activities. She hopes to have a solo career as a classical vocalist in the future or some role in inclusive musical education. She will begin work on a degree in music at the University of Ottawa in the Fall. “Despite the many differences between individuals, there is one thing we have in common: all of us are searching for a quality of life that makes our existence worthwhile. We long to be fulfilled, to be the best individuals that we can be. Oftentimes we simply become so discouraged that we give up trying, and allow ourselves to become less than we could be. The Four-Way Test asks us to examine what we think, say, and do in order to create a healthy and productive environment for ourselves and others. Though there are four qualities involved in the Test, it can be categorized into two sections; honesty and the value of truth, and the care for oneself and others. By following the Four-Way Test, we can strive to have the best quality of life that we possibly can. There are many personal benefits to having a deep-rooted value of honesty. As an honest individual, people learn to respect you and grow in trust of your words, your ways, and your convictions. It is the honest individuals who are rewarded with promotions,. Entrusted with additional responsibilities, and make known in the greater community by those who appreciate their honesty. It is invaluable to be able to face any situation with a clear conscience, without the heavy guilt and shadows of dishonesty. In addition, it is gravely important to be able to decipher between the truth and a falsehood in situations around you. So much of our world is comprised of greys and half-truths that it takes a clear mind and a clean conscience to be able to make its way through without being blindsided. To be able to speak and recognize when the truth is being spoken allows clear communication and a better quality of life. When I was young, I drilled “Love Your Neighbour as Yourself” into my head. I took from this that others must always come first, no matter what. But as I grew up I realized that in order to love others we must also love ourselves. As the Four-Way Test states, we must make sure that the situation is fair and beneficial to all concerned, which includes ourselves. By caring for ourselves we ensure that we are not being overrun, and therefore have more energy and resolve to pour into the world around us. However, it is equally as important to care for the needs of others in order to live a full and vibrant life. It is essential to remember that people love those who love them. . . and when you invest in the world around you, and show people how to care for themselves, it provides a well-balanced and healthy environment in which to live. Lauren Nickerson is a credit to her parents, her teachers and her community. We wish her well as she embarks on a new and exciting career. Pictured with Lauren are club president Jill Eagle and New Generations committee member Rob Horning. When Nicole and her husband Bruce opened The Branch seven years ago, they made a conscious decision to use local produce wherever possible. They found that there had been a farmer’s market in the past but for whatever reason; it had gone by the wayside. They had come to Kemptville from the San Francisco area where they were used to an abundance of locally grown produce. 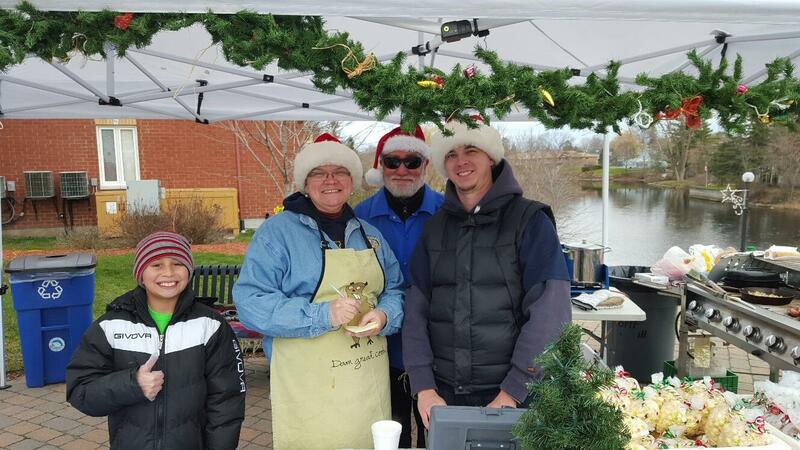 They approached their vendors and asked if they would be interested in forming a market.The response was positive so they provided the initial location for the market in their parking lot. It gave the various businesses an opportunity to create a local network. The farmer’s market is a true market in that it supports all types of vendors ranging from local artisans to agricultural vendors. Vendor’s pay a small membership feeto participate. It is a great venue for like-minded people to meet and provides an important outlet for supporting our local economy. Our club spent this evening enjoying a pizza party at Camp Merrywood. 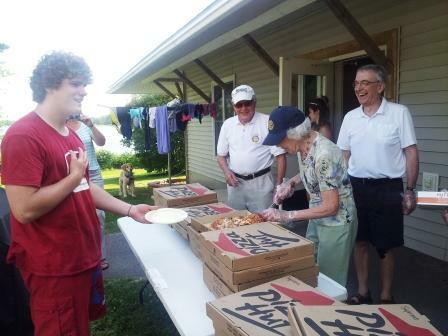 Members and guests served pizza and cold drinks to the 72 campers in this session and the camp staff. 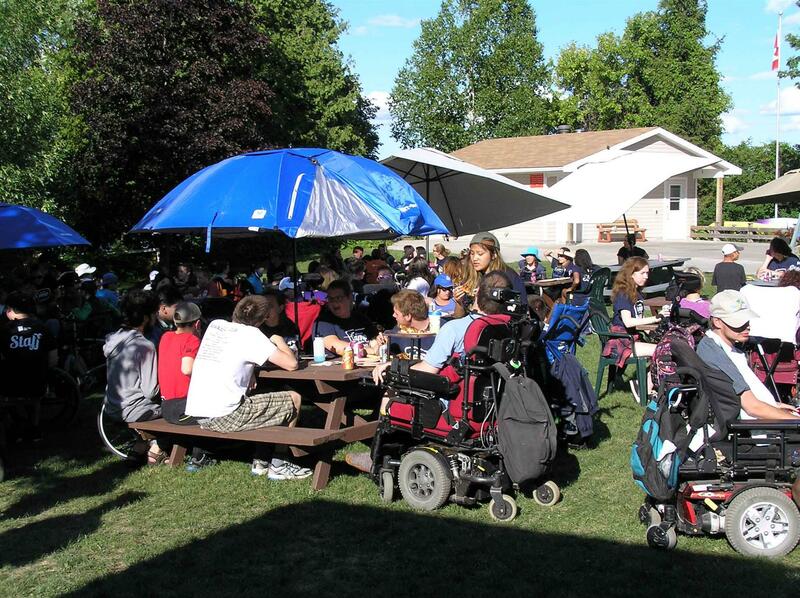 Easter Seals Camp Merrywood is located on a beautiful peninsula stretching out into Big Rideau Lake. The camp sits on 30 acres of property between Smiths Falls and Perth in Eastern Ontario. Built in 1948, Camp Merrywood began as a summer camp for kids with polio. Six campers attended in its first year. The site has 12 buildings including: six camper cabins that can accommodate up to 72 campers per session, a health hut, dining room and lodge, music and theatre building, nature building, specially adapted swimming pool. Merrywood offers a full waterfront program and activities such as sailing, kayaking, canoeing, fishing and white-water rafting. A golf tournament is being held on Saturday, August 17th in support of Kemptville Youth Centre at Rideau Glen Golf Course. 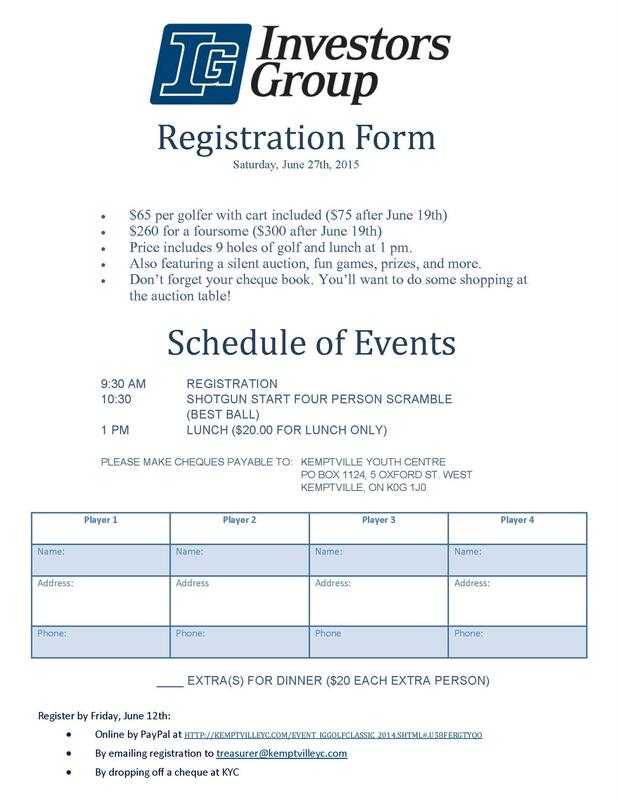 Registration and a light lunch are available at 11:00 with a shot gun start at noon. This will be followed by dinner in the club house at 5:00 pm. Cost is $120 per person prior to July 26th and $125 afterwards. Please go to the New Generations folder of the Club Documents section of the website for complete details. Our inbound exchange student, Patyrycja, spent the past weekend with the other students in the district for a farewell gathering. This weekend marked the final time that this year's group of students will be together. The students were billeted at Camp Smitty near Eganville and had a mixture of free time and strenuous exercise. The highlight of the weekend was a trip to the Barran River Canyon. After hiking to the top of the trail to see the canyon from above, the students put their canoes in at Brigham Lake and pulled out at Squirrel Rapids, a trip that required 3 portages - two of them very strenuous. Pictured below are this year's inbound exchange students and members of the District Youth Exchange Committee. Somewhat different form of make-up this week. Rotary clubs in France, working with Disney France, arranged the French premiere of the film The Fantastic World of Oz. One of the small arts cinemas in Briancon offered to put it on and we started with champagne and cheese straws. Quite a number of members of the Briancon Club brought their families, including many children. We each contribute 15 Euros towards Brain Research. I'm guessing that there were about 100 attendees. PS I'll be heading back to the UK to visit the family next week and return to Canada on the 27th. See you in April. 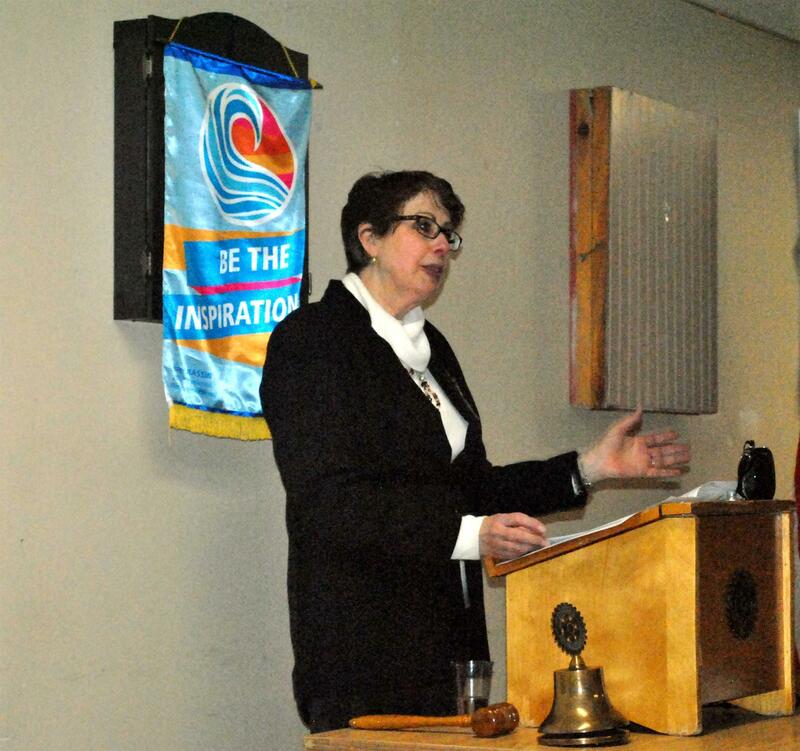 Stephanie Gilmer of World Hope Canada recently spoke to the Rotary Club of Kemptville about the activities of her organization, which has recently relocated to downtown Kemptville. Active in Ukraine since 2000, Sierra Leone, the Democratic Republic of Congo, and, most recently, Swaziland, World Hope is a Christian relief and development not-for-profit working with overseas partners to create dignity and inspire hope. Its clearly targeted programmes include Hope House in Ukraine, a safe home for young women who are still attending school but have outgrown government orphanages or were living on the street. In Swaziland, where the highest rate of HIV infection in the world prevails, they have a programme to reduce its spread, called Reach 4 Life New Testament. In Sierra Leone they have provided prostheses to people amputated in the civil war, dug wells and built latrines and are working to alleviate malnutrition both there and in Congo. 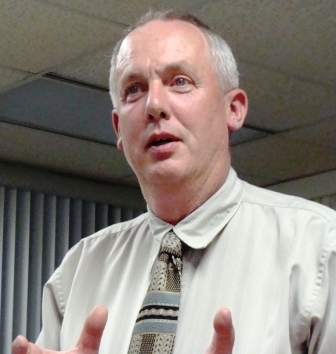 Gilmer formerly managed the programmes of the Salvation Army in Kemptville for almost eight years and worked as a missionary in Zaïre (now Congo) from 1986 to 1990. 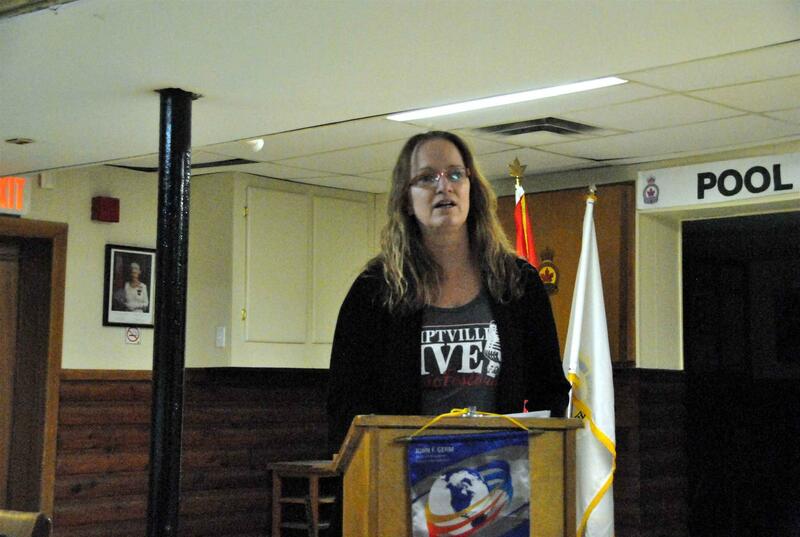 Stephanie Gilmer, of World Hope Canada, recently spoke to Kemptville Rotarians about her work. The Kemptville Youth Centre is having our Strategic Planning Session on January 21st. We need your help. If you or other Rotarians are available to join us for all or part of our session on January 21, we would appreciate your help. Our planning goes from 2 to 8 pm with supper at 6 pm. Please let me know if you are available for any part of our session. On Saturday February 2nd, 2013, the Andrea Goral School of Highland Dancing, along with the Duart-Dillon School of Highland Dancing, will be holding its second annual recital. Our first recital coincides with an initiative put forth by the Northern Ontario School of Highland Dance. On this day 40 plus Highland Dance schools from around the world will participate in a WORLD WIDE RELAY HIGHLAND FLING. The goal of this event is to increase participation in Highland Dancing and to support a non-profit local charity. The recital will take place from 2:00 p.m. to 4:00 p.m. at St. Michael Catholic High School in Kemptville, Ontario. If you have any questions or concerns regarding this event, please feel free to contact Andrea Goral at 613-258-9700 or andreamgoral@yahoo.ca. - Fundraising, Marketing and Communications, and Building and Maintenance committees are in need of extra members. Director of Kemptville Youth Centre at 613-258-5212 or robin@kemptvilleyc.com. Please join our board, staff, youth and community partners in making a difference for the youth of Kemptville and the surrounding area. 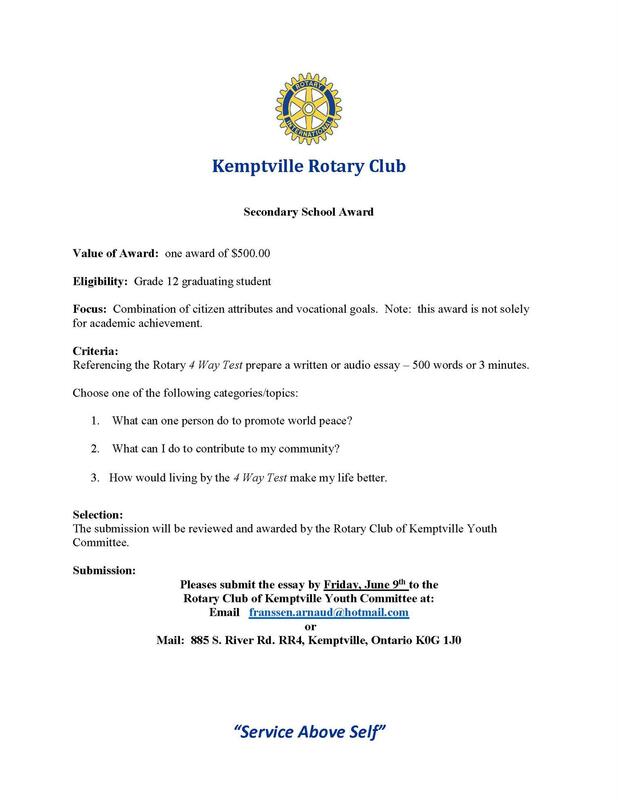 To RSVP or for inquiries to join our Board of Directors or one of our committees, please call Robin at 613-258-5212 or email robin@kemptvilleyc.com. The 2012 Scotland to Canada Curling Tour was in our area this week. The tour, which was established in 1956 alternates every two years between Scotland and Quebec/Ontario. This year marks the 30th time that Rotary Curling Teams have crossed the Atlantic in what is now a biannual event. Although the Scots whipped the Canadian side at the Hunt Club quite handily, the members from Kemptville acquitted themselves quite well with a heartbreaking loss of 7-6 with the score being determined by measurement in the last end. Seven Scots were home hosted by members of our club. In addition to the curling, the Scots were treated to a tour of Parliament with lunch in the Parliamentary Restaurant followed by a tour of the Museum of Civilization. 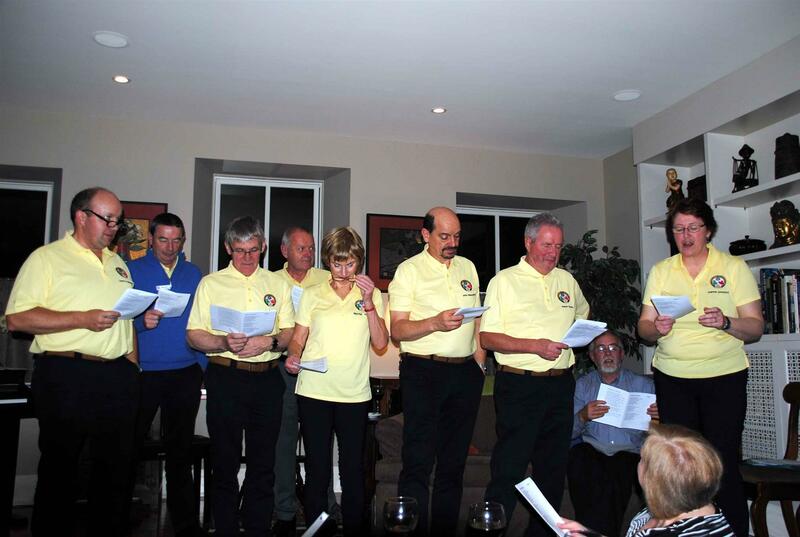 A farewell party was held at Rotarian Bruce's on the final evening of the Scottish stay. The theme of the event was "Strengthening Ties and Building Friendships". This objective was certainly accomplished. Just a reminder that United Way Spaghetti Fest is this Saturday at the new High School from 5:00 to 7:00 pm of which I am on the Fundraising Committee. Hope you can join us and support event by purchasing your tickets at the Municipal Centre or from me and feel free to send through your networks. It’s going to be a great event, but only as good as the number of tickets sold and attendees. 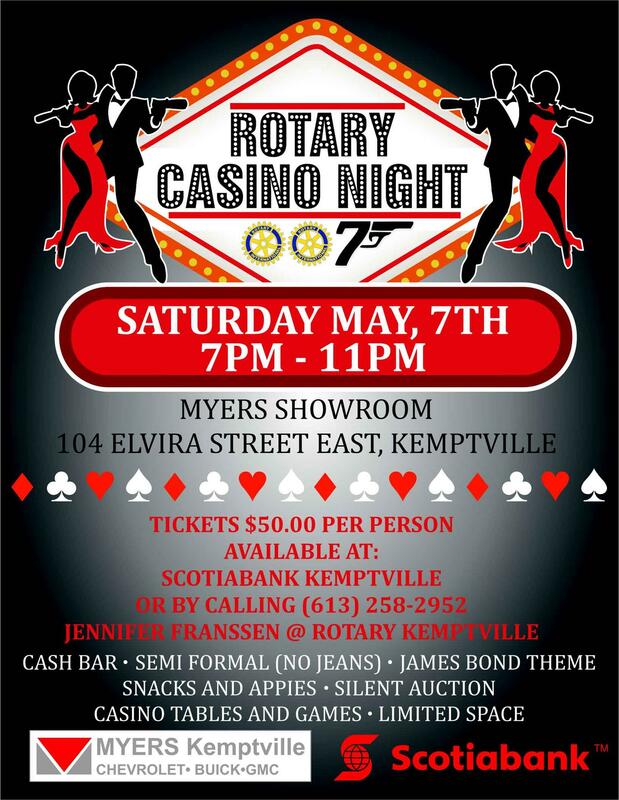 Kemptville 73’s will be there helping out and having fun, local restaurants will be vieing for bragging rights for top sauce, cake raffle with yummy treats from local bakeries, eateries and raffle for an LA Kings Jonathan Quick Jersey, generously donated by the Kemptville 73’s. Sunday night will see United Way drop the puck at the Kemptville 73’s game and fun for the whole family. Tickets will be sold at Spaghetti Fest for that game as well. Won’t you help by buying your tickets and helping promote the event over this last week…..
minutes to open an account and “like” the video to show your support. Pass this email on to EVERYONE you know! Post on Facebook, Twitter etc. All votes must be in by October 31st so please vote today! The Kemptville Youth Centre will be a partner in a free electronics pickup from October 15th to 20th. Follow the link for more complete details. 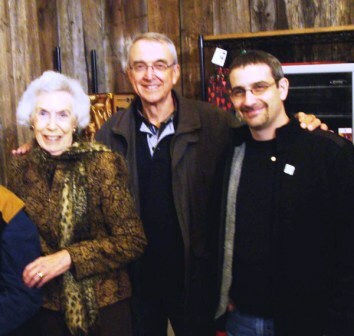 Guest Norma Fisher (left) and Rotarian Keith Nixon and Past President Rob Horning were among the Rotarians and their guests who recently enjoyed sampling a selection of locally hand-crafted wines at the Blue Gypsy Winery near Oxford Mills. Vintner Louis Gaal and his wife, Claire Faguy, bottled their first vintage last October and have been working hard to keep up with demand ever since. Their delicious fruit wines—apple, cranberry, cherry, strawberry and blueberry—are complemented by a range of tastes less commonly found in wine—maple, maple-apple, ginger and chocolate-flavoured honey wine (mead). Claire and Louis have planted a wide variety of fruit on their 10-acre former orchard located on Lindsay Road, with the intention of eventually growing as many of the ingredients of their production on their own property. Home from his travels, Rotarian Keith presents President Anna with a banner from the Rotary Club of Cape Town (am Kap), South Africa. His travel logs can be seen below. 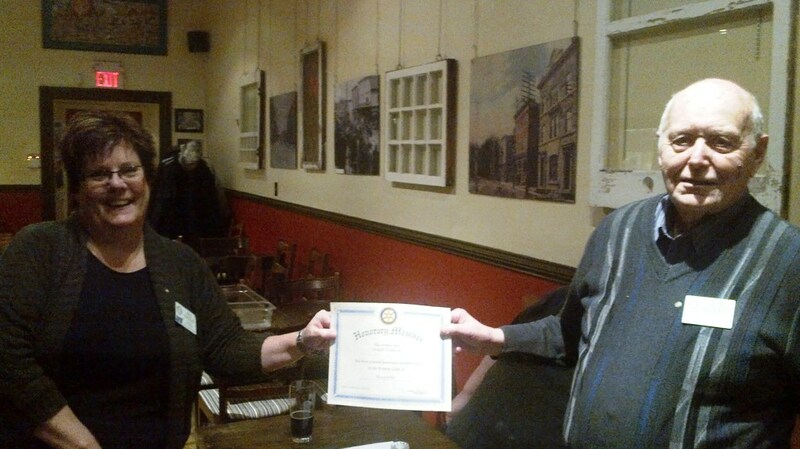 Sheldon Gilmer (above right) receives a certificate of appreciation from Kemptville Rotary President Anna Van Adrichem-Rochon at the conclusion of a talk on his international work in the Democratic Republic of Congo, on October 2, 2012. 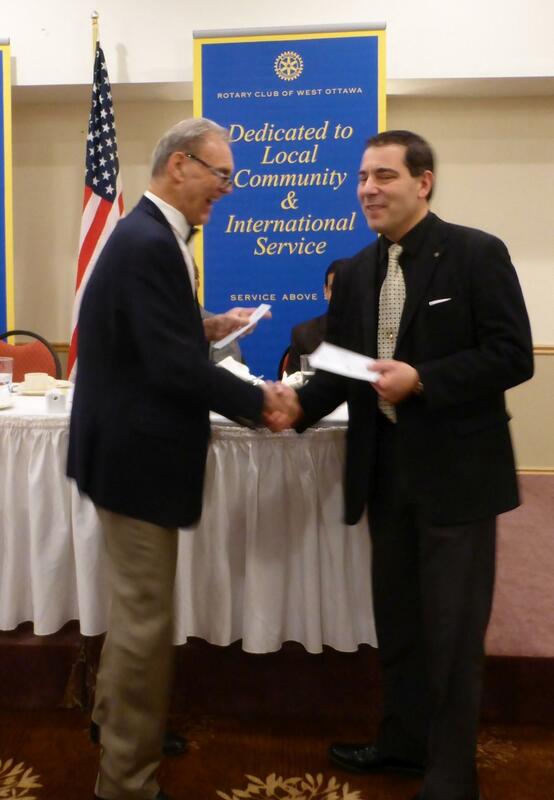 A donation was also made on his behalf to the Club’s safe cooking stove project in El Salvador. Gilmer has been travelling to Congo for 26 years, working on a variety of medical, community health and development projects. 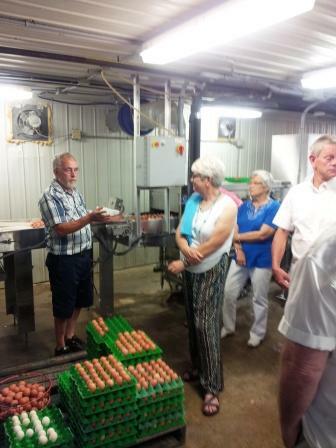 In recent years he has made four trips of three weeks each to Congo and shorter trips to Ukraine, taking time out from his agricultural equipment manufacturing business, located near Heckston. Gilmer works with a faith-based international relief and development organization called World Hope Canada, which will be moving to Kemptville on November 1. The national headquarters of the agency will be located in the Kollaard Building, at 210 Prescott Street. Gilmer, who emphasized the importance of working in partnership, concluded his talk by encouraging Rotary to keep up its commitment to international development work with local partners in developing countries. 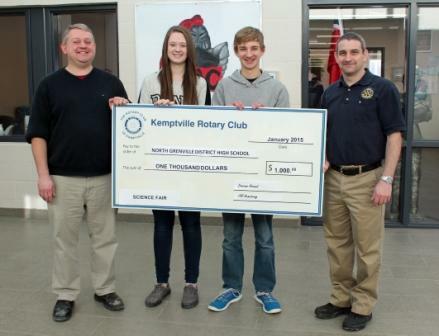 The Kemptville Youth Centre is a very grateful member agency of the United Way of Leeds and Grenville. Without the United Way funding, the Kemptville Youth Centre would not be able to provide the Youth of our community with the services and support that the Youth Centre provides and which the United Way of Leeds and Grenville helps supports. Follow Rotarian Keith Nixon and his wife Judy as the complete their trip to Africa and move to Europe. District 7040's inbound students, including Patrycja from our club have arrived. Their first district gathering was held at 4-H Camp Overlook which is just outside Malone, NY. At this orientation, the students whose language skills in English were at varying stages , undertook team building exercises including low level and high level rope courses. As a finale, they climbed to a 70 foot platform and zip lined to the end of the course. Meet our inbound and return students in the video below. Rotarian Keith and his wife Judy are on the road again. See inside for an account of their journeys. Our inbound long term student has arrived. 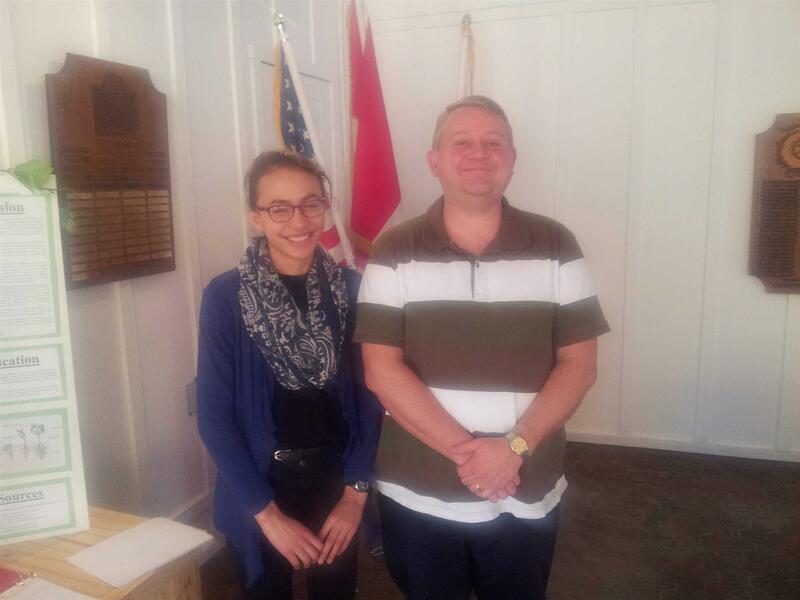 Patrycja was met at the airport by Rotarians Jenn and Dave as well as by members of her host family. Tired but happy, she is settling in. District 7040 is now accepting applications for Rotary Peace Fellowships. 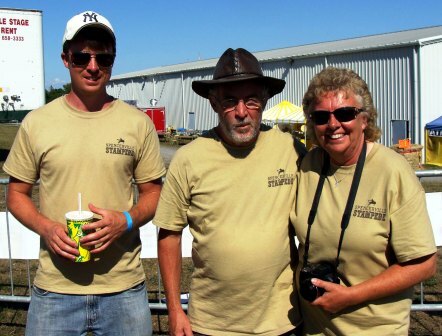 As part of its continuing speaker series supporting local businesses the Rotary Club of Kemptville visited the "Crusty Baker"
Rotarians John and Cora Beking (shown here with their son Chris, left) were the tireless local organizers for the Spencerville Stampede, held on the 28th and 29th of July. Over 3,000 rodeo fans attended the event, held this year for the first time at the Spencerville Fairgrounds. The huge success of this highly professional competition is encouraging plans to bring it back next year. 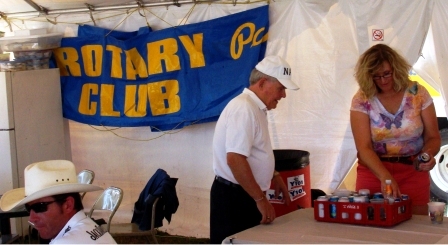 The Rotary Club of Kemptville provided volunteers to handle ticketing at the entry gates and servers in the refreshment tent. 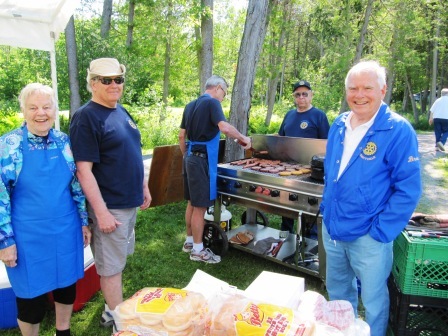 Shown here are Rotarian Brian Cassidy (left) and Nancy Miller-Mackenzie preparing a tray to serve refreshments in the stands. 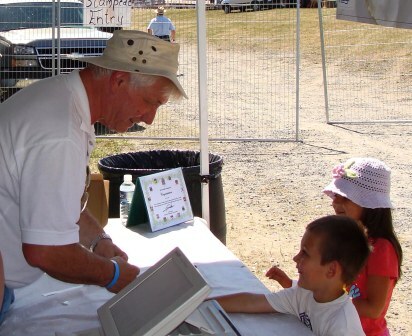 Rotarian Donovan Arnaud attaches an admission bracelet to one of the younger fans at the Spencerville Stampede. 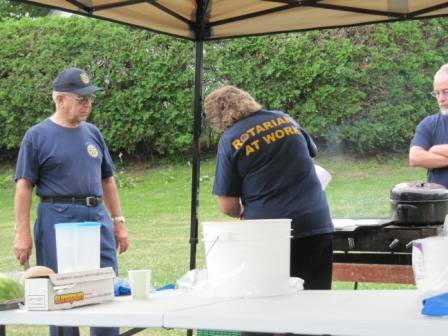 The Meeting on June 26 was the change-over BBQ at Rotarians Jennifer and Donovan’s. The Meeting on July 3, 2012 was held at Saunders’ Country Critters Zoo. President Anna chaired the meeting. Don Gilchrist led the club in sing O Canada and in singing grace. Dream a Dream Lottery – Rotarian Gord gave a brief summary of the Dream a Dream lottery which appears to have broken even. 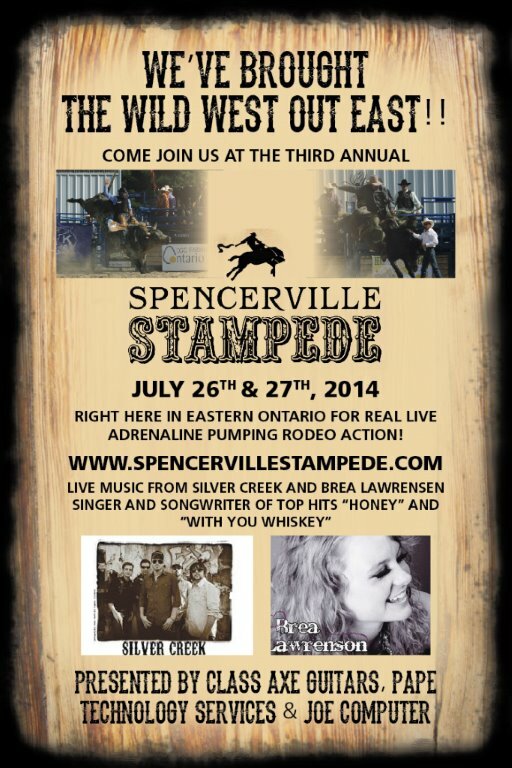 Spencerville Stampede – Rotarian John B. provided more information on the upcoming event and sent a signup sheet around for various activities. 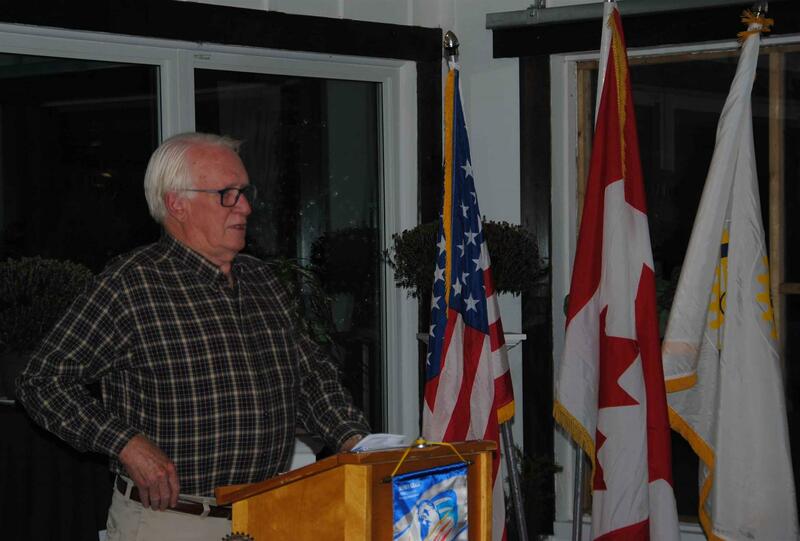 Rotarian Donovan reminded everyone that the meeting on the 17th of July is at Camp Merrywood. Those wishing to help are to be there at 5:15 with the pizza being served at 5:30. Perth Theatre Night - Rotarians are reminded to get their ticket money to Rotarian Mike G. for Perth Theatre Night on August 1, 2012. Dues are due! 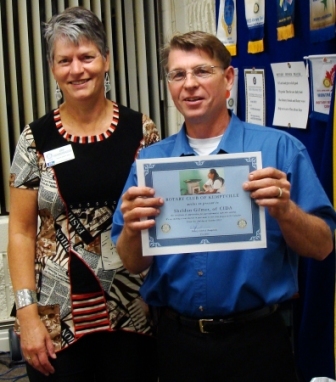 Please provide Rotarian Mike G – who is subbing for Rotarian Colleen - with your payment at the next meeting. 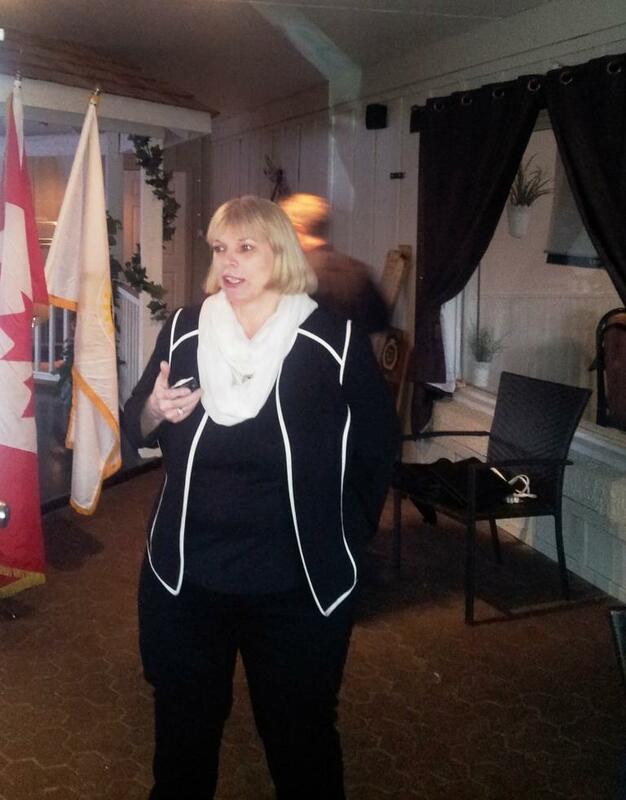 Program: Kate Westrate – Kate provided the members with information on complementary medicine (homeopathy etc) and provided a sheet of information on 10 steps to good health. She was introduced by Rotarian Cora B. and thanked by Rotary Mike G.
President Anna lead the club in reciting the Four Way test. 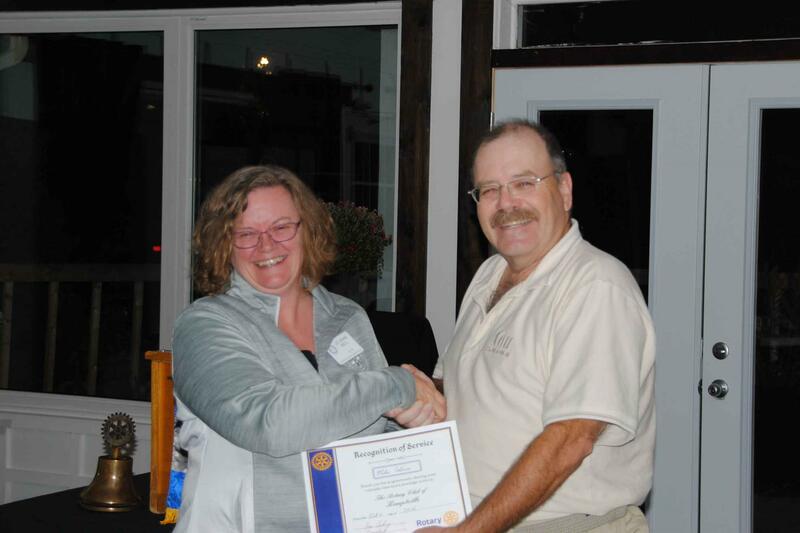 Outgoing Kemptville Rotary Club President Rob Horning (left) congratulates Anna Van Adrichem-Rochon, the 2012-2013 president of the club. Other members of the Board of Directors for the year beginning July 1st are Jill Eagle, President Elect for 2013-2014, Jennifer Franssen, Service Projects; Susan Hunt, Rotary Foundation; Cora Beking, Club Administration; Colleen Morris-Wilson, Treasurer; Jill Eagle, Secretary; Dave Pelletier, E-Secretary; Rob Horning, Membership; and Ken Mews, Public Relations. 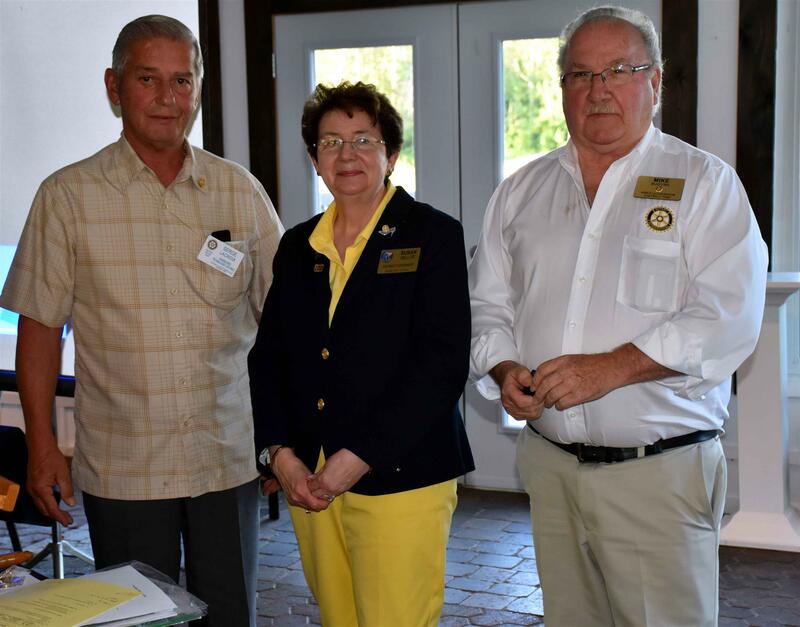 On Thursday June 21st the Rotary Club of Brockville and the Rotary Club of the 1000 Islands will host the District 7040 District Governor changeover. DGE Rene Melchers will take over from DG Bill Gray. This is a very special evening in Brockville as both club Presidents will also change. 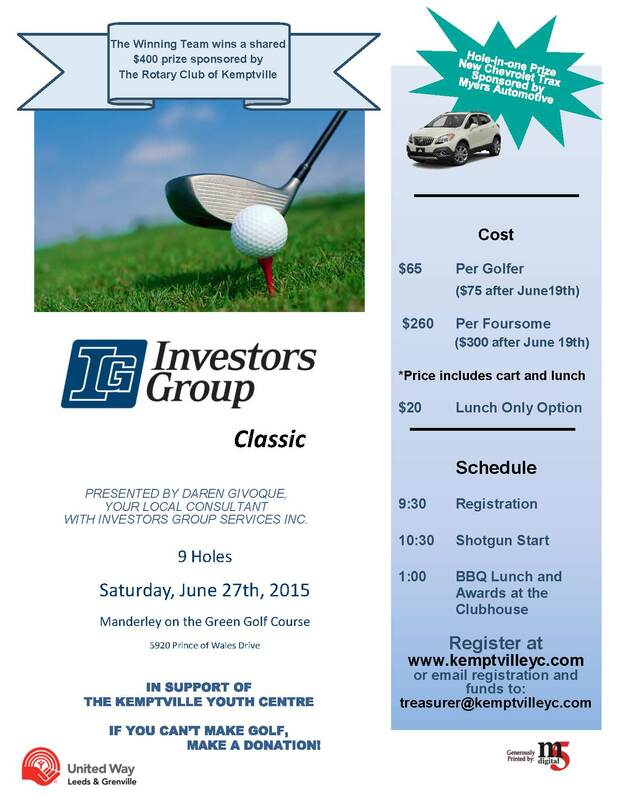 The location is the Brockville Country Club at 1548 King Street West in Brockville. The festivities will start with a social/cocktail hour at 6:00 PM and dinner at 7:00 PM. Cost for the evening is $30.00, reservations required. To reserve, please email Jack Henderson,flowershop1@bellnet.ca or call Jack at 613-342-6691. Please reserve by June 18th. Please join us for this special occasion. Tanaka, a businessman from the greater Tokyo metropolitan area, shared how becoming a Rotarian broadened his understanding of the world. After joining the Rotary Club of Yashio, in 1975, he said, he began to realize that his life's purpose was not to make more money, but to be useful to other people. "I realized that by helping others, even in the simplest of ways, I could help to build peace," Tanaka said. He noted that the Japanese tradition of putting the needs of society above the needs of the individual helped his country rebuild after the tsunami and earthquake in March. "This is a lesson that I think the whole world can learn from, in a positive way. When we see the needs of others as more important than our own needs -- when we focus our energies on a shared goal that is for the good of all -- this changes everything," he said. "It changes our priorities in a completely fundamental way. And it changes how we understand the idea of peace." Tanaka will ask Rotarians to focus their energy on supporting the three priorities of the RI Strategic Plan , (Support & strengthen clubs, Focus & increase Humanitarian Service and Enhance Public Image & Awareness) he said. He added that he will ask the incoming leaders to promote three Rotary peace forums, to be held in Hiroshima, Japan; Berlin; and Honolulu, Hawaii, USA. On behalf of the mother who will receive prenatal care, the father who will have access to fresh water for his family, and the children who will learn to read and write in their newly furnished school, thank you for your gift to The Rotary Foundation. Your Rotary Club’s contributions bring health and hope to these individuals, these families, these communities. In 2011-12, RI President Kalyan Banerjee challenges us to Reach Within to Embrace Humanity. Thanks to you and the members of your Rotary Club for making this gift. It is one step toward a better world. 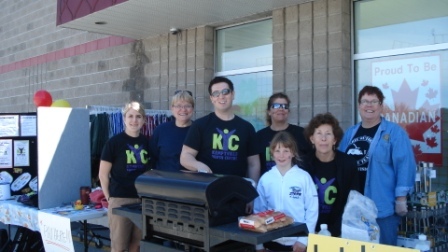 The Kemptville Youth Centre held an information and fundraising event outside Giant Tiger last Saturday, May 5th. Assisting with the event were New Generations Committee members Jennifer and Jill. On Sunday, May 27th KYC is asking for our assistance at the Bike Tour Race concession at the Snowmobile Clubhouse. Breakfast food will be sold to racers from 9:00 to11:00 am and lunch from 11:00 to 5:00 pm. They would like to have 2 volunteers for four (4) 2 hour shifts to work with KYC Board members and youth. The time slots are as follow: 9:00-11:00, 11:00-1:00, 1:00pm-3:00, and 3:00-5:00. Please consider and confirm your availability to Rotarian Jennifer. Past R.I President Wilf Wilkinson was unable to attend our Foundation Dinner. He did however take the time to send a kind personal note which was shared at the function. The video is below. 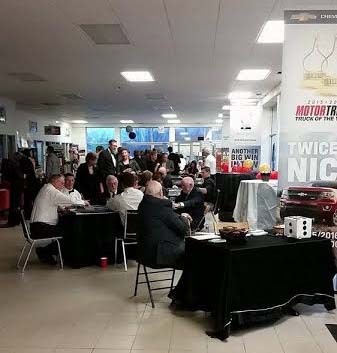 The Rotary Club of Kemptville "Team" truly came together on Saturday, with one focus in mind - to have a successful Foundation Dinner Event. This happened in spades. In just over a hour the Municipal Centre was transformed into a beautiful room, all the auction items arranged, and all banners and flags in place. The evening was filled with fellowship, food and a festive spirit. I was proud to welcome the many guests from throughout the District to our community. Congratulations to everyone that played a role in this memorable event. For more photos, log in and check the members section of the website. Members of our El Salvador team have returned from a successful trip to El Salvador. While on the trip they assisted with a stove project that the club had sponsored among other things. Each of the members present spoke of an aspect of the trip that they were responsible for. Their presentation was well received by the members present and their guests. The club partnered with Club Rotario San Salvador Noreste on this project. The membership has decided to move forward and seek partnering clubs here as well to complete the stove project and improve life in Barrio San Diego. 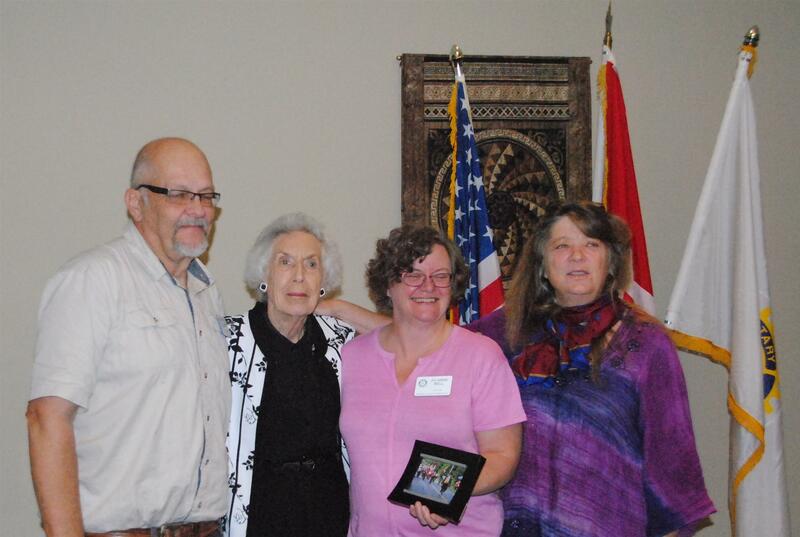 Pictured above are Rotarians Claire, Jill, and Cora presenting President Rob with a banner and plaque that were given to the club while in El Salvador. The meeting of the Rotary Wine Fellowship for Friday, Feb. 24th has been cancelled due to weather. The next event will be held March 30th at the same time and location. Fifteen inbound exchange students to our District as well as six rebound students and two rebounds from other districts celebrated Winterlude this weekend with seven members of the District Youth Exchange Committee. 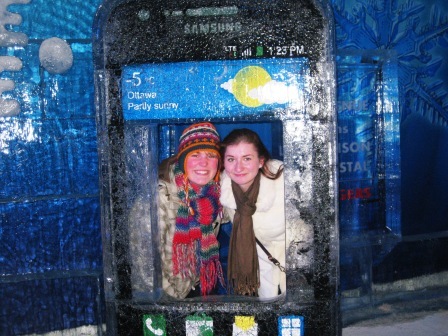 During their stay in Ottawa, the students took in the ice sculptures in Confederation Square as well skating on the canal. 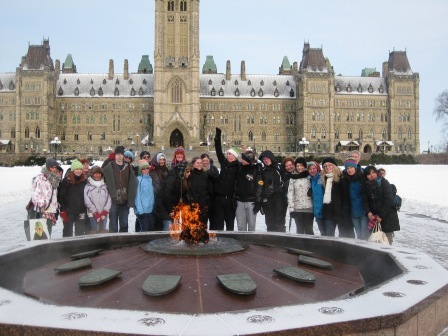 In addition there were guided tours of the Parliament Buildings as well as the Museum of Civilization. Two local students will be going out on long term exchange from our community in fall 2012, one sponsored by our club and one sponsored by Nepean-Kanata. Our El Salvador team left on Monday, January 23rd. Follow their mission by clicking on the blog link in the "Club Links" section at the bottom of the page. 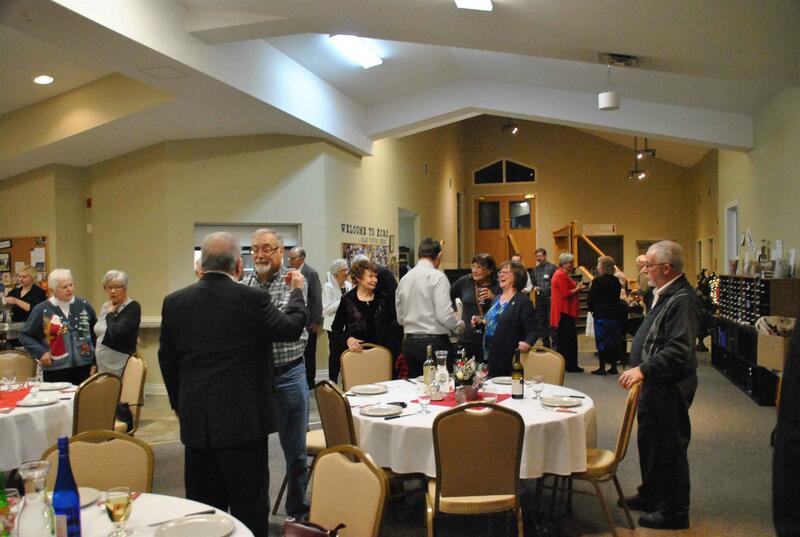 The Rotary Club of Kemptville will be holding a Foundation Dinner on Saturday March 17th. See inside for complete details. The 2010 Rotary year financial statements are now available to the club members in the club document section. 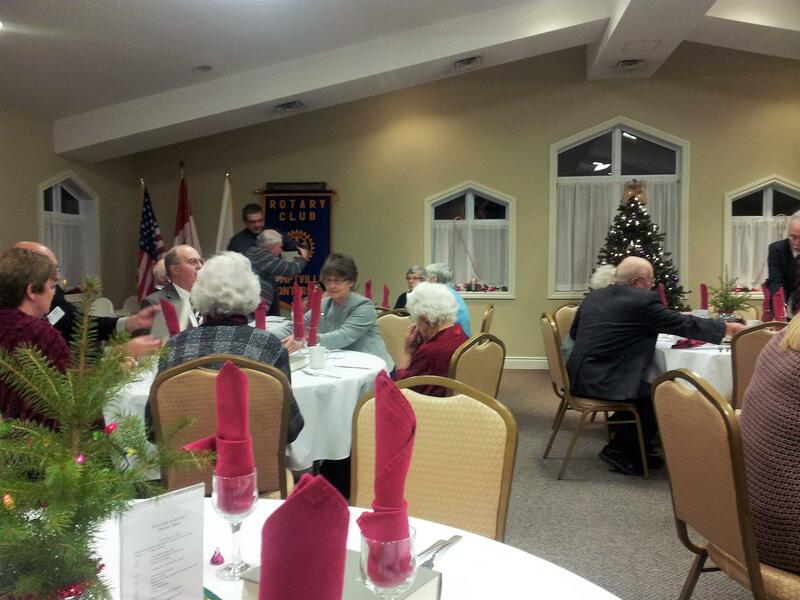 Members of the club held their annual Christmas party at Gad's Hill in Merrickville. Live entertainment enhanced a fine meal and great fellowship. Pictures of the event are available in the club photo gallery. 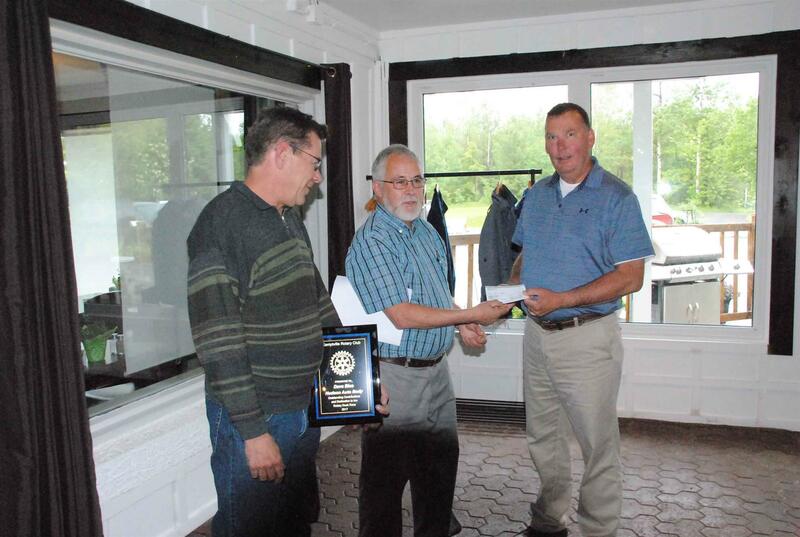 The Rotary Club of Kemptville has received a Rotary International Presidential Citation. The citation recognizes achievements related to membership development and contribution to The Rotary Foundation. 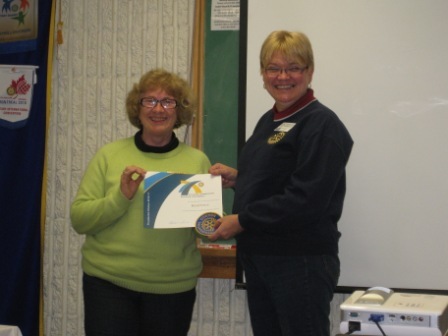 The citation was presented by Past District Governor Katie Burke to Past President Jennifer Franssen. The Youth Centre is looking for volunteers to assist with some of their October programmes. 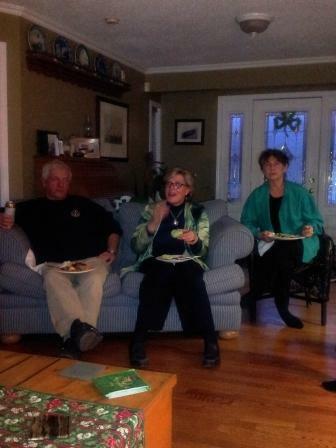 The Kemptville Rotary Wine Fellowship met on May 27th at the home of PDG George and Norma Fisher. The theme for the evening was Italian Whites . 20 members of the club plus their guests attended the event. The winner of the Rotary hand blown glass wine stopper was Bruce Wehlau who was to only participant to correctly identify all four wines. We will be taking a break over the summer. The next event will be held in the Fall where the theme will be Chilean Reds. 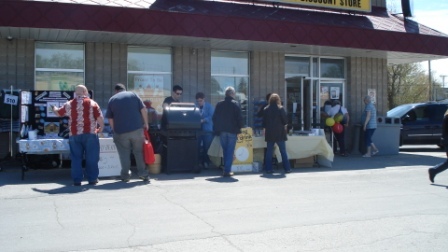 Members of the Club held a Pancake Breakfast at the B&H parking lot on Saturday May 28th. The event raised $615.00 for community projects. Thanks to Jim Beveridge of B&H for his family's continued support of this event as well as to all of those volunteers who worked the event. 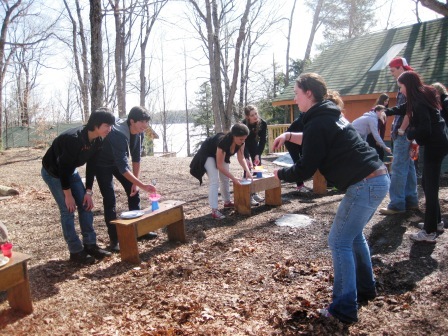 The District's youth exchange students recently had their annual Spring Retreat at the RKY camp north of Kingston. The camp was attended by our current inbound and returning students as well as the students who will be going out in August. The camp affords the students from all three cohorts the ability to interact and learn from each other, build better friendships, and help to breakdown cultural and religious barriers. The aim of the programme is to build peace one student at a time. 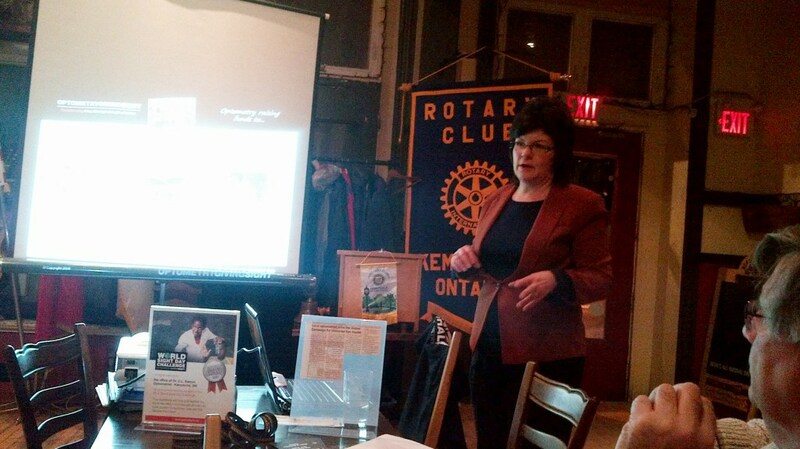 Tonight’s speaker was Carrie Smith of the Kemptville Physiotherapy Centre. Carrie has been in Kemptville since 1994 and in that time, her practice has moved 4 times due to expansion. The current centre now exceeds 4000 square feet. 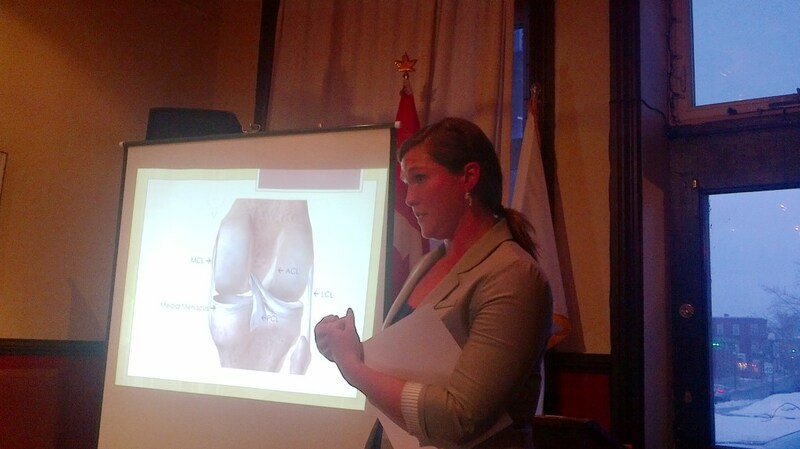 During her talk, Carrie described what physiotherapists do and the types of treatments they offer. 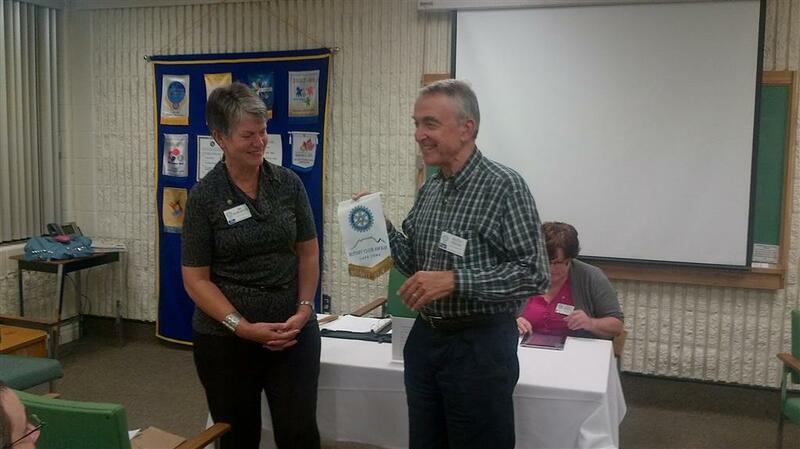 Dr. Katie Weststrate (left) receives a token of thanks from Rotarian Michael Goss. Katie is a naturopathic doctor, practicing in Merrickville, who has recently returned to the area where she grew up. 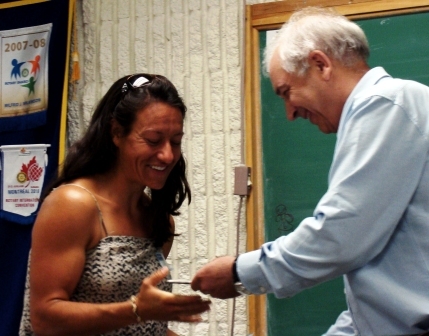 She spoke to the Kemptville Rotary Club about the principles of natural medicine as a complement to conventional medicine rather than its opposite. She believes the most important thing to remember is to listen to your body. 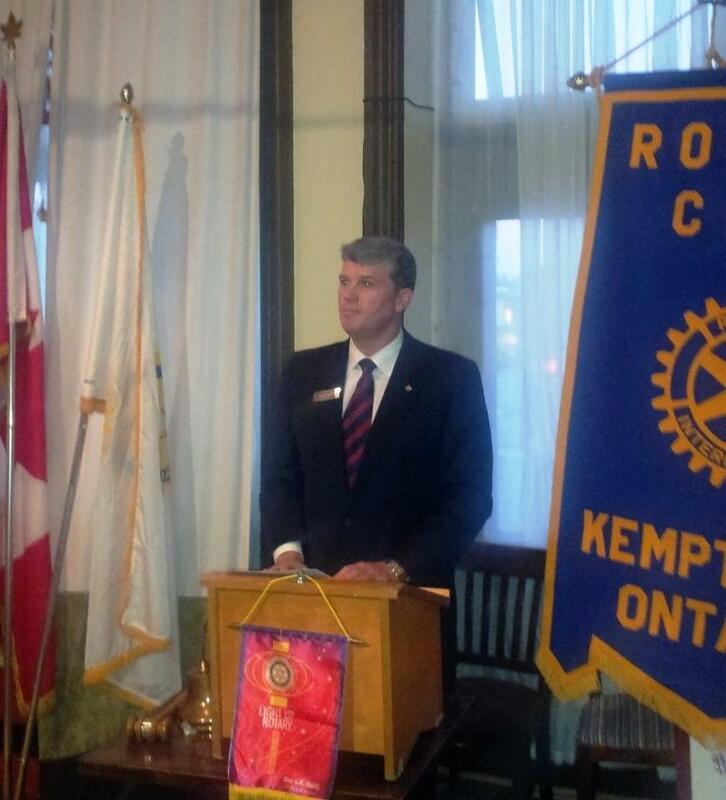 David Mayberry (shown above) was the guest speaker at the Kemptville Rotary Club Meeting on July 24. Mayberry is the Ontario representative of the World Foodgrains Bank, the world’s largest non-governmental food aid organization. Its fifteen board members representing 32 Christian denominations across the country. In addition to providing food when needed (Give a man a fish.) it also works to improve food security (Teach a man to fish.) and promotes food justice (Ensure he has access to the pond.). 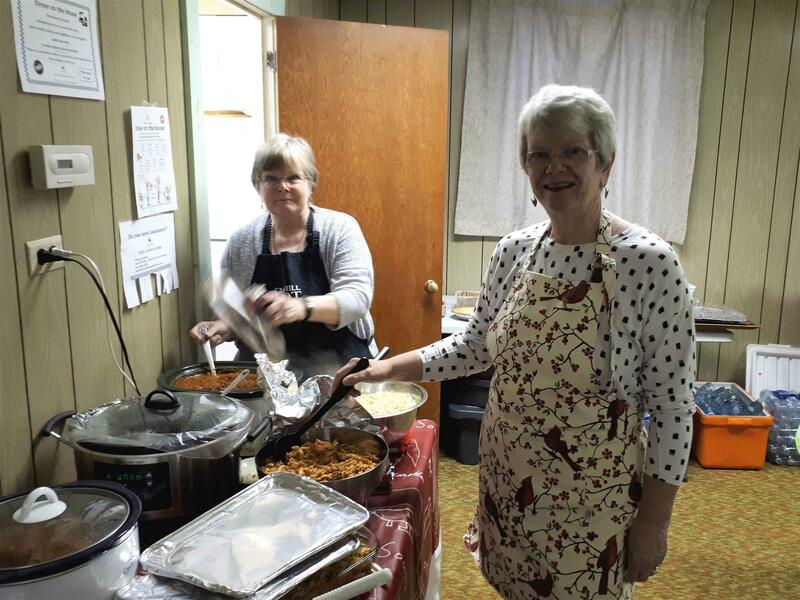 The Bank has 20 projects in Ontario raising money and crops to feed the world’s hungry, including one at St. John’s United Church, in Kemptville. The Strawberry Tarts were the winners in the non-commercial category in the Rotary Canada Day Parade. Here they are receiving their plaque. The Red Hat Society is the largest social organization in the world. Its members are women “of a certain age” who seek fun, friendship and freedom from society’s expectations of older women. Members wear red hats and purple clothes when on an outing, and spread good will wherever they go. 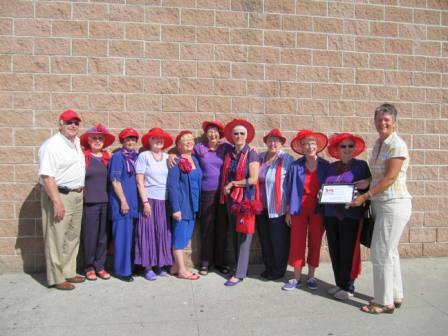 The Strawberry Tarts of Kemptville is a registered chapter of the Red Hat Society. Hazel Brayman, Queen of Tarts and the fourteen Royal Ladies, Eva Francoeur, Carol Armitage, Isabel Ayers, Diane Boyce, Barb Breau, Ghislaine Crozier, Gail Darch, Ellen Leach, Judy McGregor, Donna Mills, Donna Ross, Joan Scharf, Esther Tarr and Daphne Stephenson enjoy a special bond of friendship. These ladies say participating in the Rotary Canada Day parade was great fun, especially with Harry Pratt providing the horsepower and music. Ben Vorano has been inducted as the newest member of our Club. 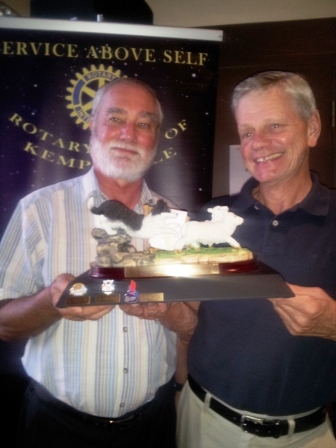 His sponsor is Rotarian Don Gilchrist and his mentor will be Rotarian John Wilson. Several members of the club took part in the annual Santa Claus parade to collect food for our local food banks. 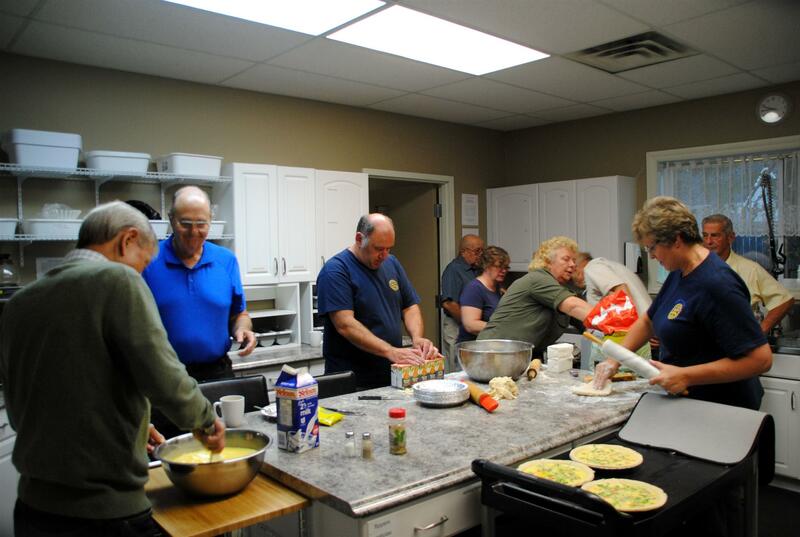 In mid July the Rotary Club of Kemptville prepares a pancake breakfast to be served before the annual church service that is held at the Burritt's Rapids Lock. There is always team work required to get everything done before the customers arrive. 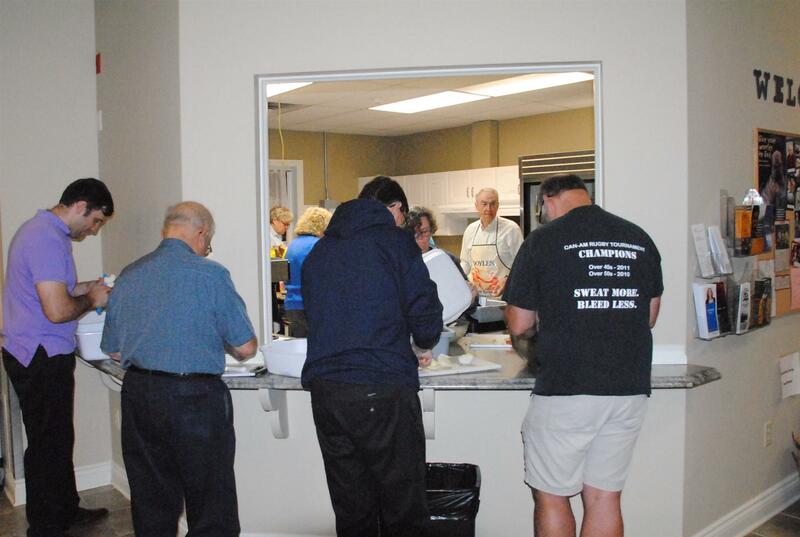 Below Rotarians Larry, Cora and John make final preparations before serving breakfast . Eric Connell provided a review of what 4H is all about. He noted the program is always looking for volunteers. He explained what 4H has done for him, reviewing the opportunities he has had since joining. The Rotary Club of Kemptville is holding its 3rd Annual Rideau River Rally on Sunday, July 17th. This event which is an amazing race and scavenger hunt, is in support of the Club's commitment to the Kemptville Youth Centre. The event will begin at the North Grenville Municipal Centre with a staggered start from 1:00 pm to 2:30 pm. Entry fee for this event is $50.00 per car and the rally route is approximately 3 hours long. Each entry will receive 2 coupons for the post rally BBQ as well as an entry into the draw for the major prizes which includes 2 tickets in the Labatt Suite with food and refreshment for Cirque de Soleil's Michael Jackson The Immortal World Tour. Pledge sheets are available at M5 Digital and B&H Grocers.